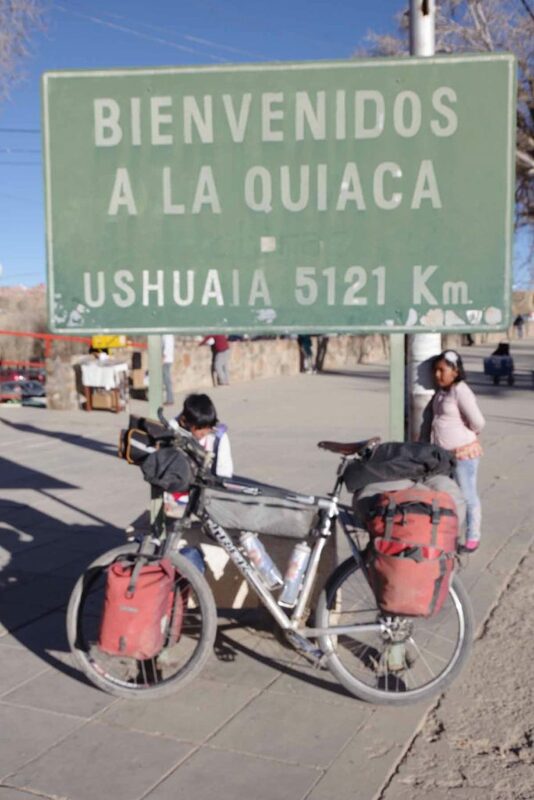 Made it to Argentina, now I just need to cycle to the other end. 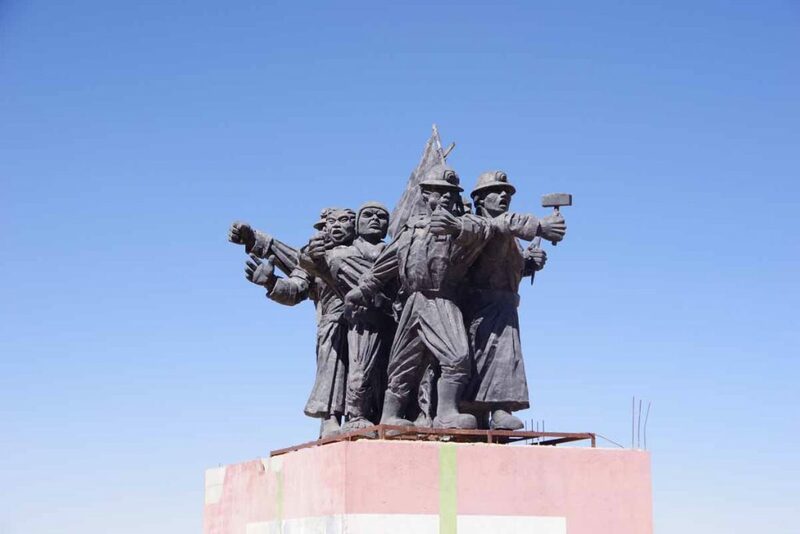 This also means I finished crossing Bolivia. 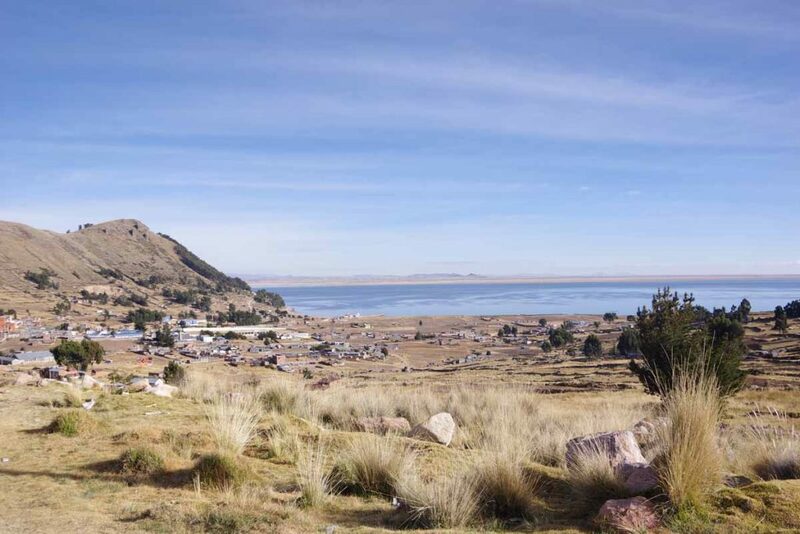 Bolivia was challenging but quite beautiful and so far my favorite Latin American country. Colombia is #2 and Honduras is #3, but we’ll see what Argentina (and Chile) brings. 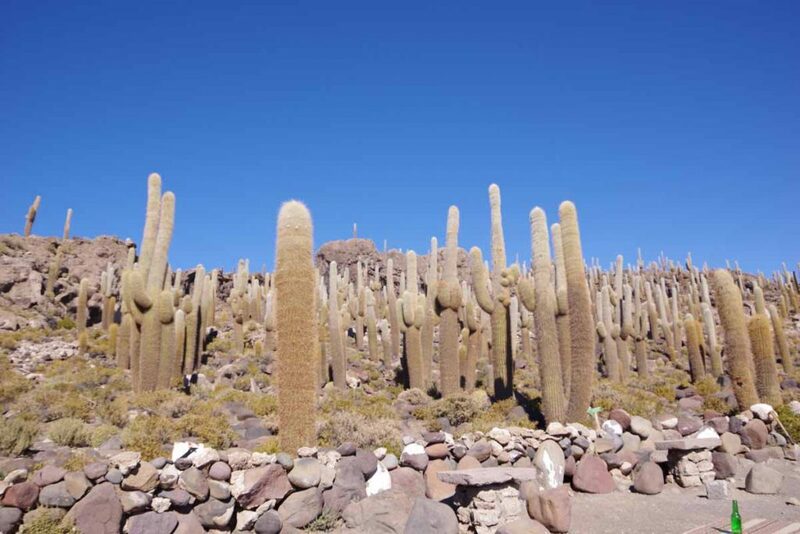 Tupiza sits in a valley and until the sun finally poked over tops of the high ridges, it was cold. I found my way past some road construction and back onto the main road. 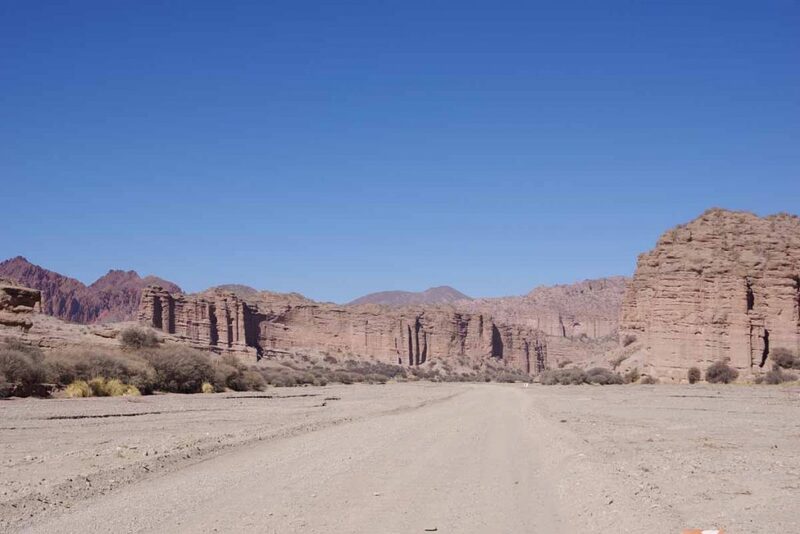 For the first 30km, the route roughly followed this valley while also crossing half a dozen small settlements. Each had a name and a sign, but there wasn’t much business to be seen. There was a tunnel as well as a small auxiliary tunnel off to the right. 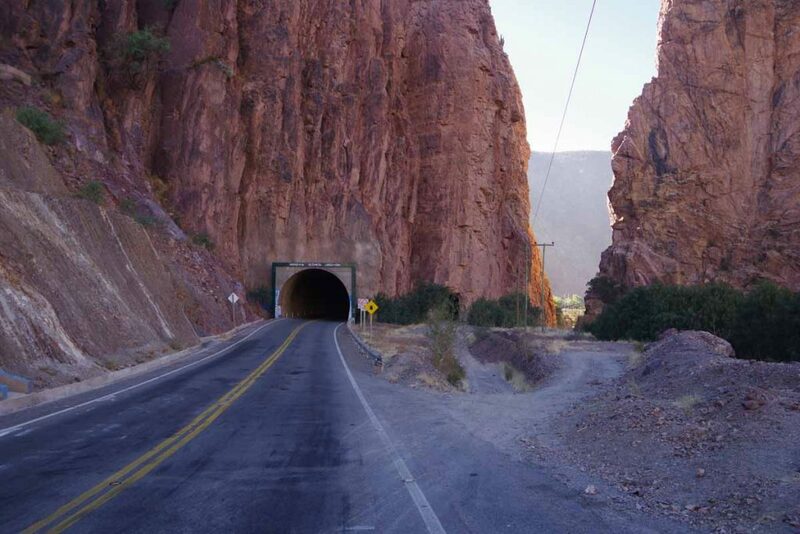 I probably could have walked through the baby tunnel, though there wasn’t any traffic and so went along the main road instead. Tire shop at one of the small towns. 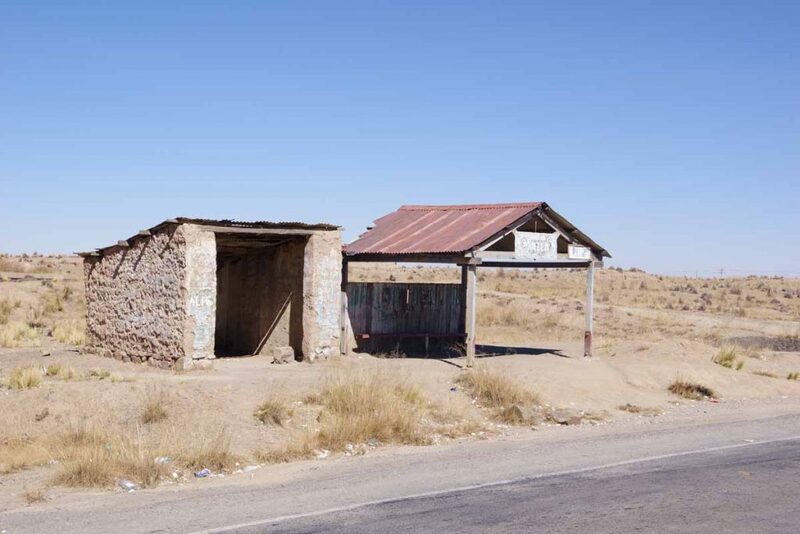 At 31km, I came past this small bus stop. More importantly, this is where the serious part of the climbing began. 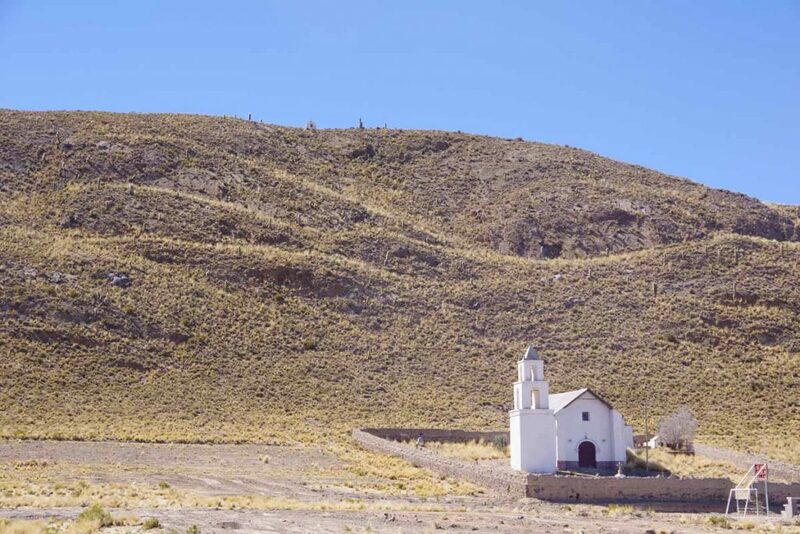 A climb of 600m/2000ft from 2800m to 3400m and back up a plateau. There were a few places with 9% grades, but overall it was a steady slow climb that never got extremely steep. The sun was out and it was north facing, so it also got warm on the climb. 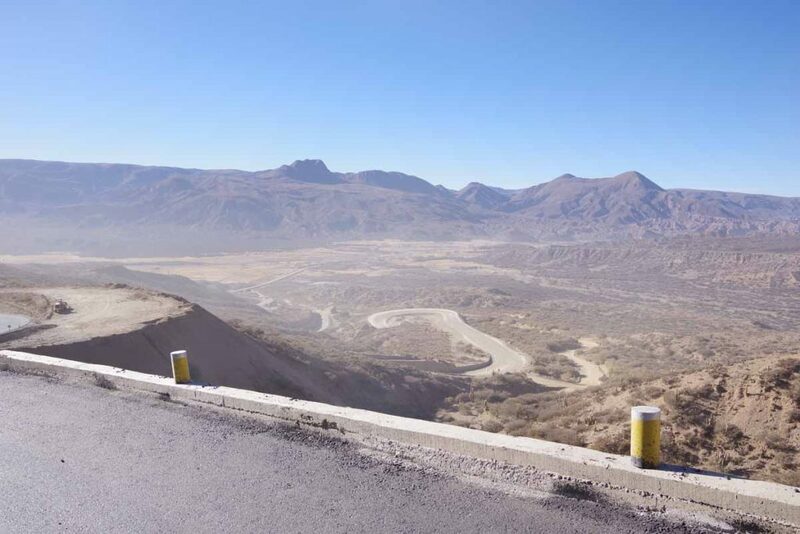 Overall today I recorded 1235m of climb, so the other parts both before and after this 15km stretch weren’t necessarily flat either. I’m not sure what this sign is prohibiting. At the top it became more open, though still some rolling hills. 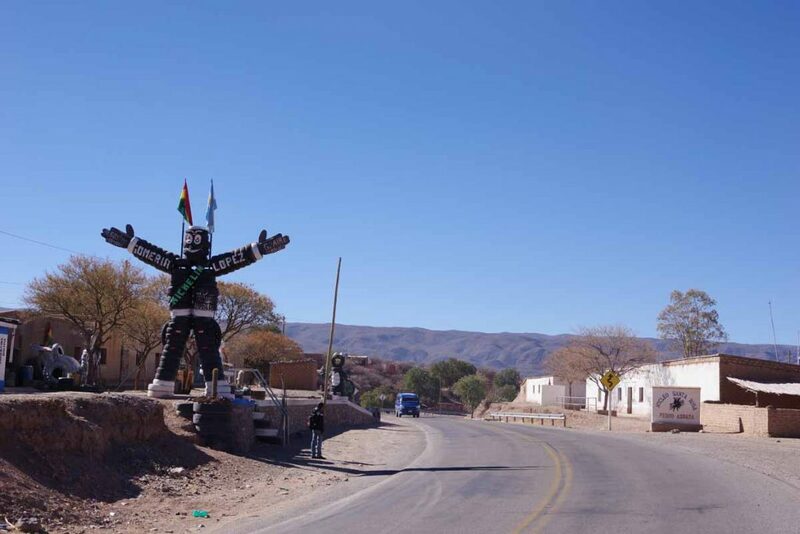 Little town of Mojo, most all of it. 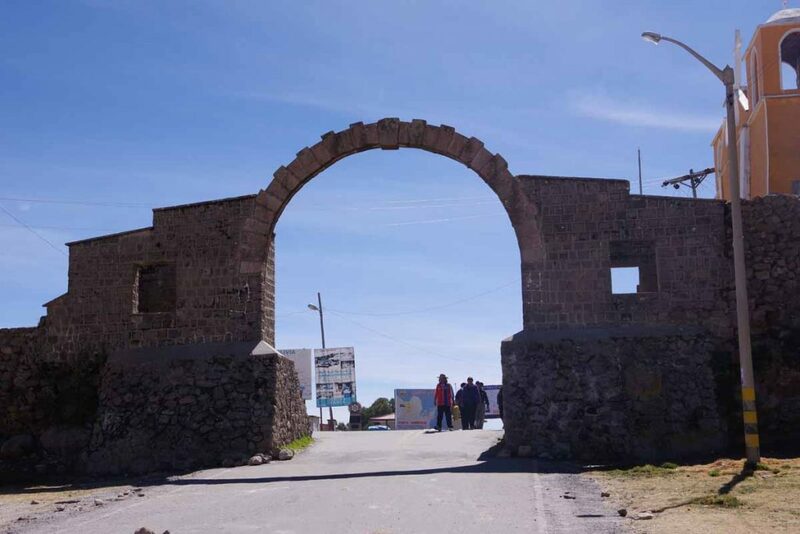 Here was the entrance arch to Villazon. 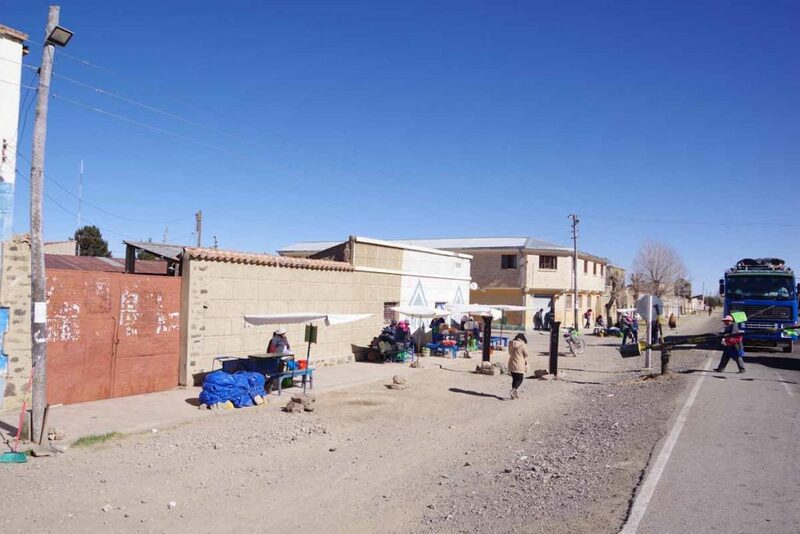 This was border town on the Bolivian side. 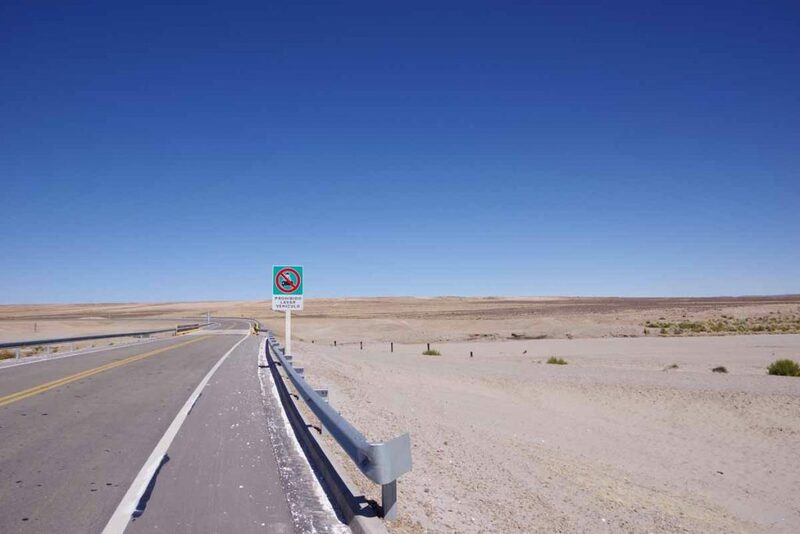 I figured I would stop if I found an inviting hotel and otherwise continue to clear the border with Argentina. 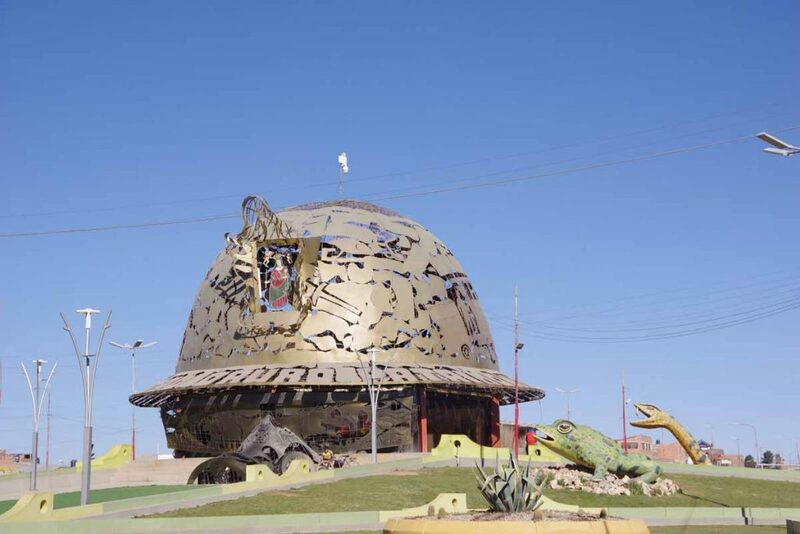 The last little bit of Bolivia. 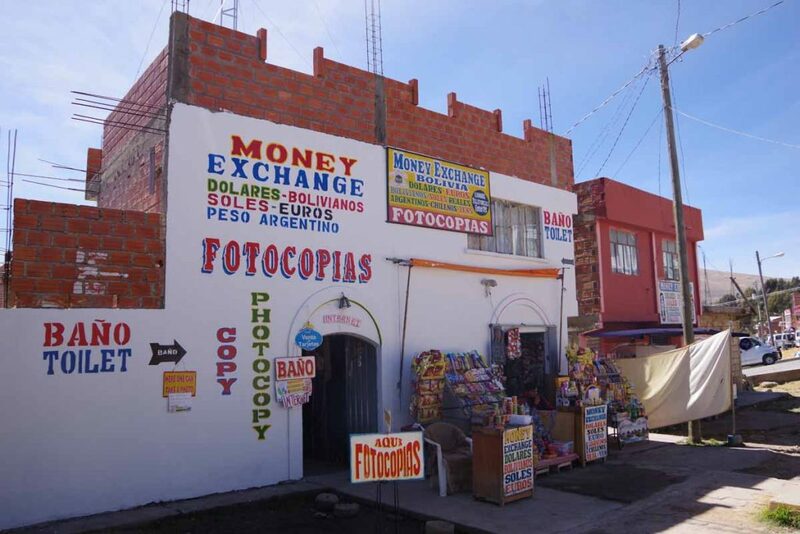 I exchanged my Bolivianos here for Argentina Pesos. Came across the little bridge and then to the immigration offices. Getting stamps in my passport was surprisingly quick. Stepped to the window from Bolivia and got stamped out. Stepped over to the Argenina side and also stamped in. The stamp gives me 90 days in the country. 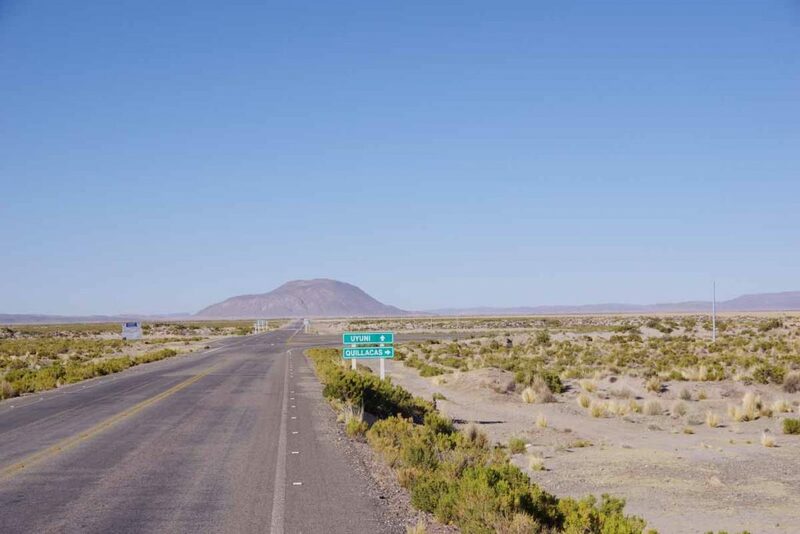 That should be sufficient to either reach Puerto Montt (Chile) or perhaps will take a short break to fly back to the US somewhere along the way and refresh on some essential items like tires. Will see. The most annoying thing about the Argentina customs came just as I was about to leave. 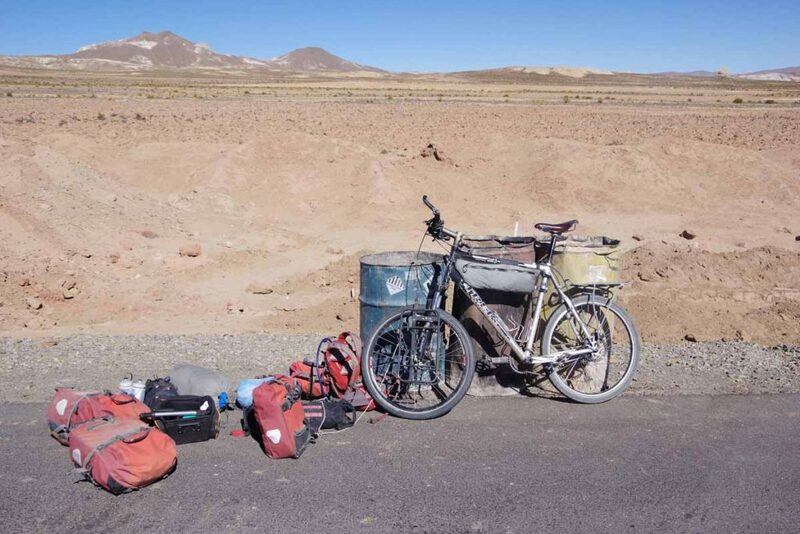 A customs officer saw my bike and decided all the panniers needed to come off and be sent through a metal scanner. This took a bit since I have things tied, partially for theft but more importantly so my heel doesn’t knock the rear panniers off and into the spokes. So a slow dissassembly and then put everything back together. 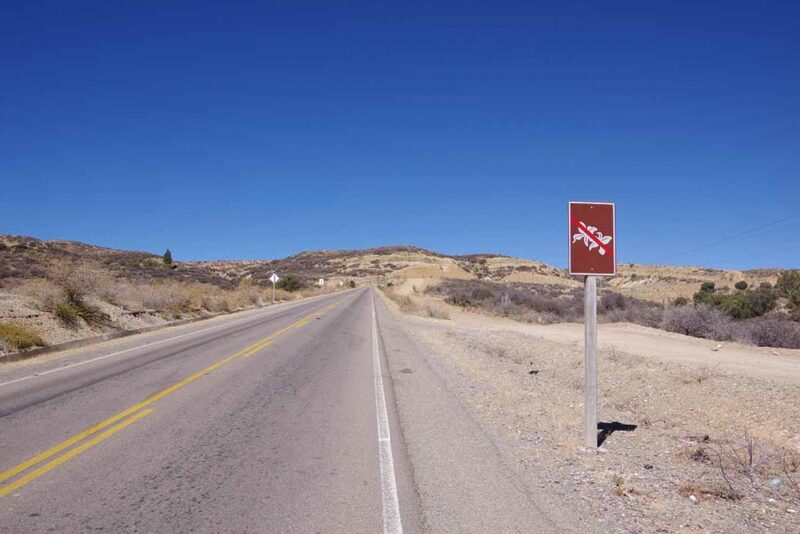 There was a sign here for Ushuaia! First one I’ve seen. Made my way into town and found a reasonable hotel (wifi extremely slow). I tried my normal arrival routine of finding a restaurant to replenish. Oops, five restaurants all closed – they don’t open until later in the evening. Will have to see how I adjust the routine. 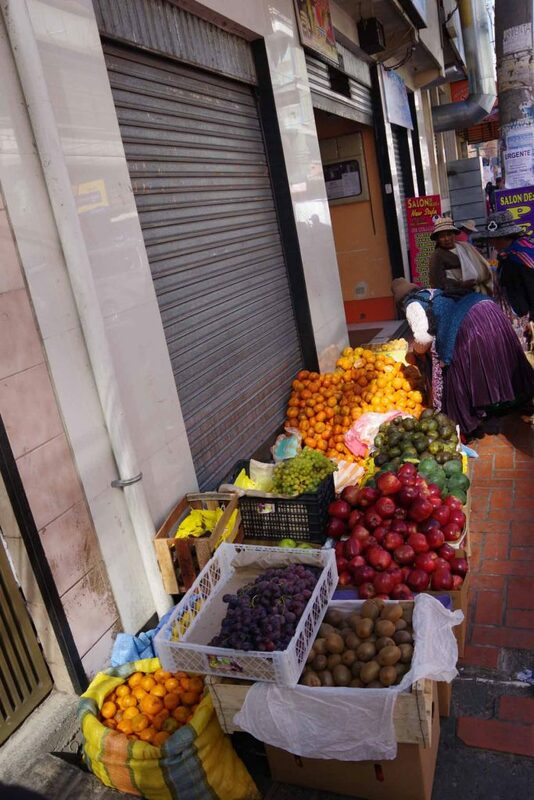 I did find a nice supermarket though (hard to find in Bolivia) and so got food there instead. 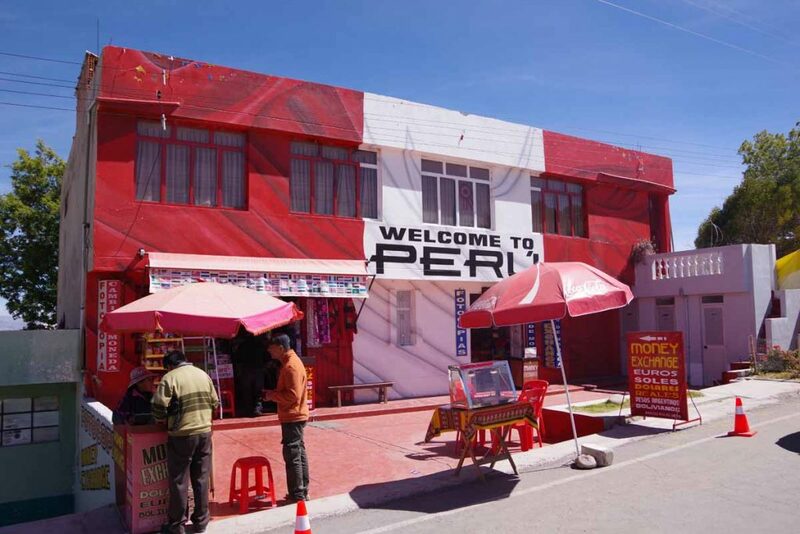 Overall, I enjoyed my trip through Bolivia. It was sometimes tough riding and often cold nights. 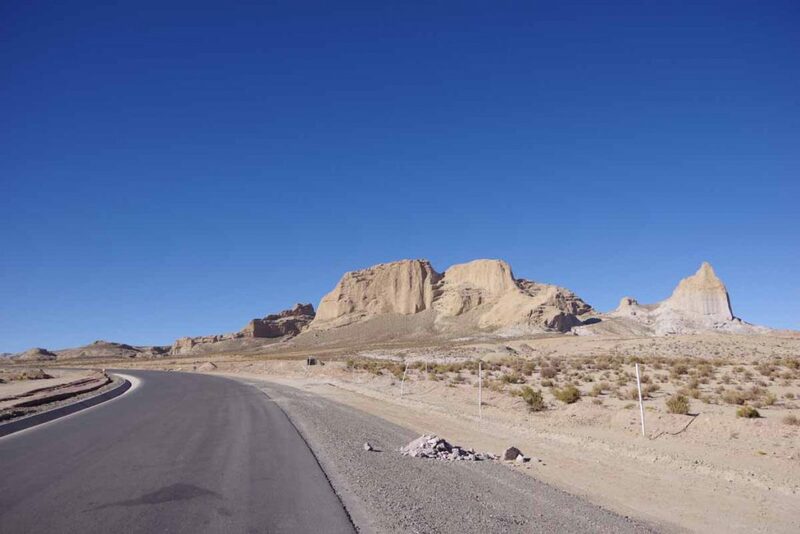 However, the scenery was spectacular and the roads before Uyuni were nice. 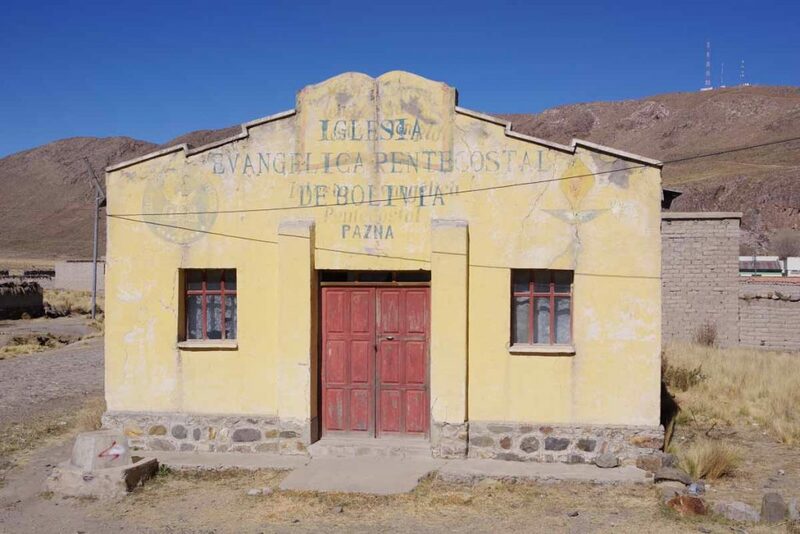 I’ve got my 10 year Bolivia visa in my passport and seems like an interesting place to come back and explore further. 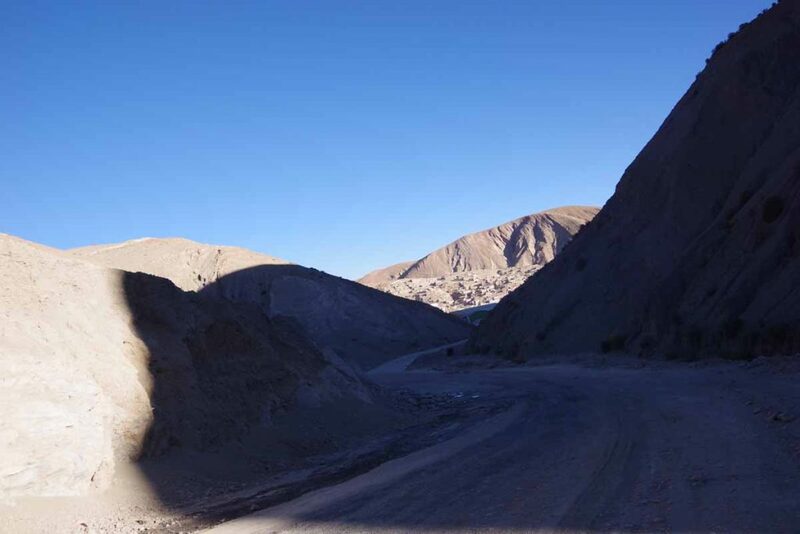 Route from here to Salta will stay high for a while and then descend. 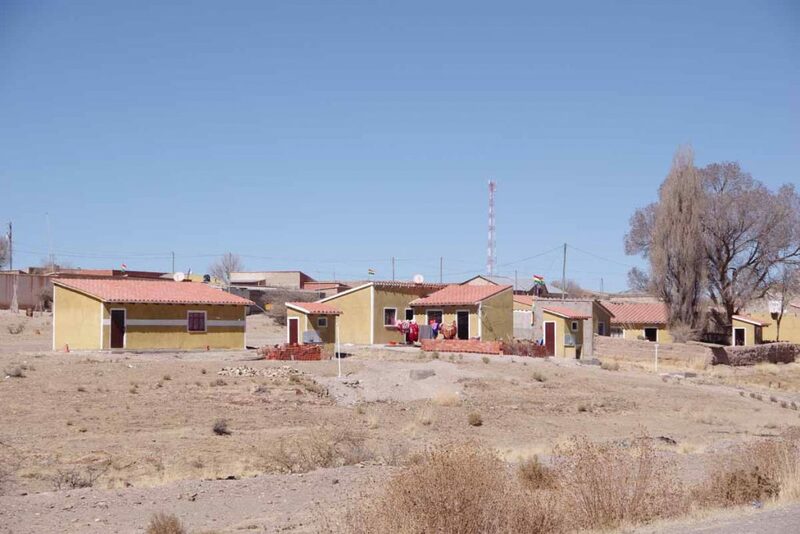 Multiple small towns, though expect wifi might be a bit of hit and miss. 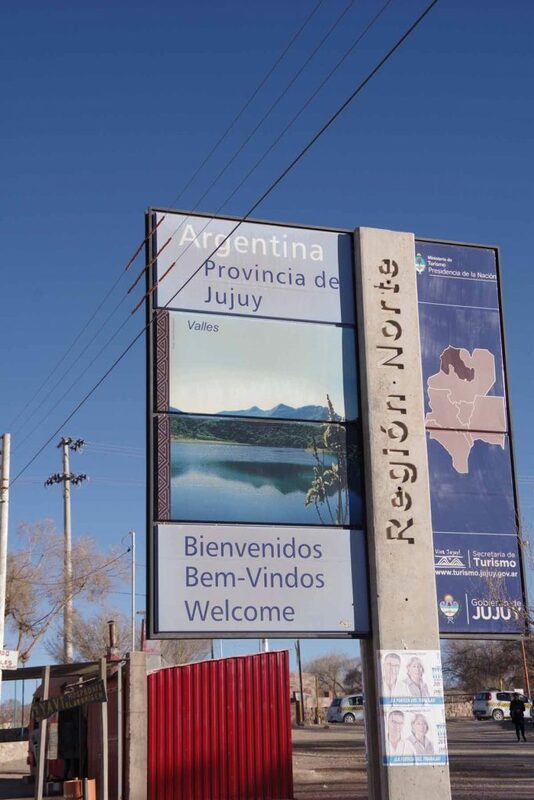 Otherwise, nice to already be in Argentina! Three days riding has brought me to Tupiza. 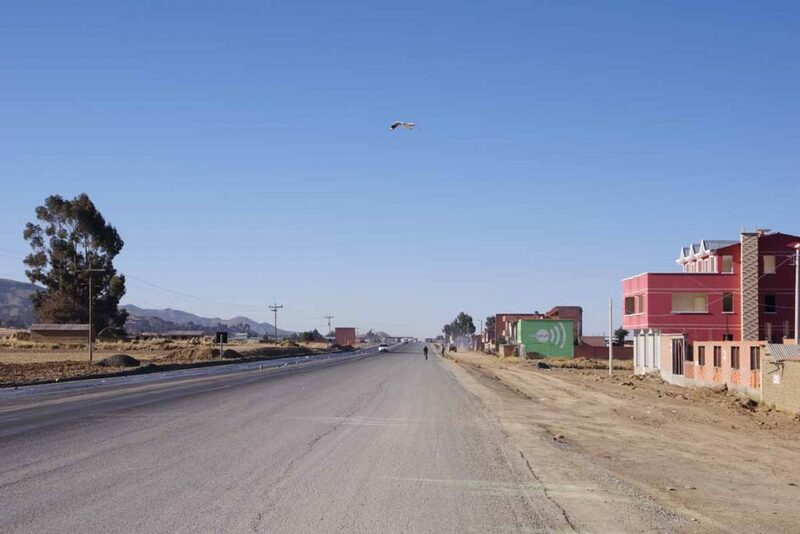 The road is rough and unimproved, though they are also busy with a massive road construction project. 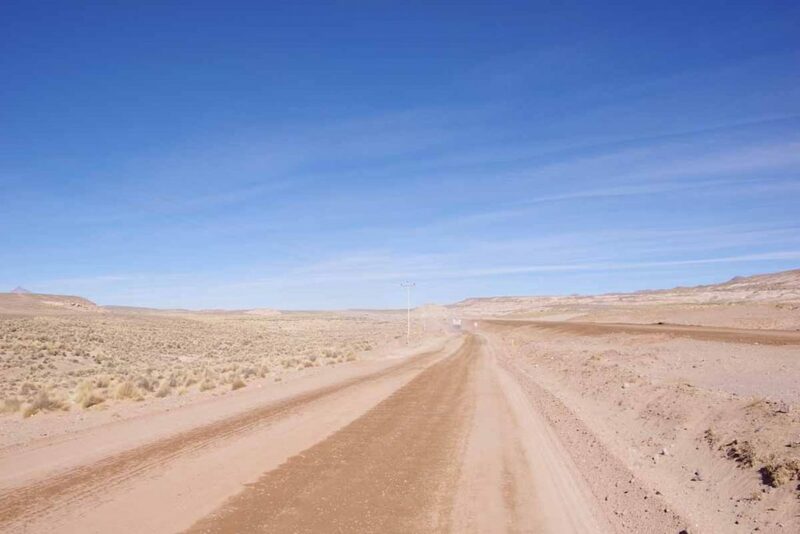 Overall, I was actually on the pavement for ~40% (80 kilometers) of the distance with the remainder varying between smooth “to be paved” segments as well as awful rutted, washboard, sandy roads. 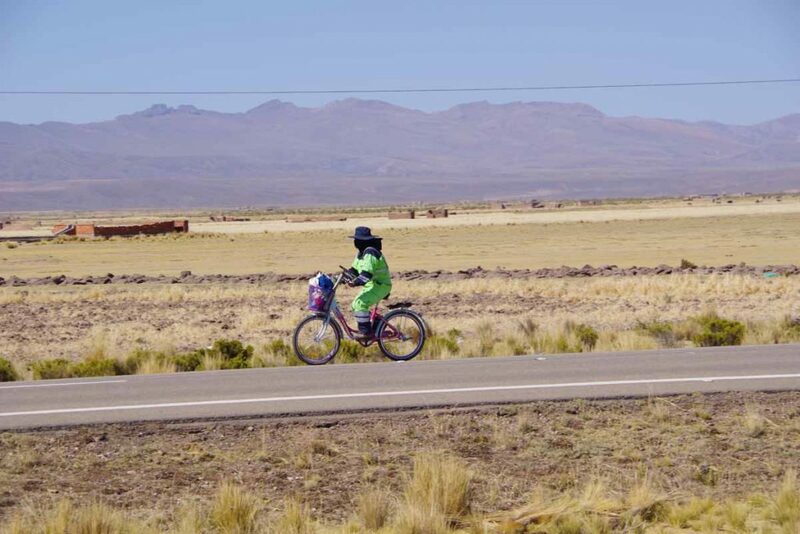 Left Uyuni after a rest day and ready to ride. 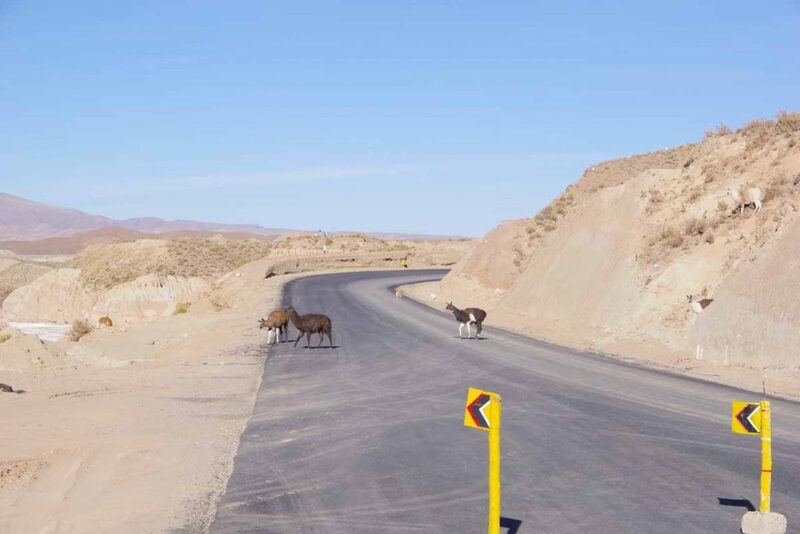 Getting out of town was bumpy but once I was out, there was 30 kilometers of newly paved road. Hooray! There were one or two diversions such as above, but I could mostly keep straight. 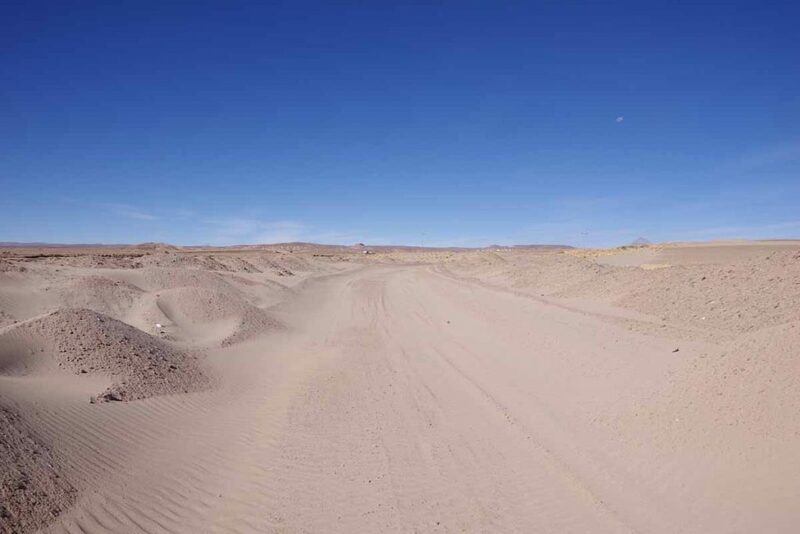 At 32km there was a big split with still new pavement ahead and a sandy track splitting off to the right. 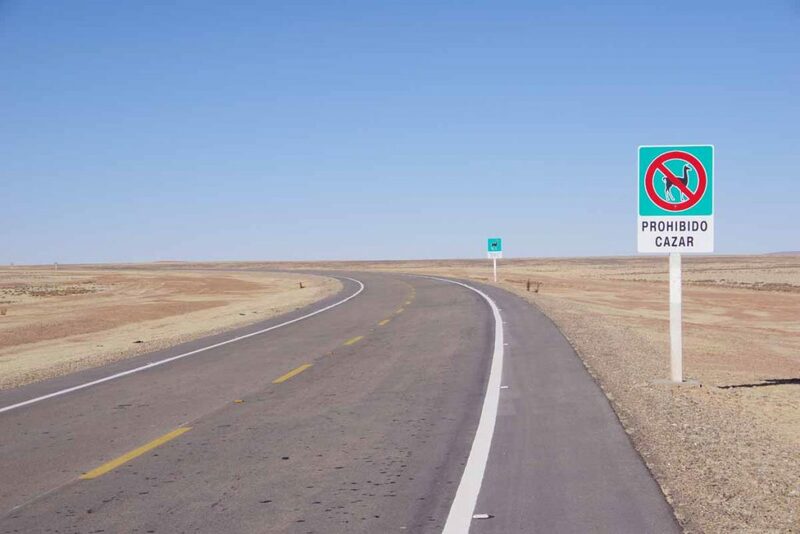 One blogger had cut through the left road, but I decided to follow the rules and take the signs on the official bypass. 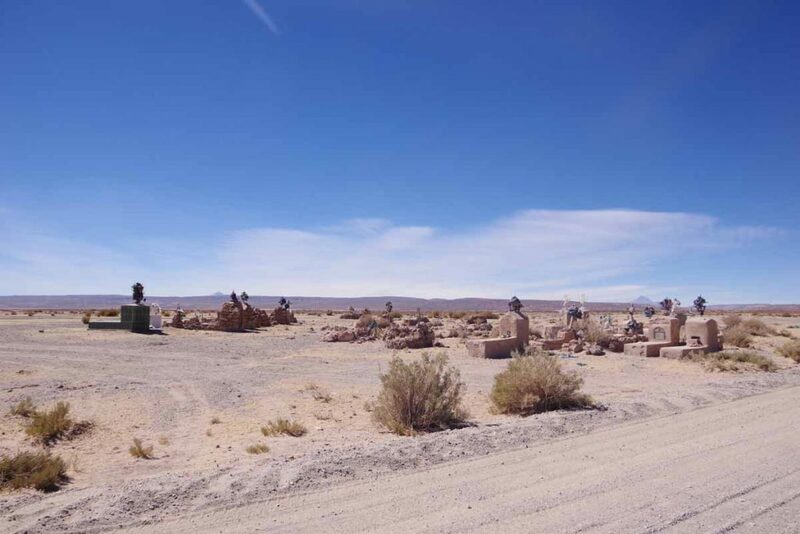 A small cemetery I passed. 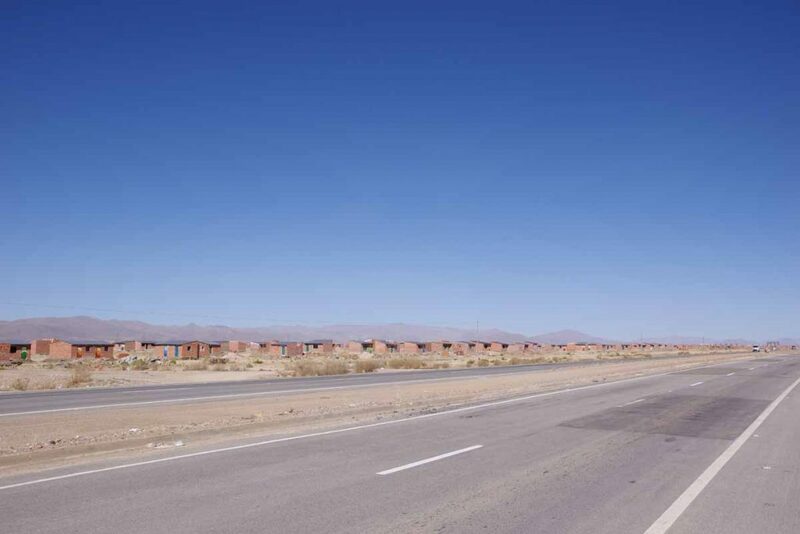 At 55km was this small settlement. 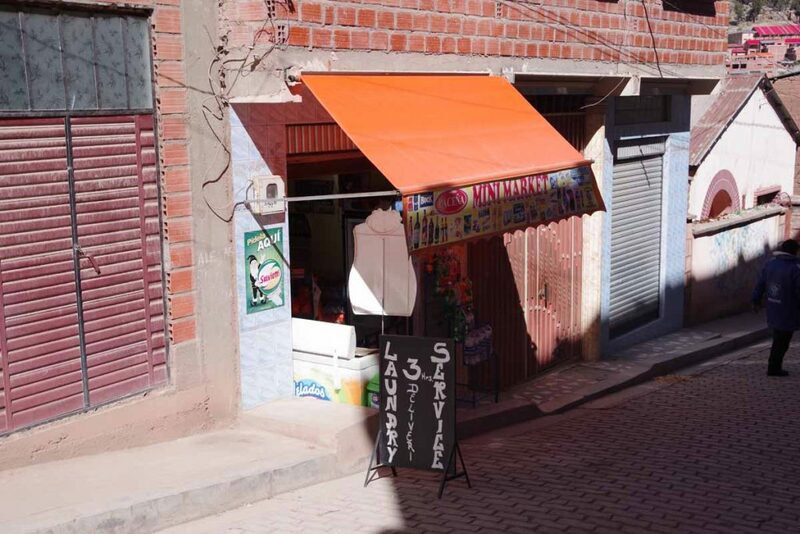 No actual stores or businesses but a cluster of small brick buildings to keep out the worst of the cold. Just as I passed, felt my rear tire was soft. Sheltered from the wind, I took everything apart and then found the problem (small wire) and fixed the tube. 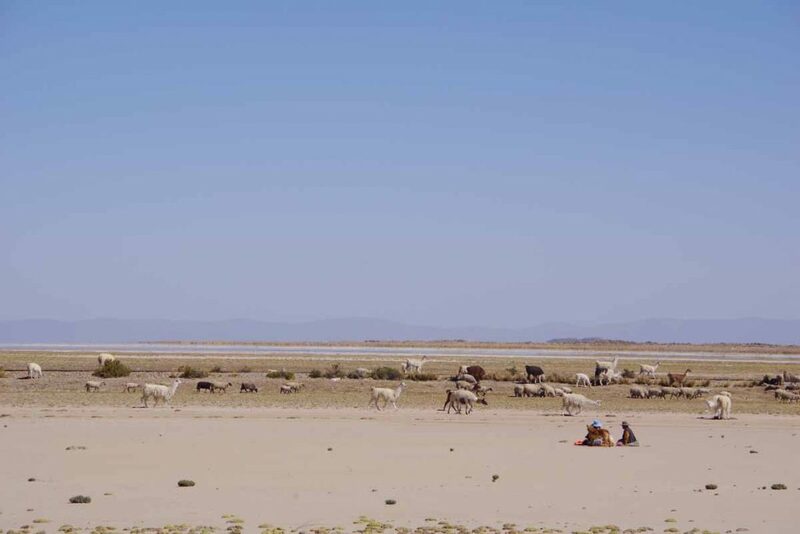 Wide open spaces with an occasional llama herd. Unfortunately it became sandy for a kilometer or two. I mostly pushed my bike through this section. 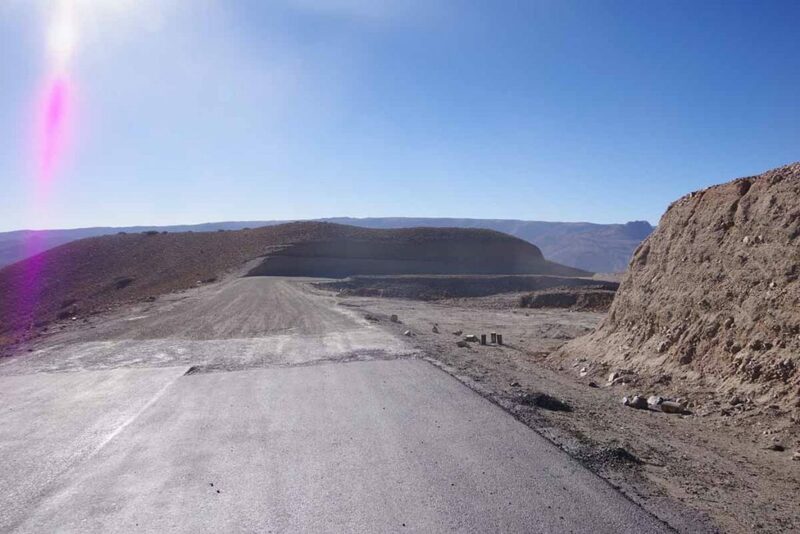 This was a section of road construction with the new road to the right and a bypass road on the left. 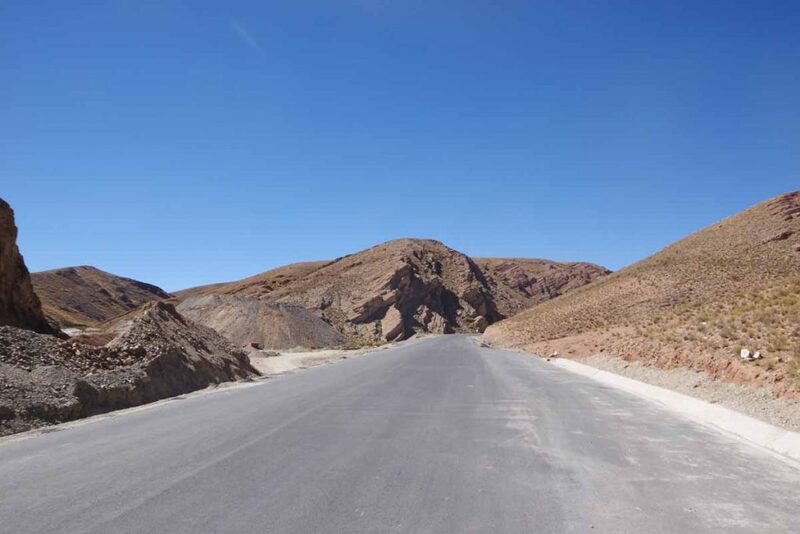 These bypass roads were of varying condition. Construction workers pouring concrete for a culvert. The last 10km to Atocha were actually pavement again. Also several steep hills with one approaching 10%. Made it to town past 5pm as the sun was already low on the horizon and the town was mostly in the shadows. 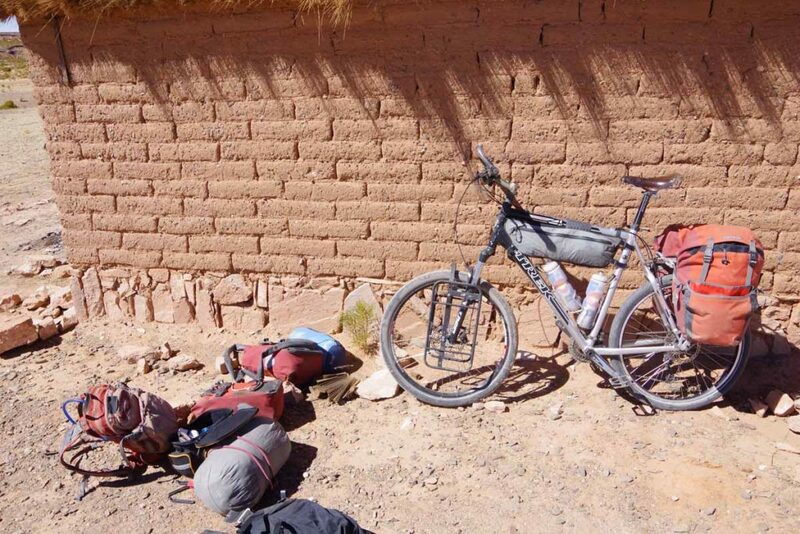 Found a basic hotel where the room had just enough space for a bed as well as my bicycle. It had been a long 100km day with 60km of gravel, but also nice to find a place inside where the room would be just slightly warmer than camping. This was a tough day. Only 63km, but more than 1300m of climbing and a moderate amount of gravel roads. It was cold leaving Atocha. My cycle computer told me -6.5C (20F) as I came up a sharp little ravine leaving town. You can see Atocha in the distance. Here was the climb heading up. As I got to the top, there was a beautiful wide open landscape. 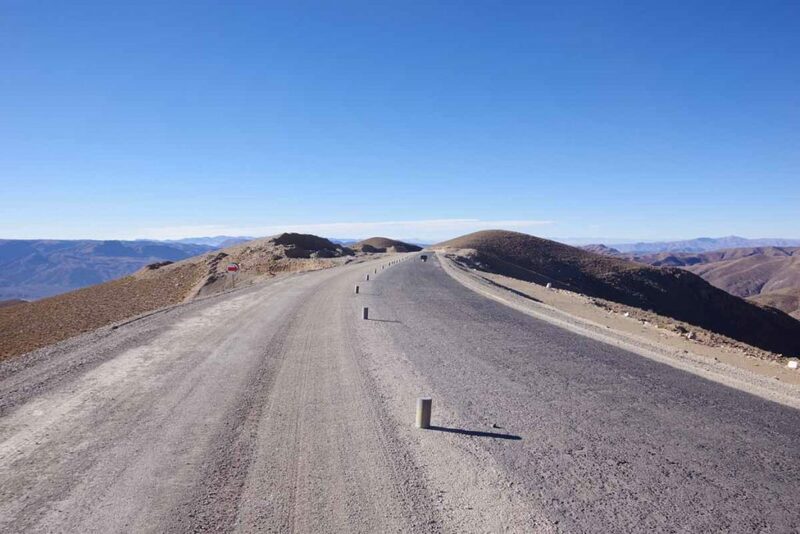 At 3km the road became paved. It was still steep at times. It also became warmer with the sun. 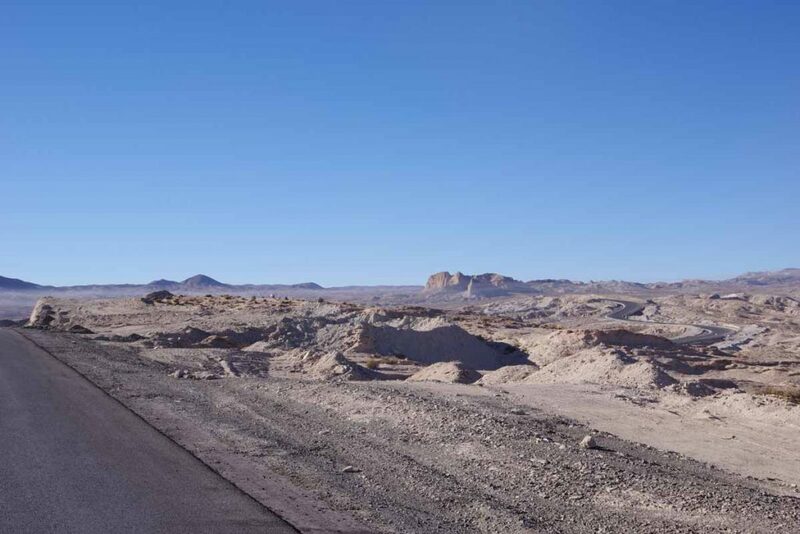 Wonderful landscapes along the way. I had forgotten to fill my water, so found a small store at 13km and bought some water to top things off. At 13km my front tire was flat. Another small wire. These barrels were handy to lean everything against. Inside the water was still frozen. It was a much hillier ride today. At 38km the pavement stopped. 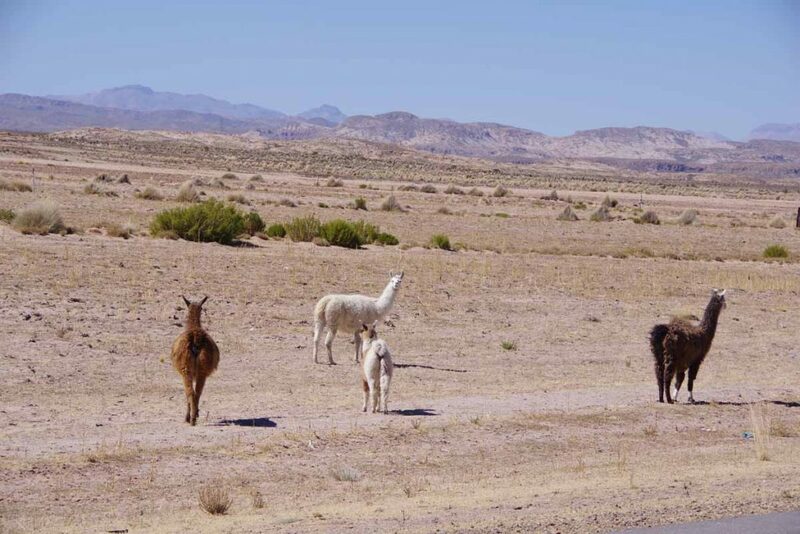 The only photo I took all afternoon was of these llamas. However, it was a slow grind cycling. There were a few steep gravel hills where I found it easier to walk my bike than ride. 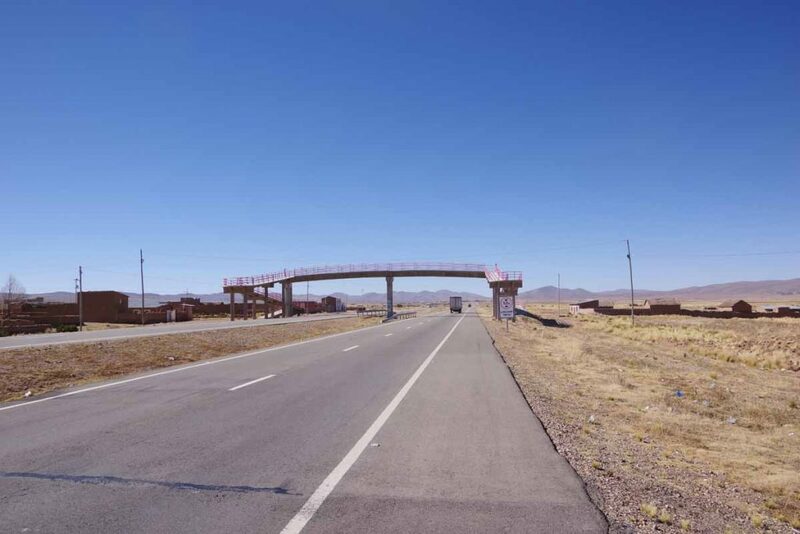 I would also occasionally try the new road even when it was closed. Sometimes this worked well but on at least one occasion I found myself lifting my bike up and over a closed up berm. I kept going until 5pm and by then was tired and spent. 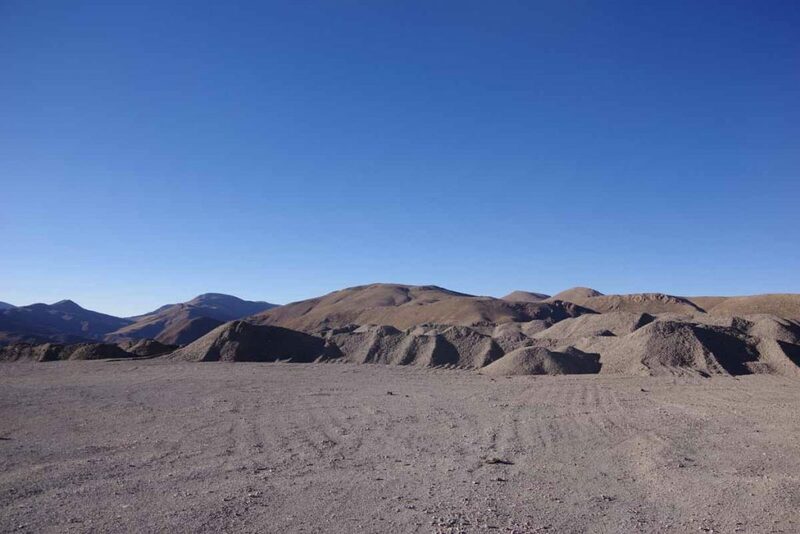 I saw this gravel dump on the left side and found a space behind it to camp out of view of the traffic. I was at 4000m (13,200ft) and expected a cold evening. Suprisingly warm last night. My water bottles didn’t freeze and am fairly certain it stayed above freezing all night. The sun came out and quickly warmed things up. Only drawback was that my rear tire was soft again. I couldn’t find the hole, but did end up swapping in a new tube. The first 15km were sharply downhill as I descended 800m/2500ft to the valley below. The road was surprisingly good. 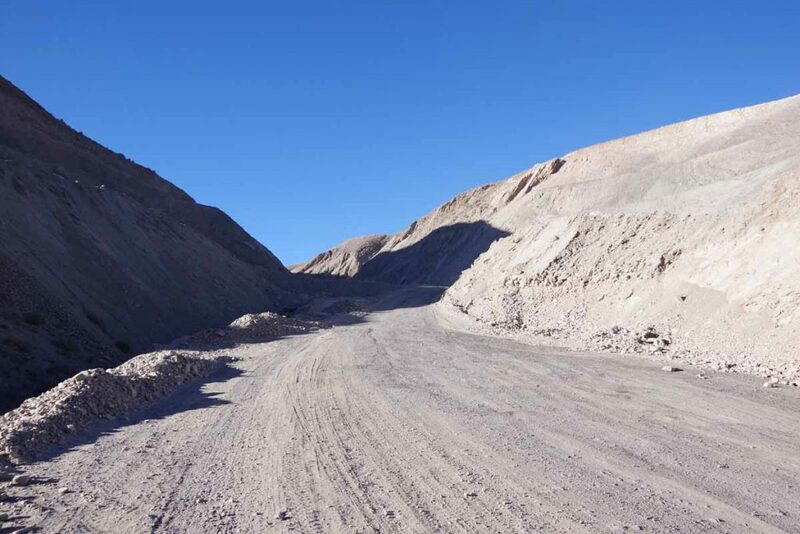 Sections were graded like this one and even a short stretch was paved. I perhaps could have ridden it the previous day, though didn’t know that. Also from the icy puddles in the valley, suspect my high camp was warmer than in the valley. The short section of pavement ended. A view of the last little bit in the valley. 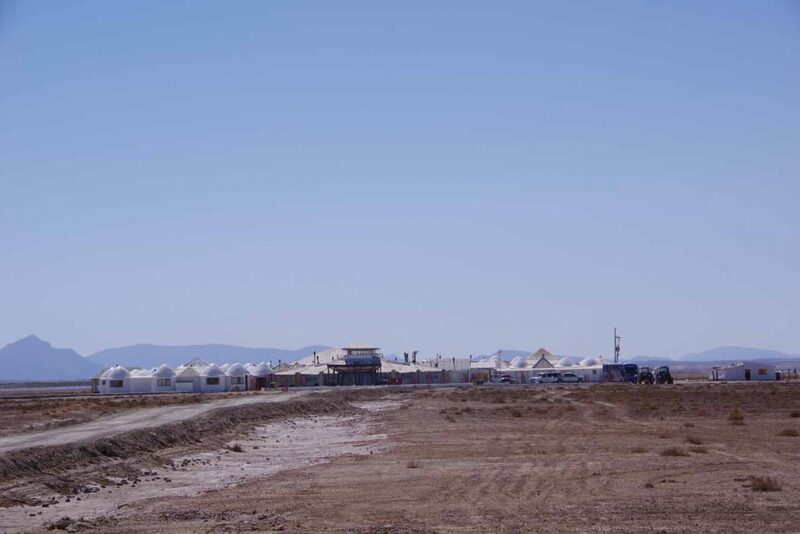 Once I was in the valley, the new road was being constructed off to the side. 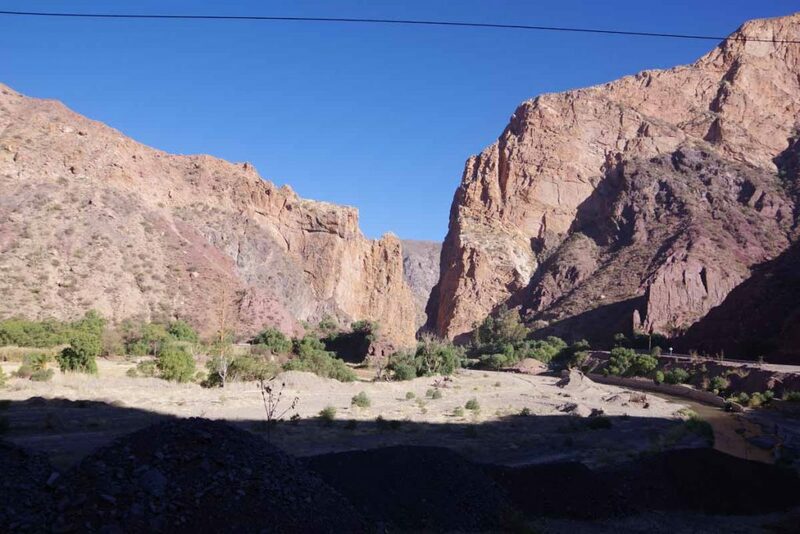 Instead, the bypass road was graded in the bottom of the canyon itself. Some sections were smooth but a lot of it was a washboard mess. Coming through one of the canyon sections. Waiting for traffic to clear. 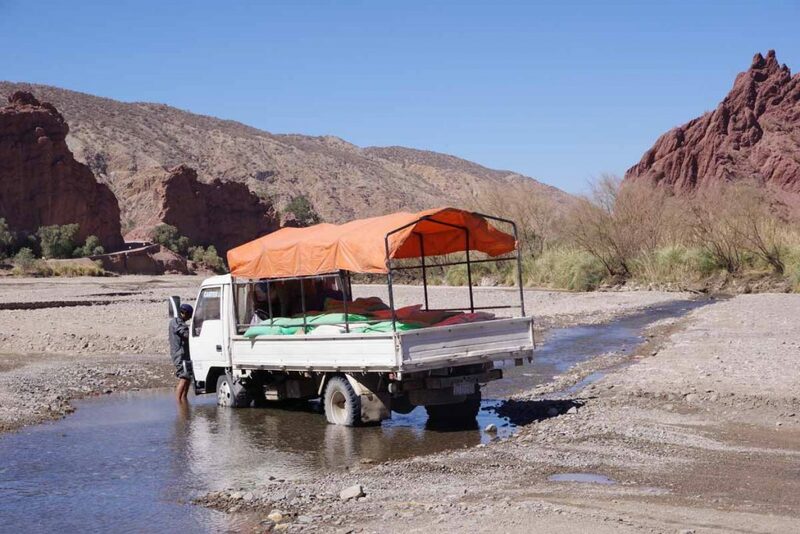 These guys were using the stream to wash their truck. The road itself crossed the stream half a dozen times. 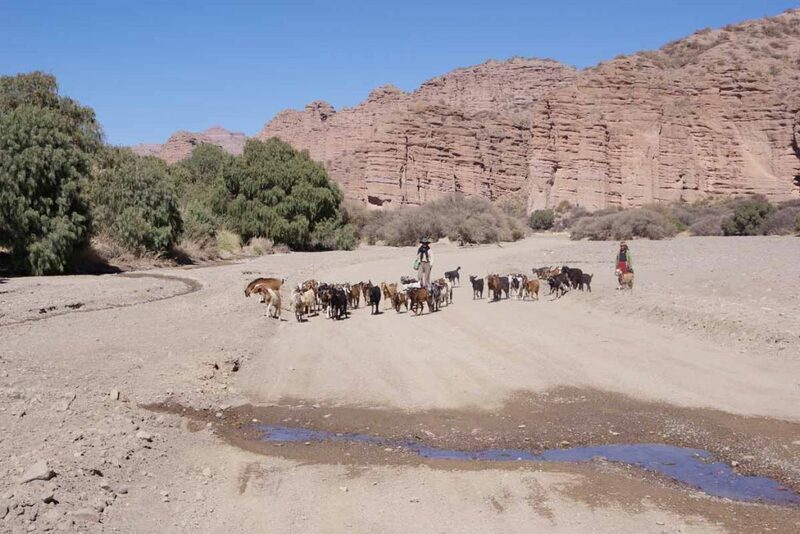 As a temporary road, there weren’t bridges. The stream was just wide enough and big enough that I would end up with wet feet, though not so high that my front panniers had troubles. Finally made it to Tupiza. Nice to get into this more touristy town as well as be back to reliable pavement again. My rear tire was soft again, so patched that this afternoon. Not sure why I’m having as many issues with flats, but will see what happens on pavement from here. 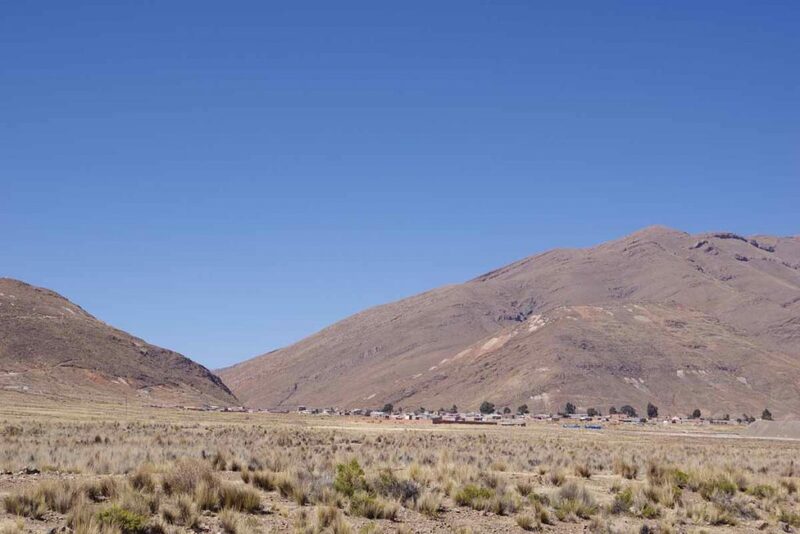 Tupiza is at 2850m/9350ft so just a bit warmer. This area was last known place for Bonnie and Clyde and otherwise the area is known for hiking. 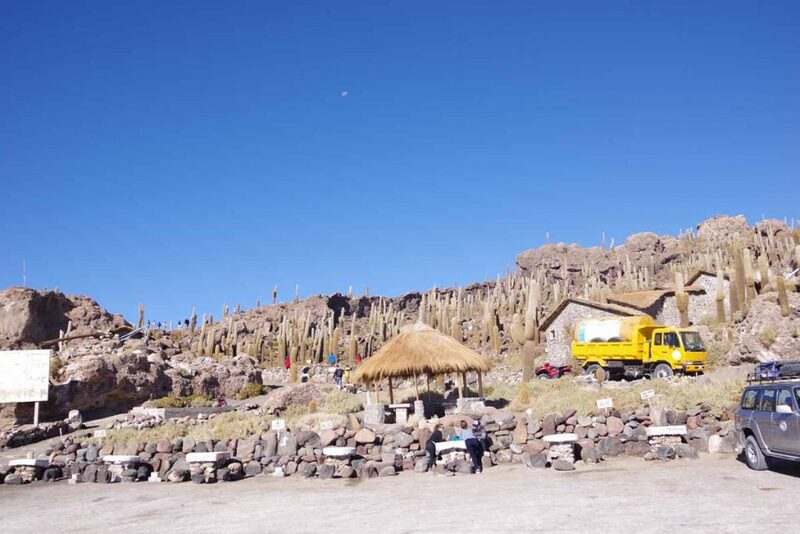 A day to be a tourist and take a trip back to the Salar de Uyuni. This was an organized trip with six tourists and driver. 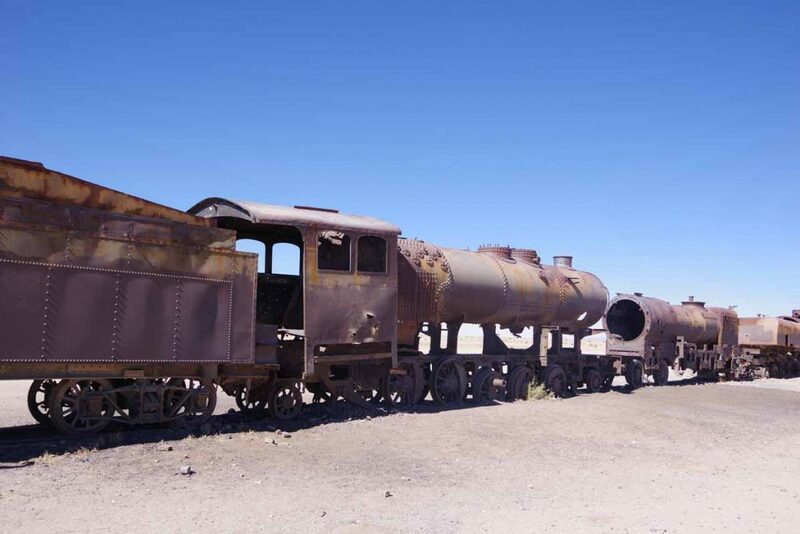 We first went to the nearby train museum just outside Uyuni. A lot of older locomotives and rolling stock dating back to 1900. 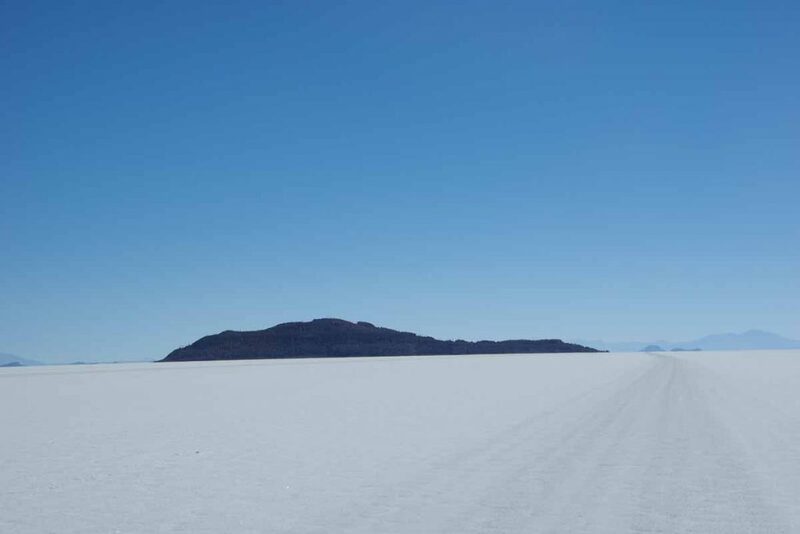 We then drove back out onto the salt flats. There were some interesting springs bubbling up on one section. Between December and April this is mostly a salt lake. It then dries up except for a few smaller areas and forms a hard packed surface. 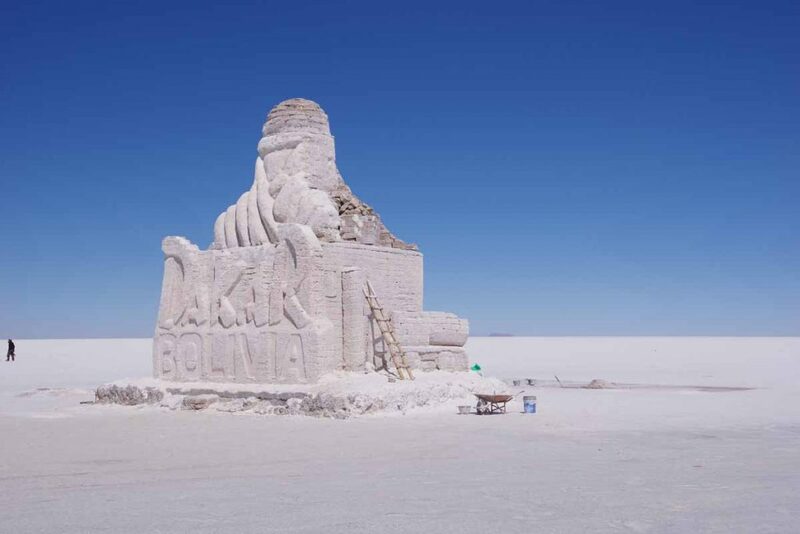 We drove several kilometers out to nearby salt hotel where we also found this monument. 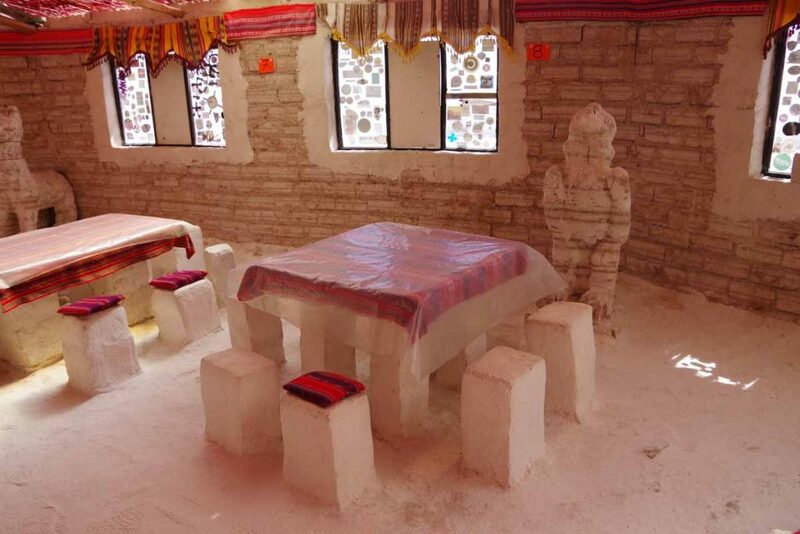 The salt hotel looked like this with all the walls and most interiors made of salt. The roof was corregated steel. We had lunch inside at one of these tables. Outside the wind was stiffly blowing. We then drove for a long time until an island appeared on the horizon. Several buildings as well as a trail that led to the top of the hill. As well as great views. Some more views of the salt. 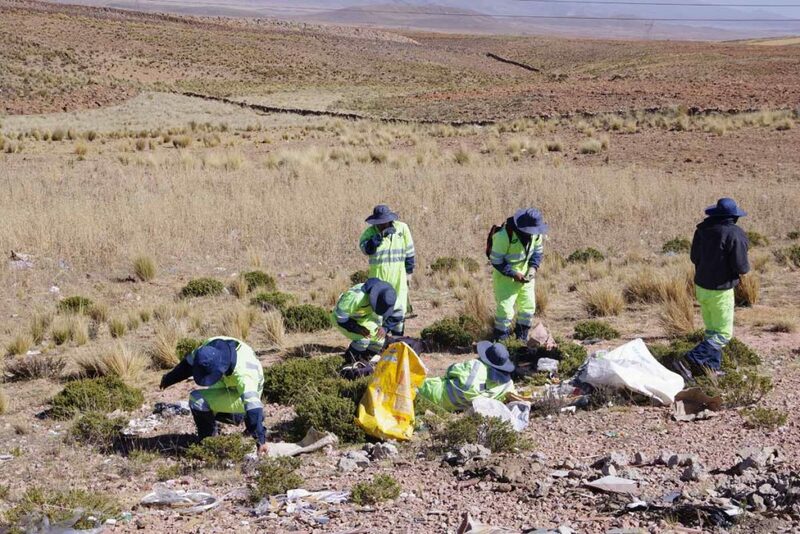 There are tracks that vehicles have left and these can generally be followed to the various destinations even when they are still over the horizon. A close up of some of the salt crystals. Overall, a nice visit back to the salt flats and driving a good portion gave a good impression of the overall scale. Definitely, a highlight to visit again. 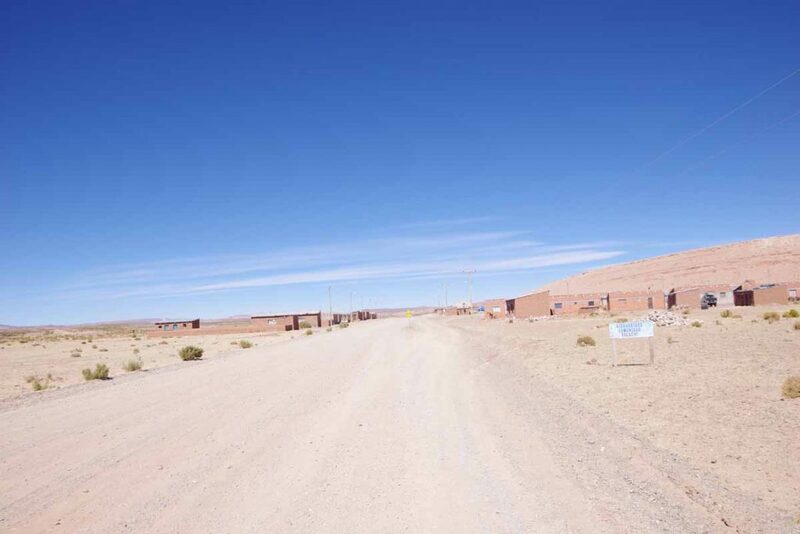 From here the next 200km to Tupiza is a rough unpaved road with exception of a few small areas they have just started to pave. 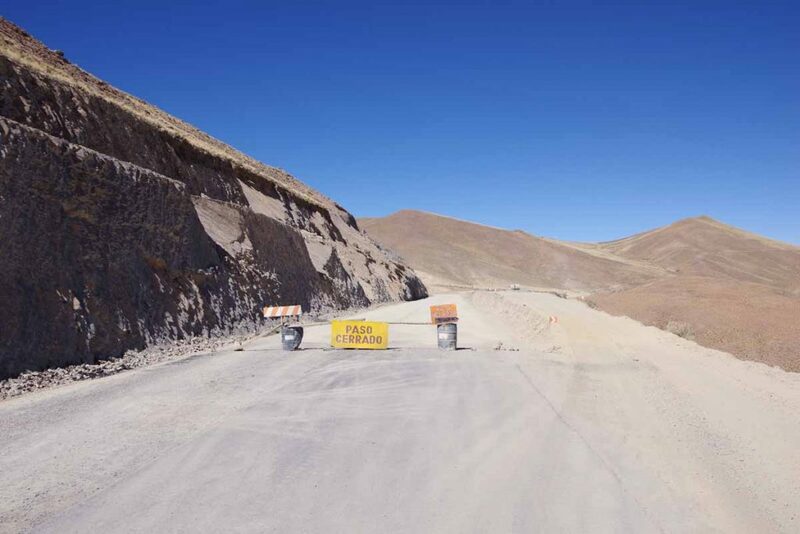 It will likely be slow going and most likely three or four days to reach Tupiza and next wifi connections. 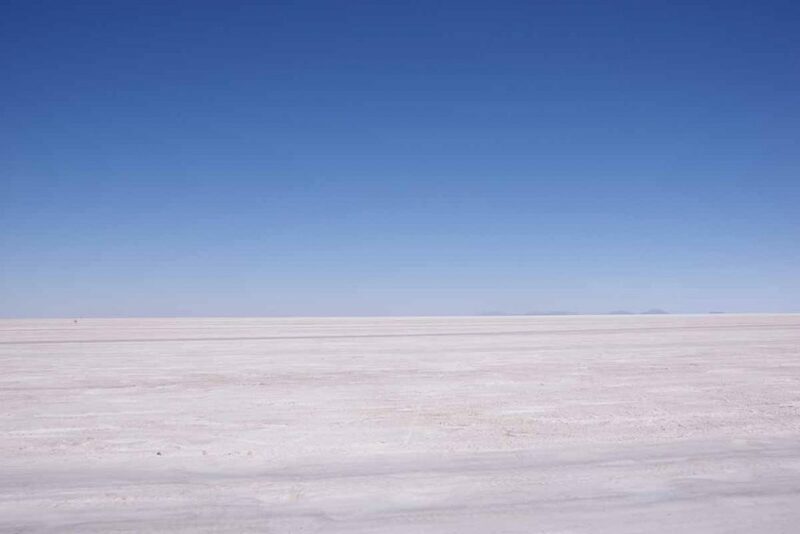 Four days riding from Oruro have brought me to Uyuni and the salt flats. 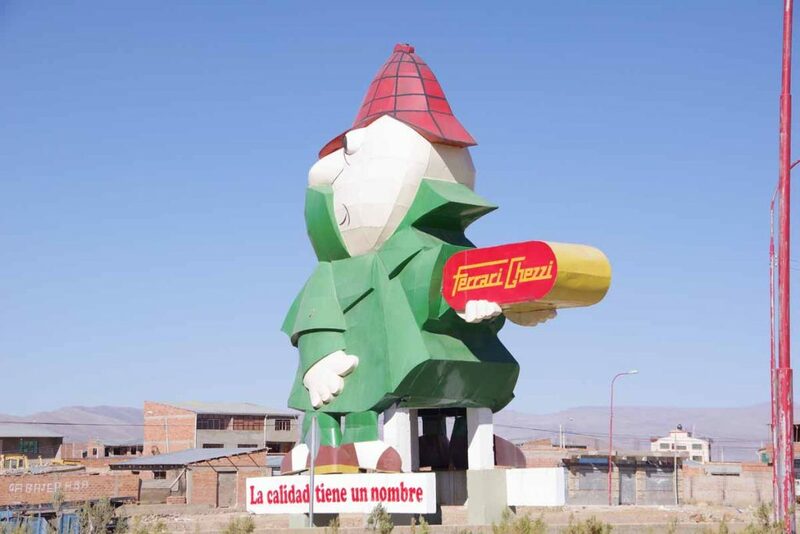 An easy ride today to the small town of Poopo. 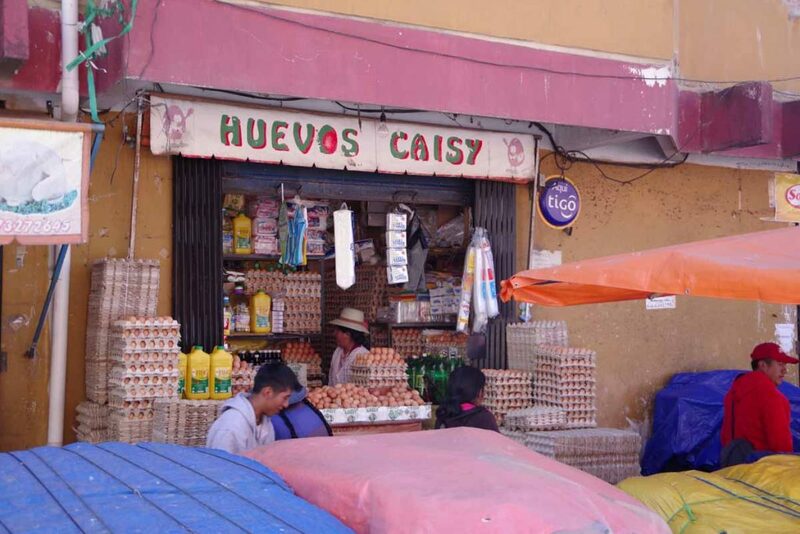 Yesterday was a relaxing day in Oruro. I found the market streets and bought some items for next few days of quiet roads. This morning no rush to leave as I made my way out of town. 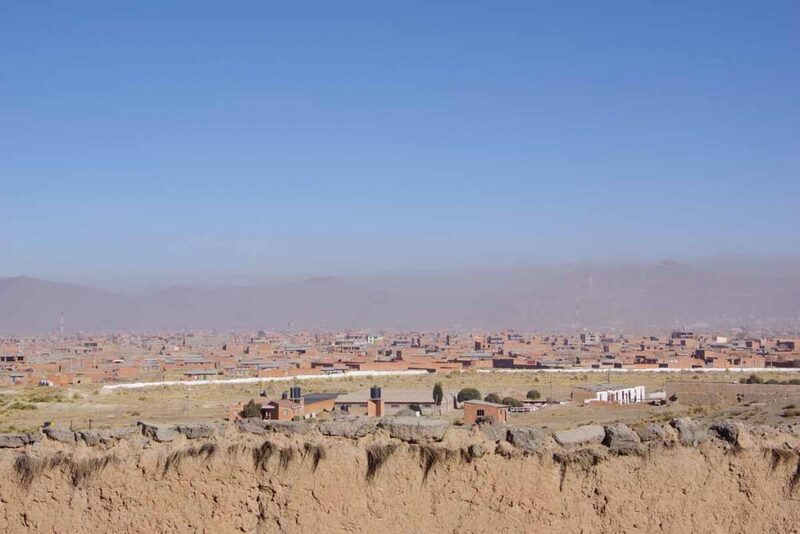 Looking back on outskirts of Oruro. I was surprised at how similar many of the brick building were. Also could see the smog across the city. 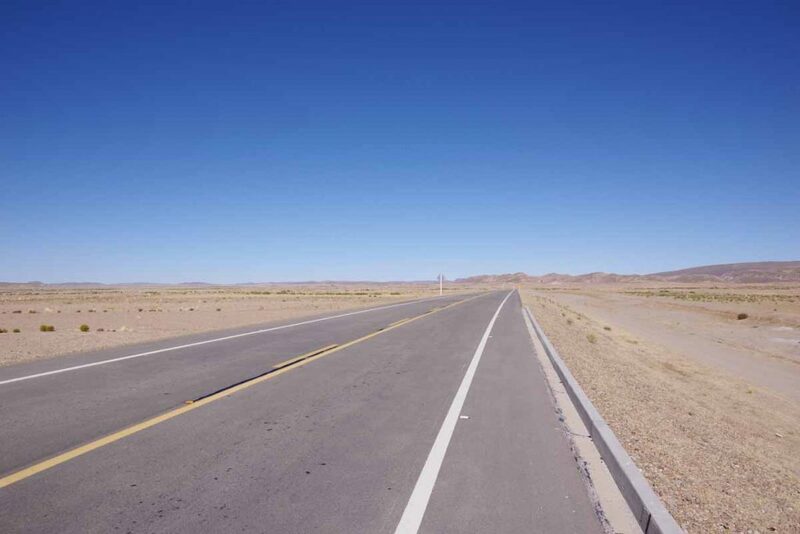 I left behind the double lane highway and route today was this single lane road. 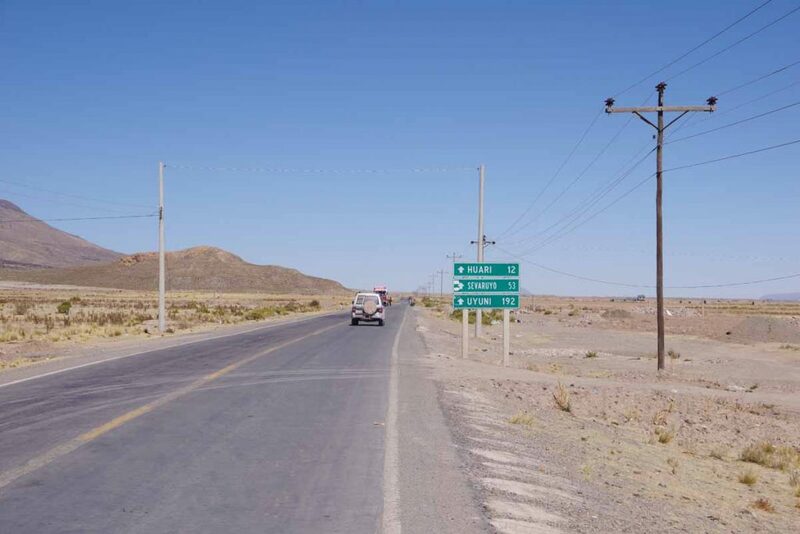 After 27km, the road split with left branch to Sucre and right to Potosi as well as the salt flats. It became a little quieter on the road after this. A bus stop or former shed. 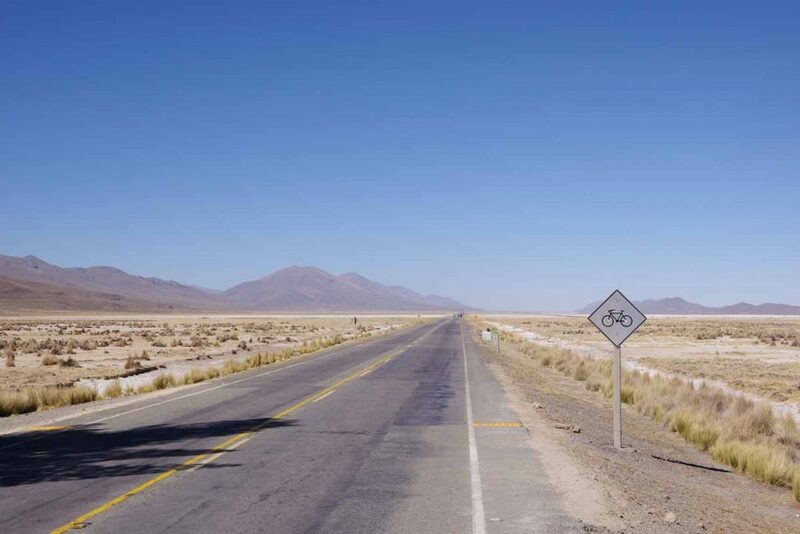 I saw a bicycle sign and even saw some cyclists that looked like recreational cyclists on this next stretch. 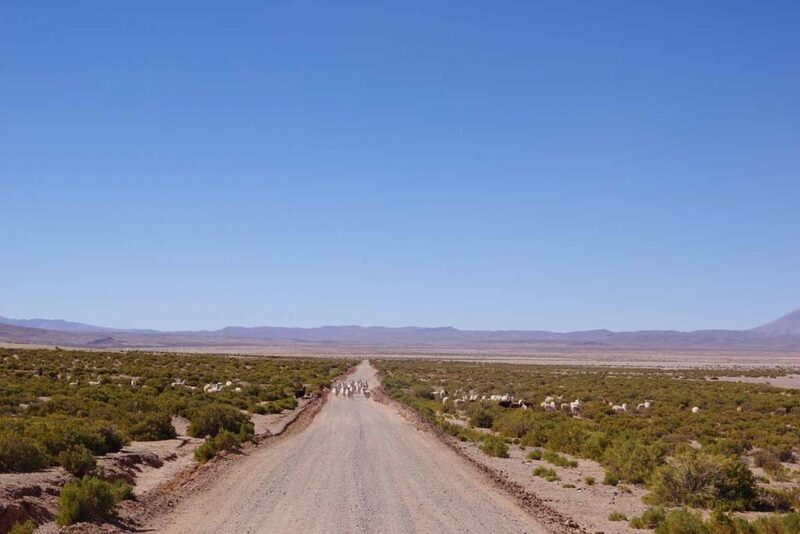 Both llama and sheep being herded here along the railroad tracks. Off to the left was the small town of Poopo. It had a nice old hotel and next door a swimming pool. Otherwise, I found a restaurant and found some shops though tough to find too much to eat in this town. 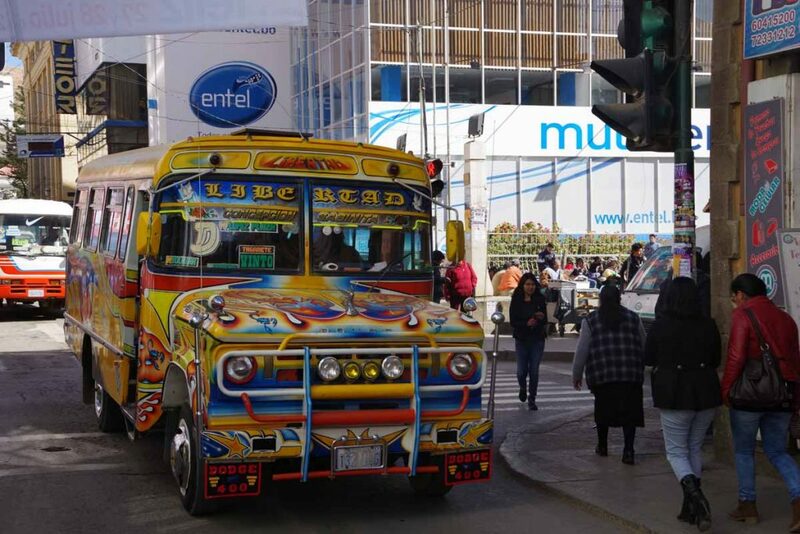 From yesterday, a photo of a bus in Oruro. A nice ride today with a chilly morning and pleasant afternoon temperatures. The sun was shining brightly as I packed up in the hotel and rode back through town. The dog above was in town watching as I left. The road continued as a two lane with occasional bumps and not much traffic. It went through a few small settlements as pictured above, but these didn’t have services. At 27km, was a slightly larger village of Pazna. There were a few vendors along the road, but not much else. 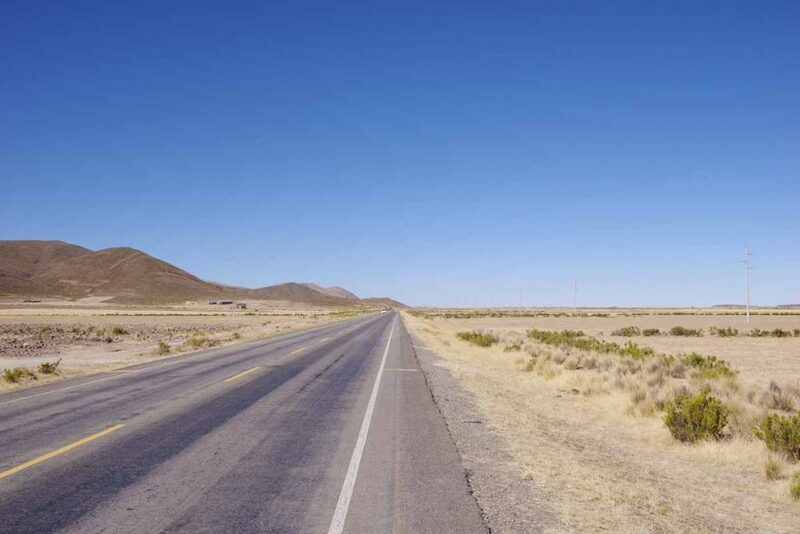 After this open road again. The route was flat and I made good time. 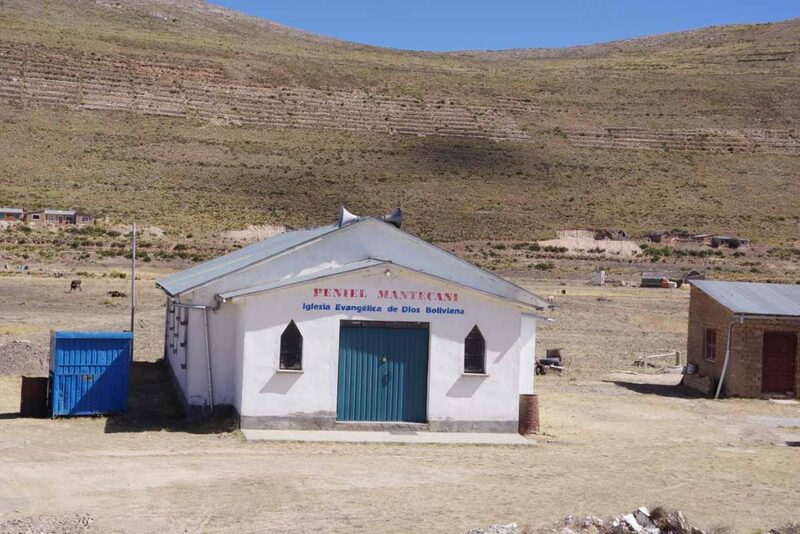 Another church and very small at top of the hill was a shrine. Occasionally there would be a field like this one where hay had been grown and cut up and placed in small piles. At 65km was slightly large place of Challapatta. I reach here just past noon. There were at least two places such as this one where I could have stayed if wanted. 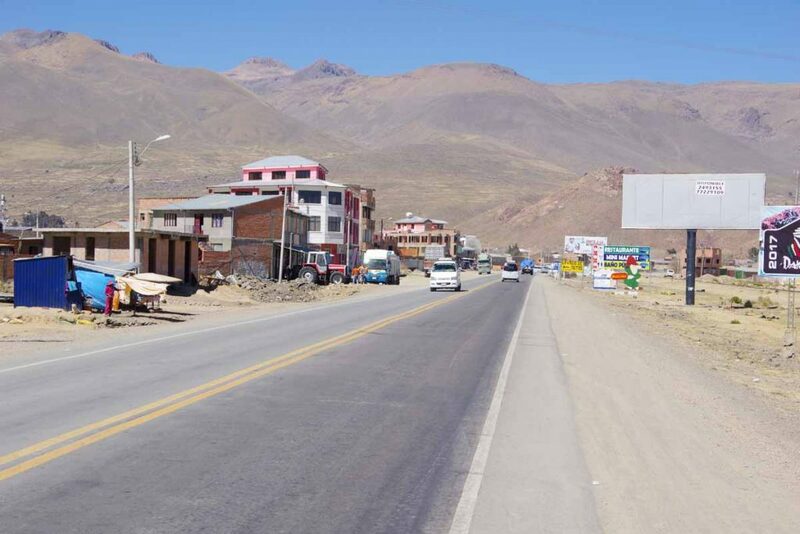 It was early enough that I got some snacks and continued further to Huari which was only another 12 kilometers further. 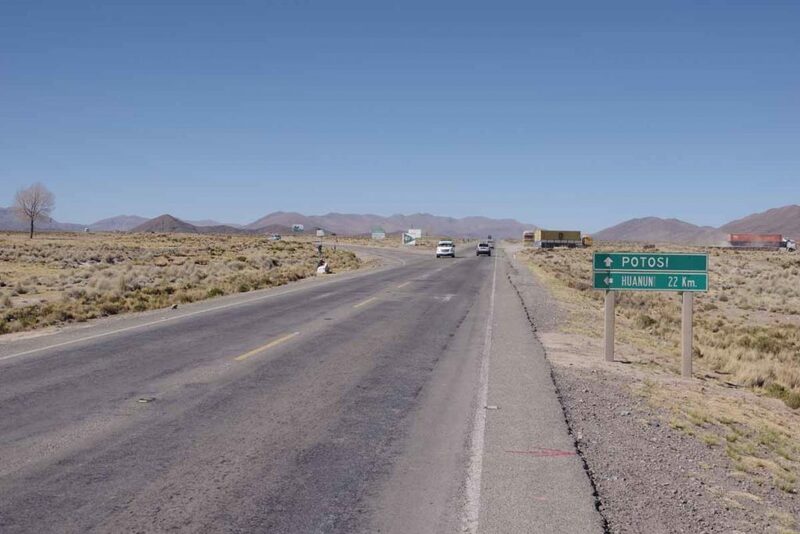 In Challapatta, there road had split into a road to Potosi and my route which continued to Uyuni. Traffic also became less frequent. 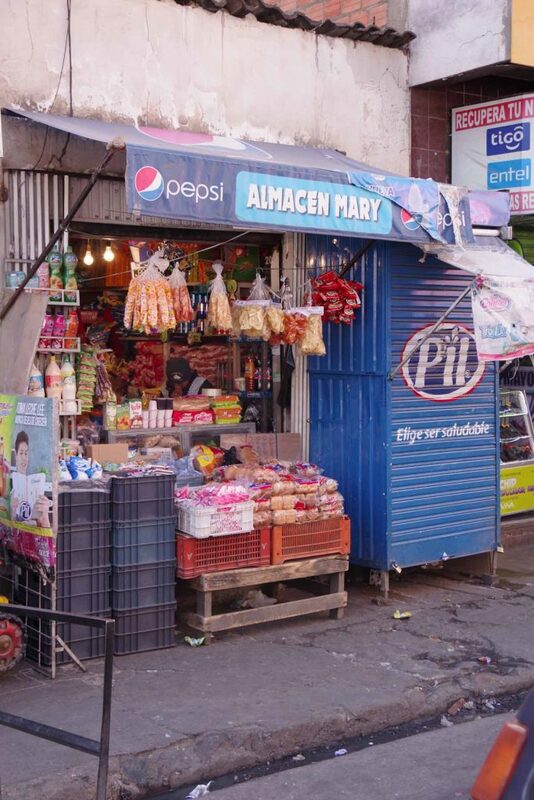 I found this small residencia a block from the main square. It had nice sunny courtyard. Across the street, I found a place to have lunch. 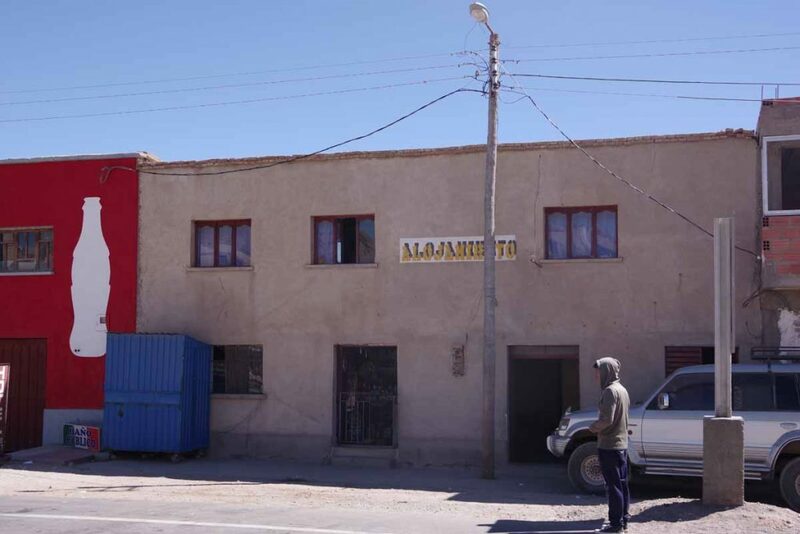 The sign says “almuerzo” and generally there is a fixed menu. Each place will have something slightly different. Otherwise a nice ride and pleasant afternoon in town. Another nice day cycling on mostly flat terrain. Not sure it froze last night, though starting out my odometer briefly recorded 0.7C (33F). In any case the large barrel of water to throw into the toilet didn’t have ice on it this morning. 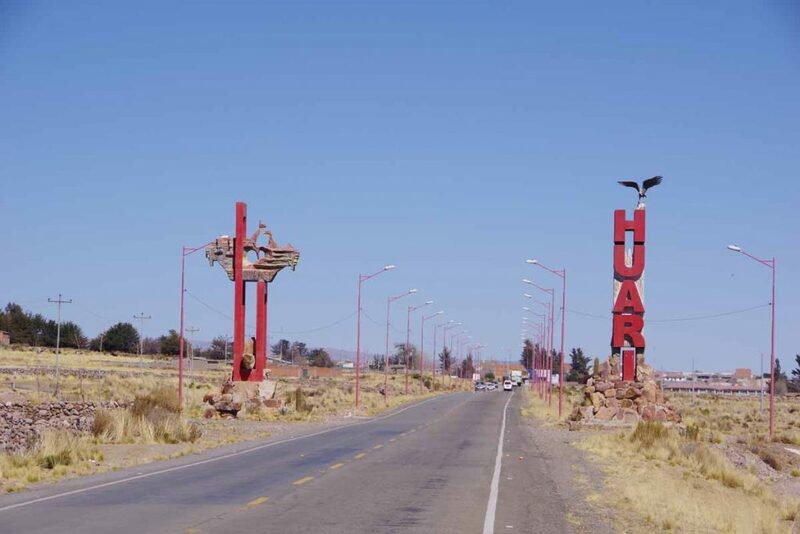 Pumped up the tires, packed the bike and set off from Huari. 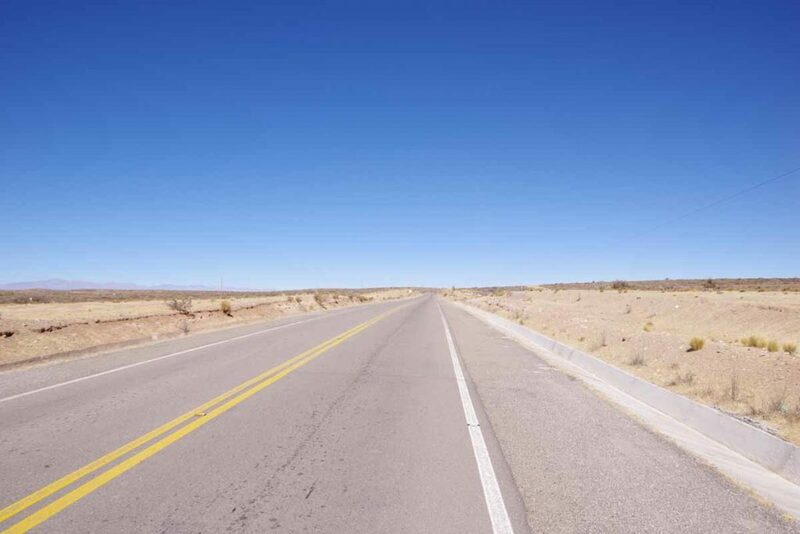 Smooth road today with not much traffic. Looks like the bus frame above had been there a while. At 18km there was a split in the road. 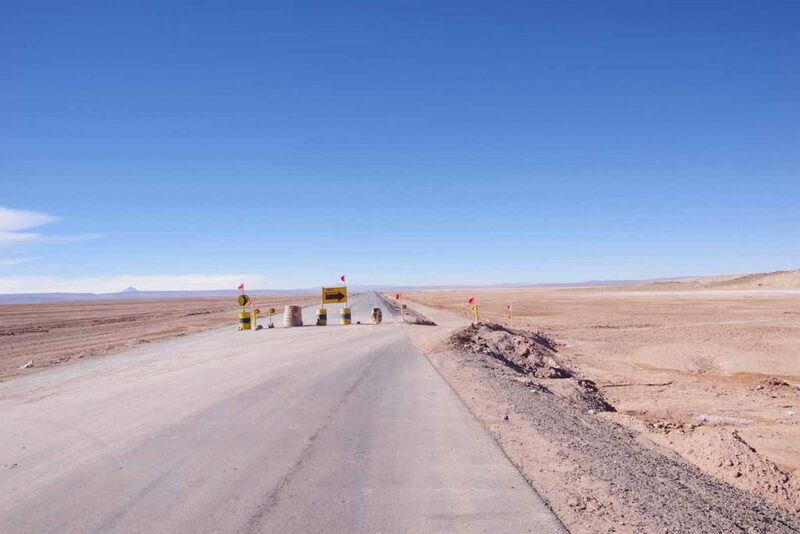 The right road headed southwest to the north of the Salar de Uyuni salt flats. In winter one can ride across the flats this way. In summer this usually isn’t possible because rains turn sections into a salt lake. 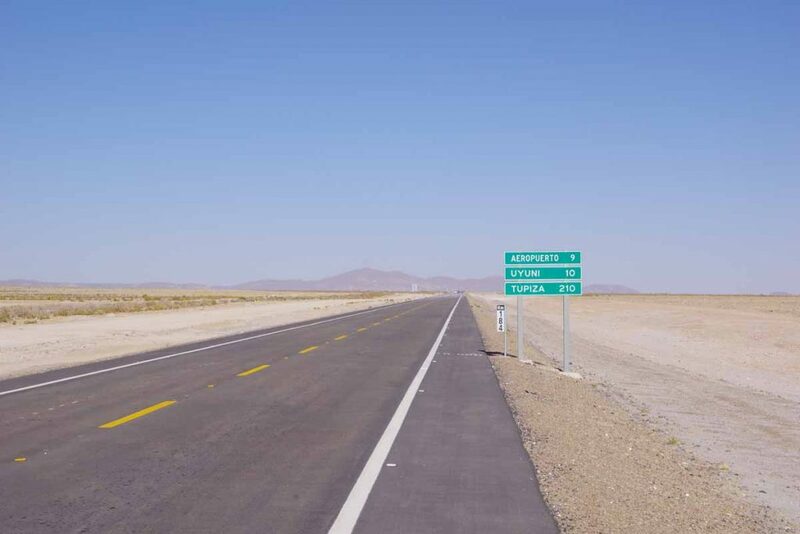 I took the left road since I figure I don’t need to ride across all the salt flats but instead just visit from the side. The road after this was just a few years old and smooth. 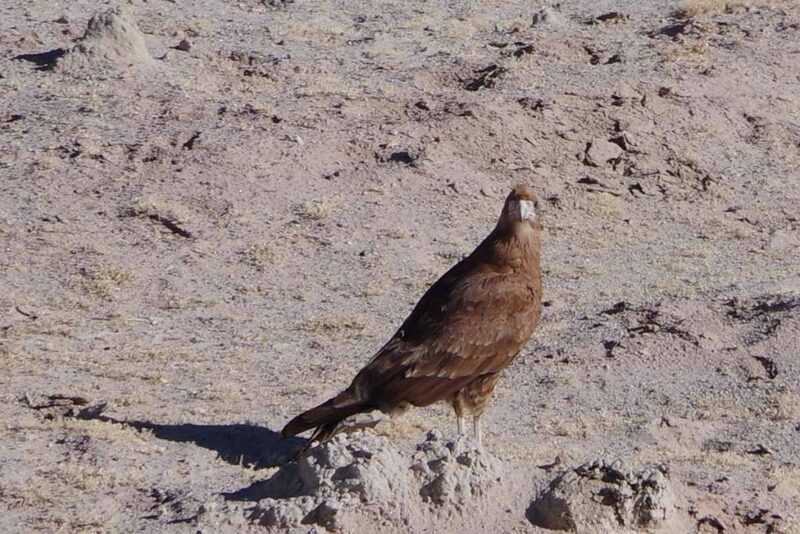 One of the birds along the way. 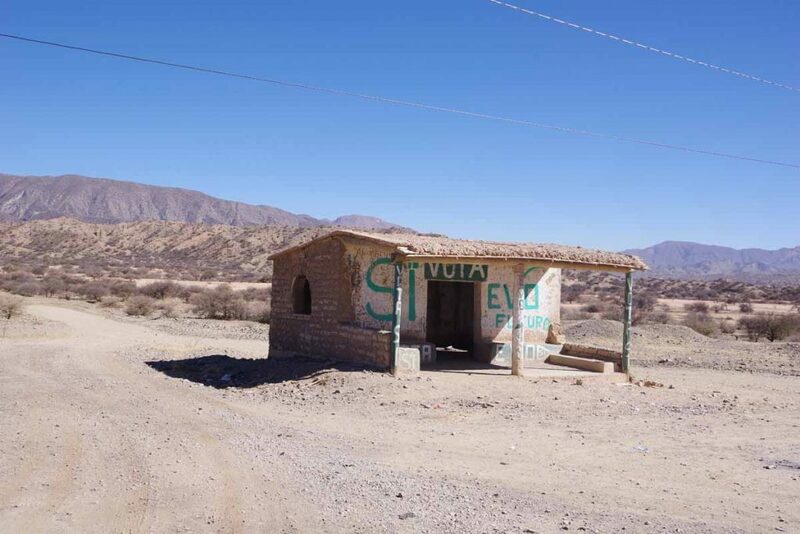 The new smooth road bypassed village of Sevarayo, but did have this bus shelter made from plastic bottles. 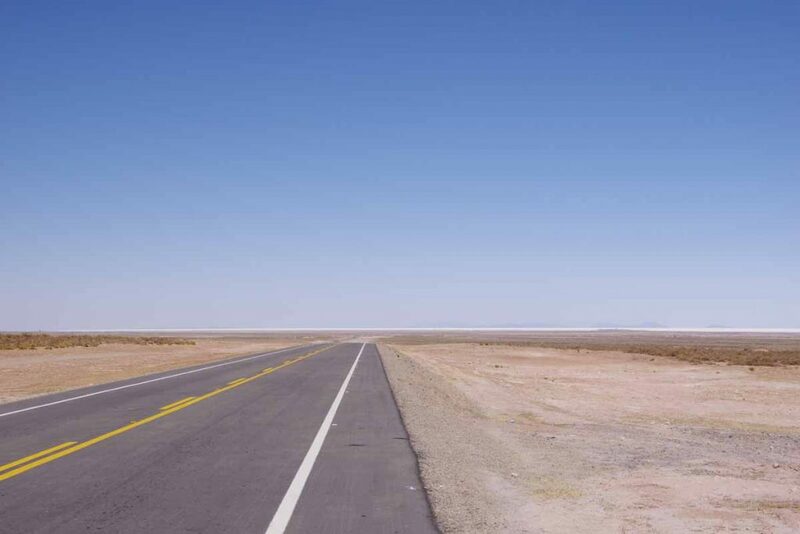 A lot of wide open spaces on the road today. One is prohibited from washings ones car. 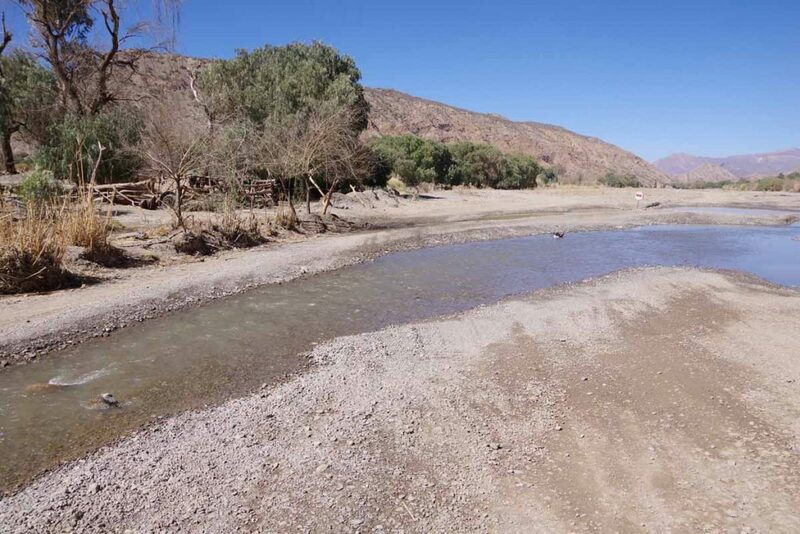 However, there wasn’t water in the river, so it would likely be difficult in any case. 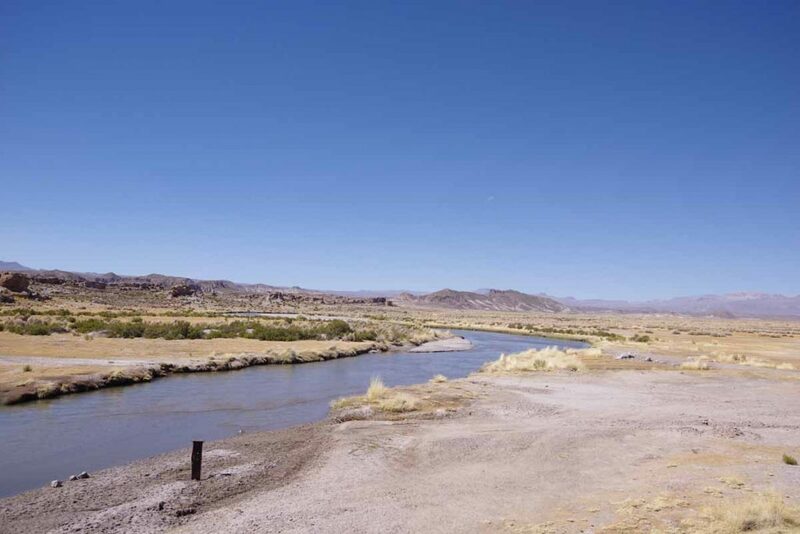 I have seen a few rivers such as this one with water in them. 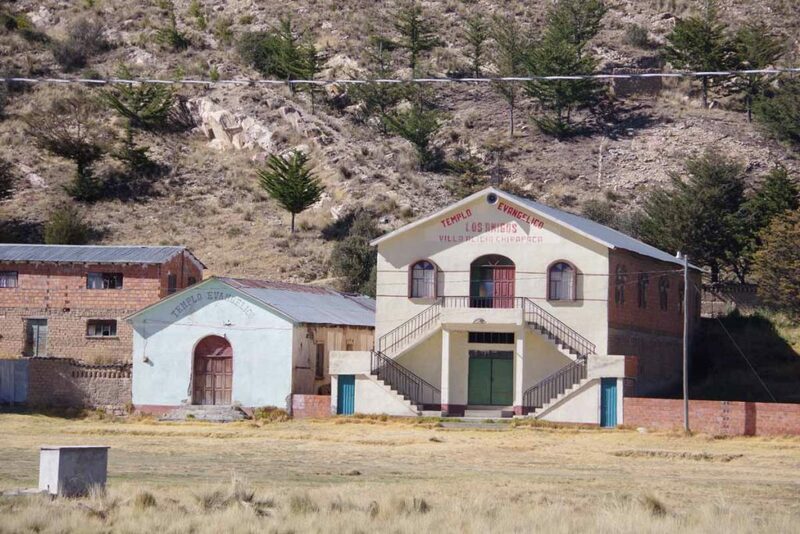 By early afternoon I reached Rio Mulato. 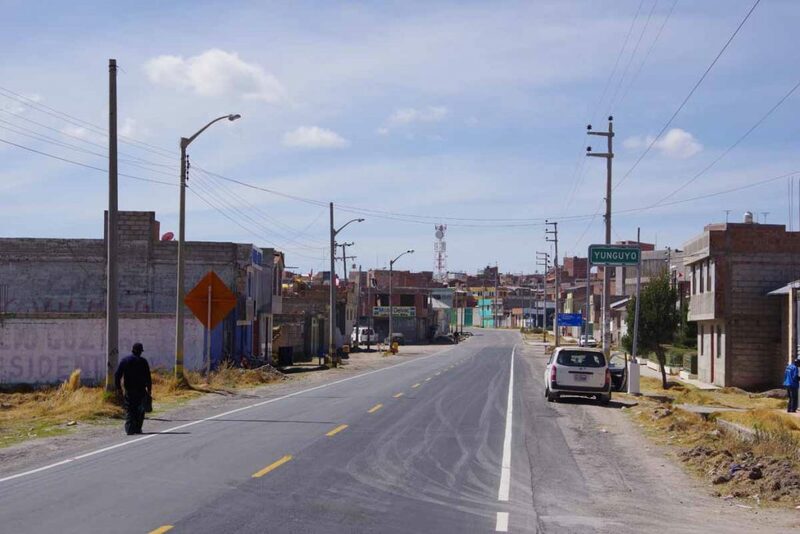 The town seemed to be mostly along the road and railroad tracks. 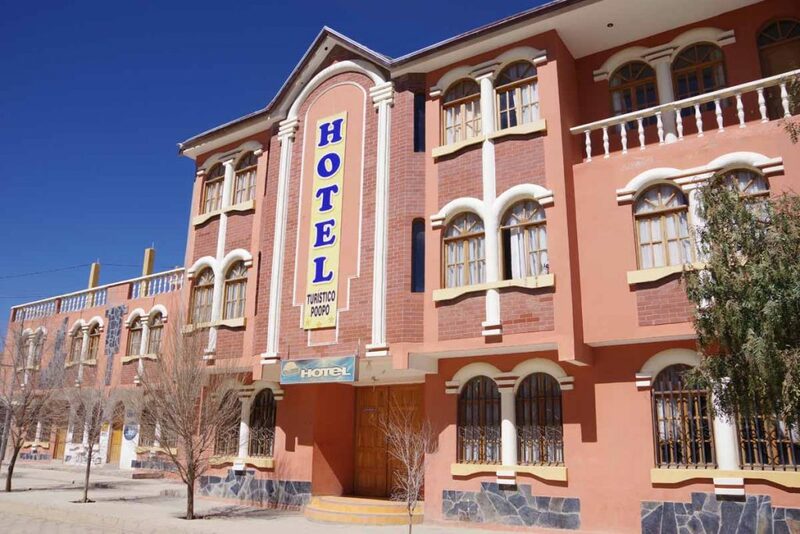 I found this hotel, least expensive price so far 20 Bs ($3). 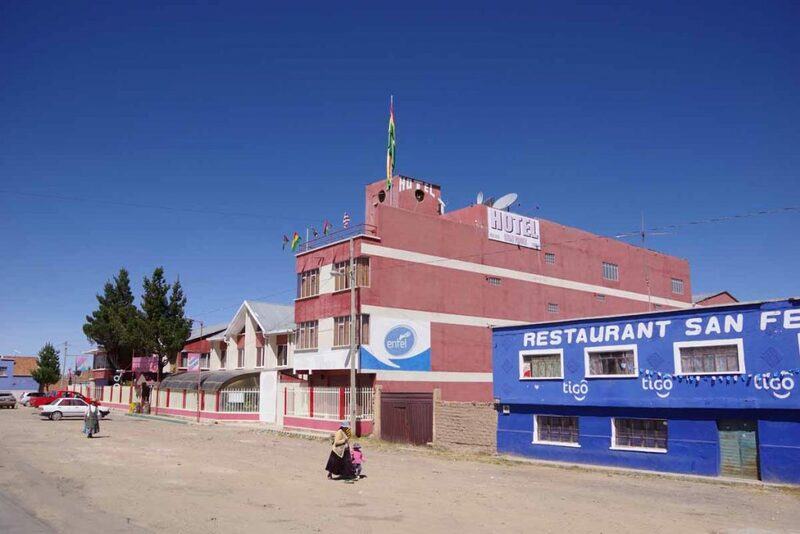 The hotel seemed temperate, but it turned out to be cold once I left Rio Mulato. My odometer gave -3C (27F) and didn’t get above freezing until 9am. Sunrise is at 7am and I try to get on the road around 8am. 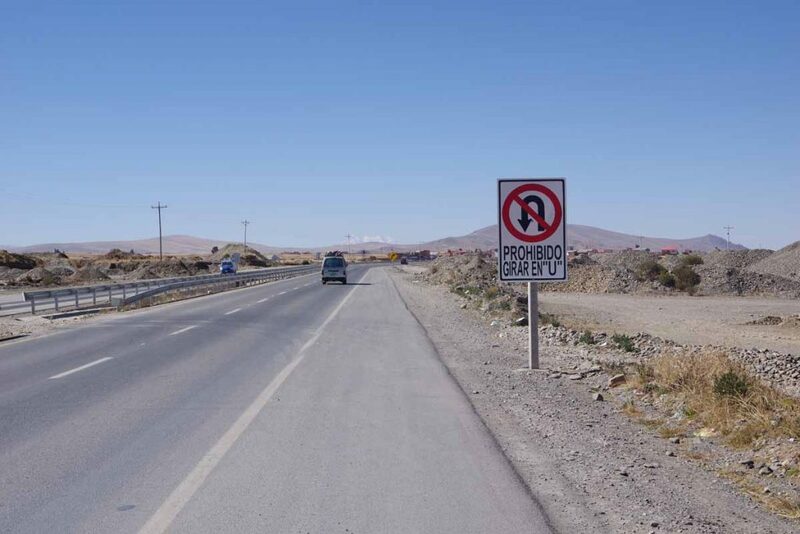 Lots of signs on this road. The first says no hunting and the second warns for animals on the road. 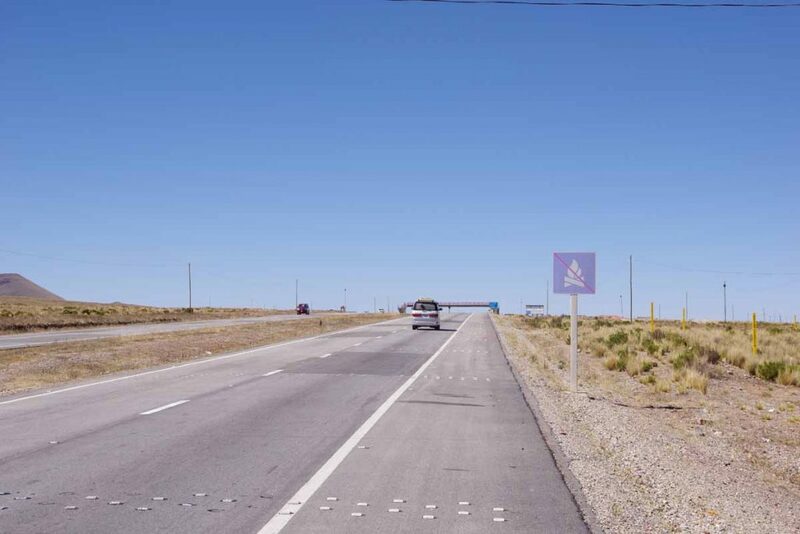 Both signs seem to use a similar llama/vicuna image. 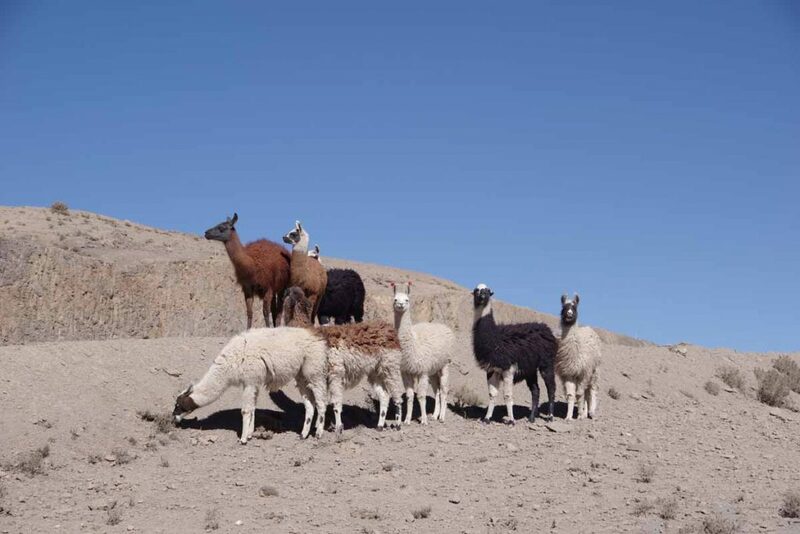 Several spots with llama herders today. 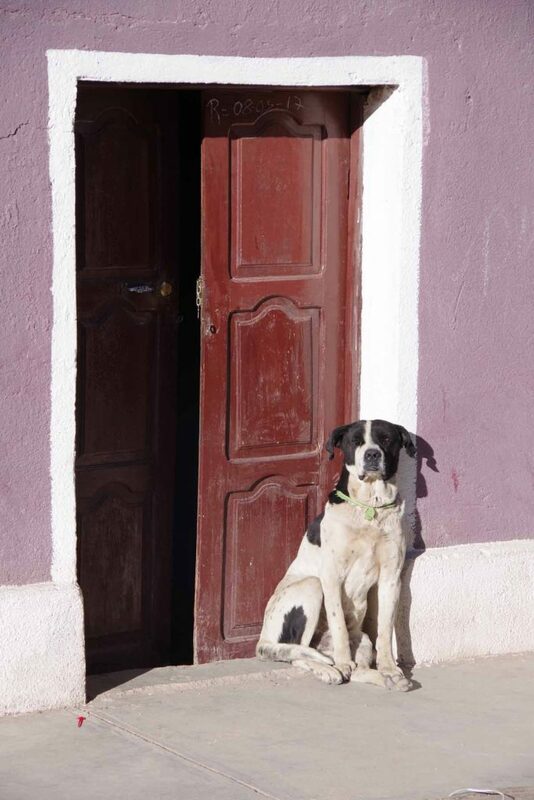 The protective guard dogs would come running out and barking as they saw me on my bicycle. Fortunately, these particular dogs were well-behaved and came back when the owner called. 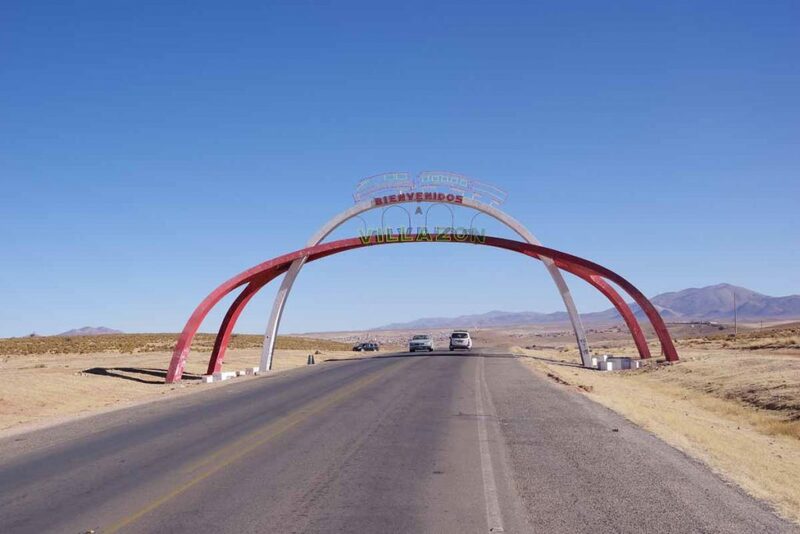 At 55km was this town of Chita along the way. 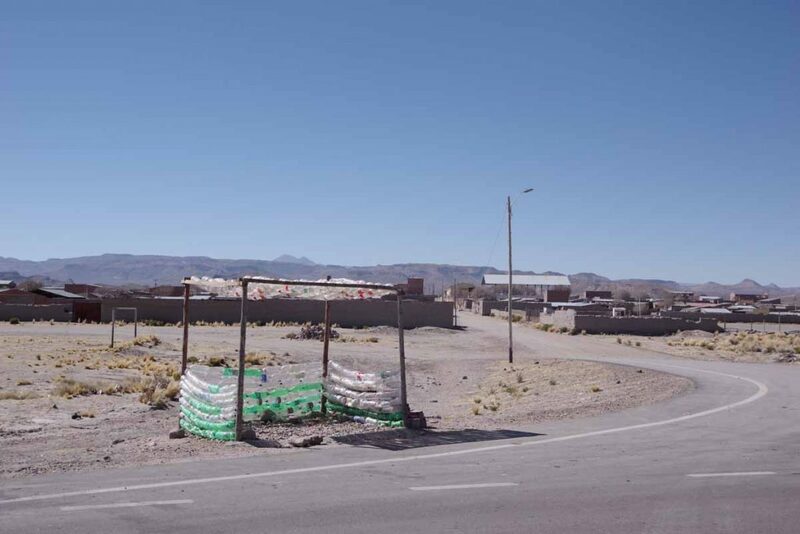 I had expected a bit more roadside business to get some lunch, but the road bypassed the town and not clear there was much business to be bypassed. Somewhat after this I saw the salt flats on the horizon. Access to the flats from this road was via the town of Colchani. 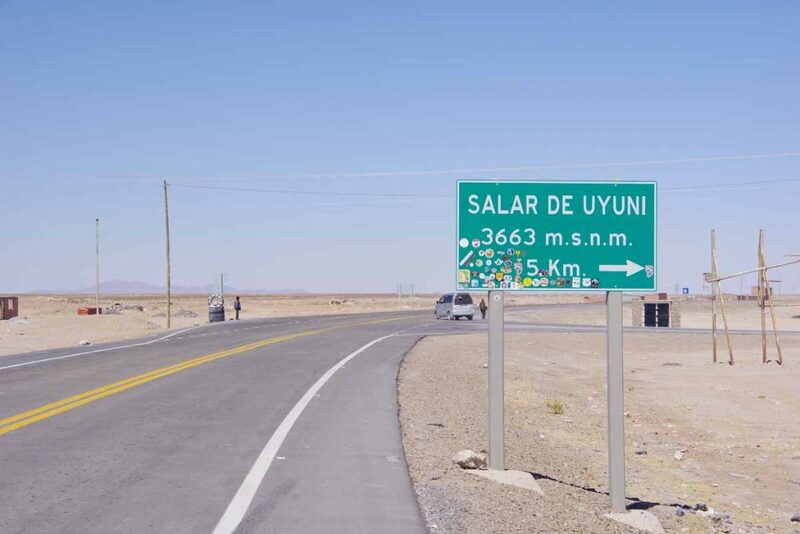 At Colchani was this sign indicating five kilometers to the salt flats. 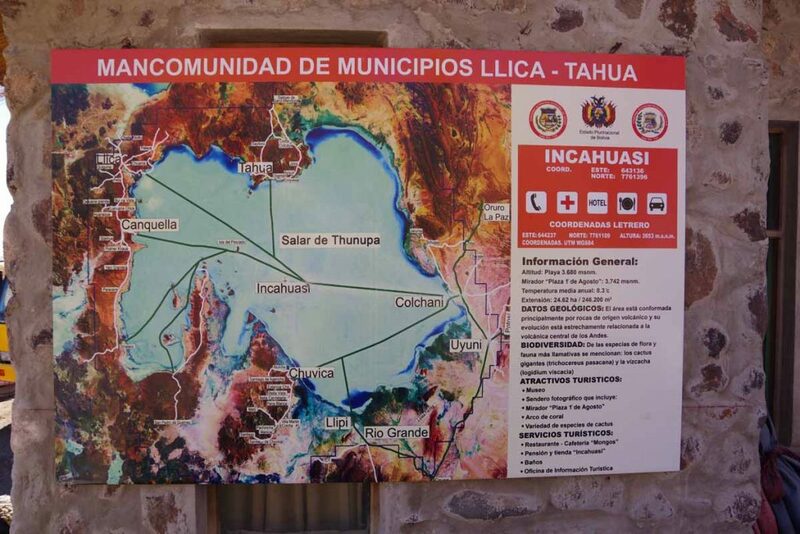 I decided I would do one of two things, either (1) ride via Colchani to the salt flats and stay in a hotel there or (2) visit the salt flats and then cycle to Uyuni and come back to take a tour from there. 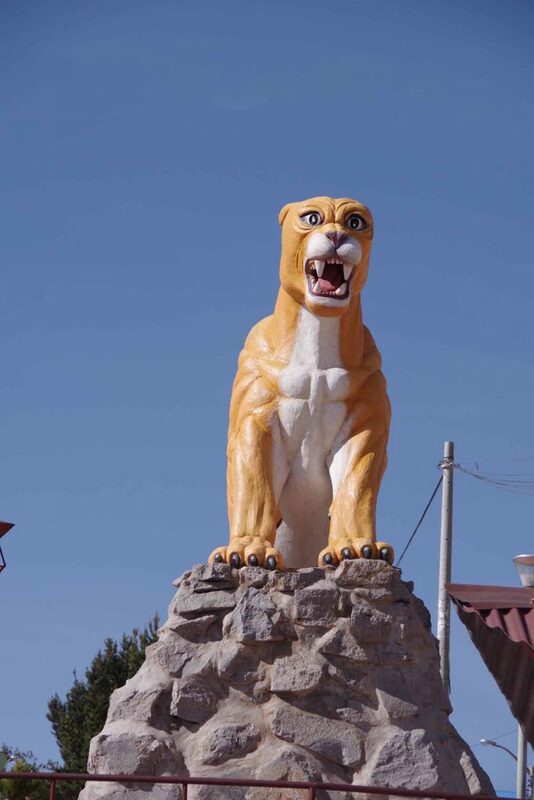 It depended a bit on what I found for hotels in Colchani. Also interesting to see all the stickers that had been placed on this sign. There wasn’t too much in Colchani itself other than this museum. 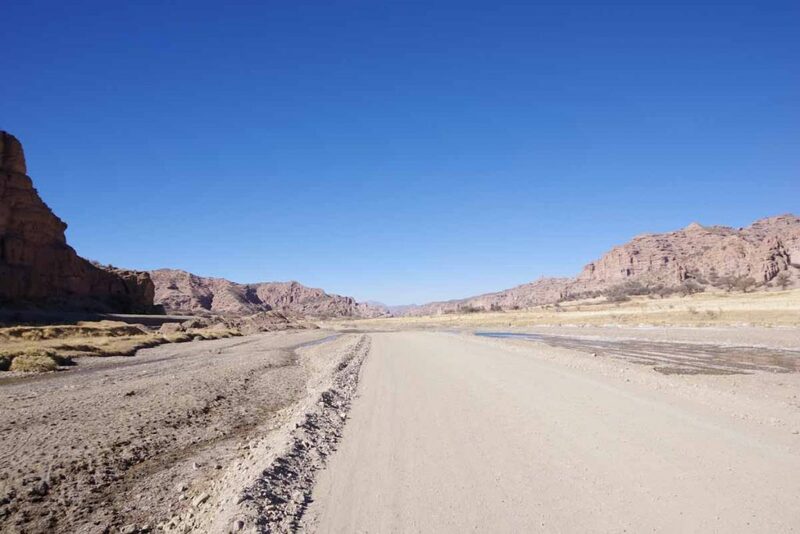 The road itself was washboard and rough to ride, so it was a slow cycle. 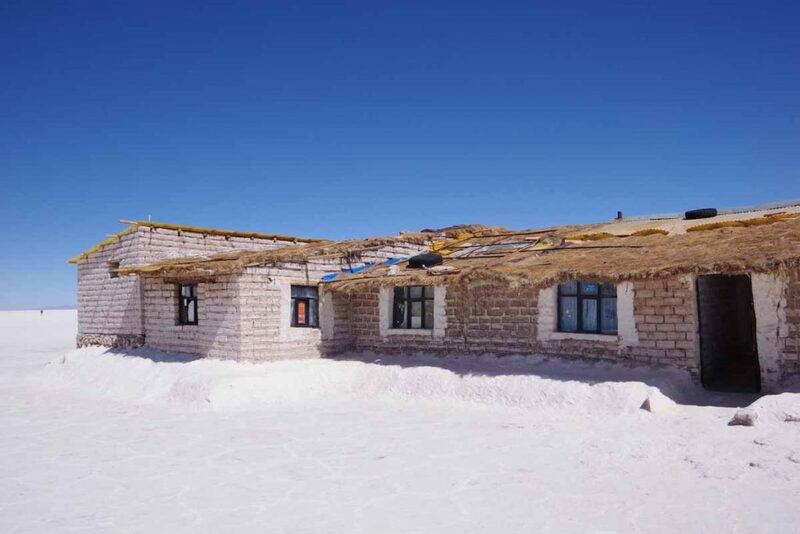 On the edge of the salt flats were several hotels such as this one. This was actual hotel down the road. 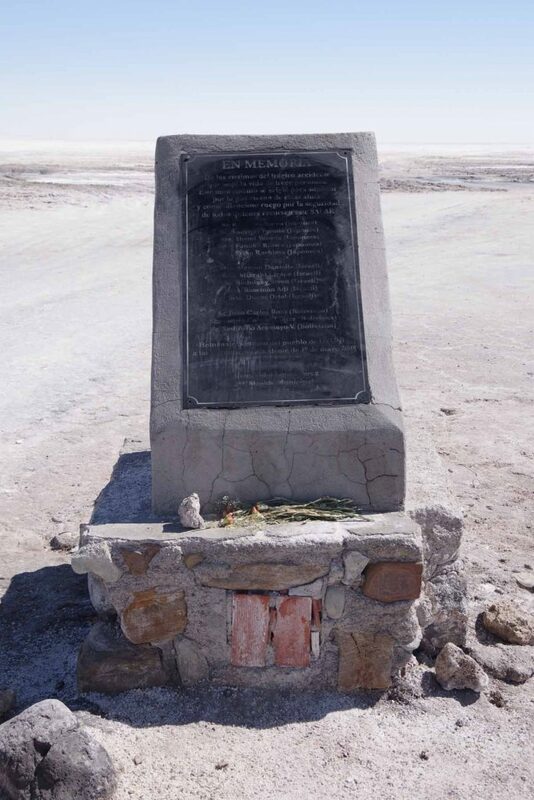 Finally reached the salt flats where this memorial stone was found. 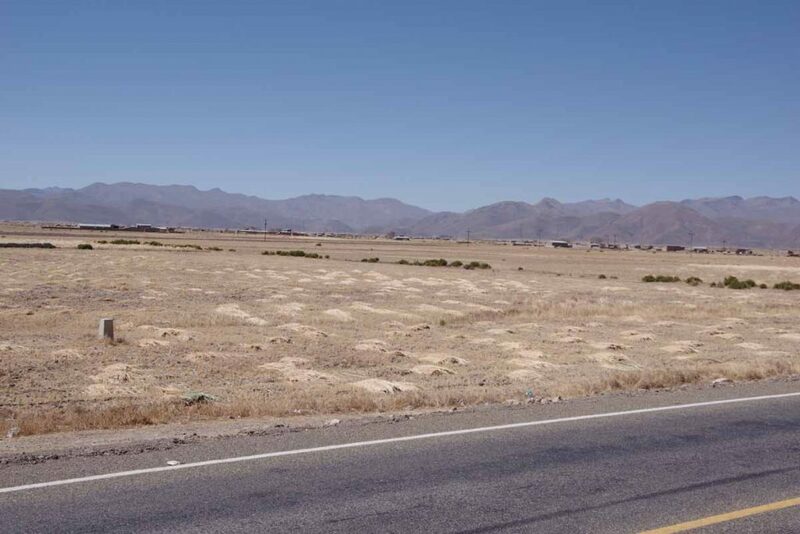 I cycled about a kilometer further out into the flats to get some views of the vast expanse. 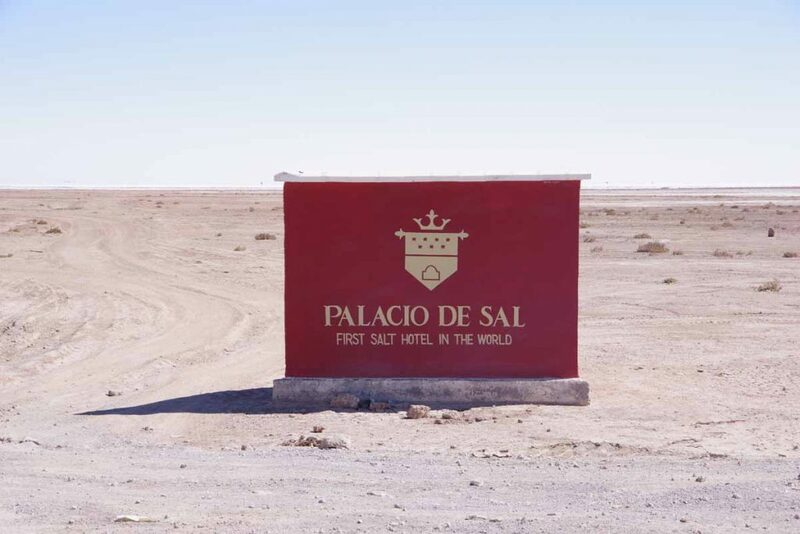 After that I cycled back and tried one of the salt hotels. It was a fancy place, but some cyclists recently reported staying there on a discount. Unfortunately, they didn’t have any rooms. 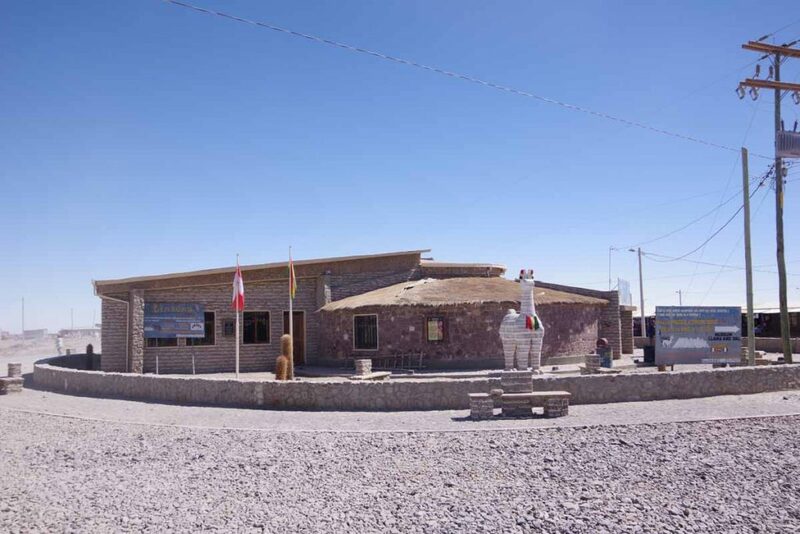 Rather than go down the roads for the other different hotels, I decided to ride on to Uyuni and try to come back on a tour. 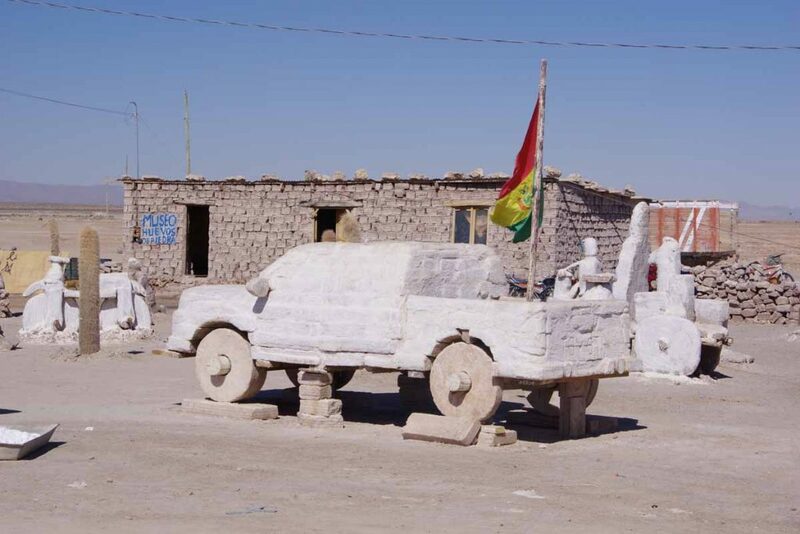 Saw this truck carved out of salt. 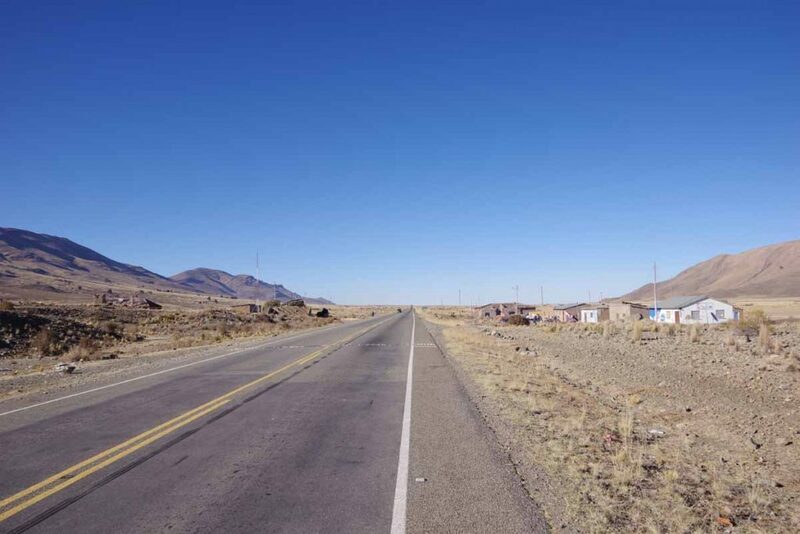 Back to the main road and into Uyuni. 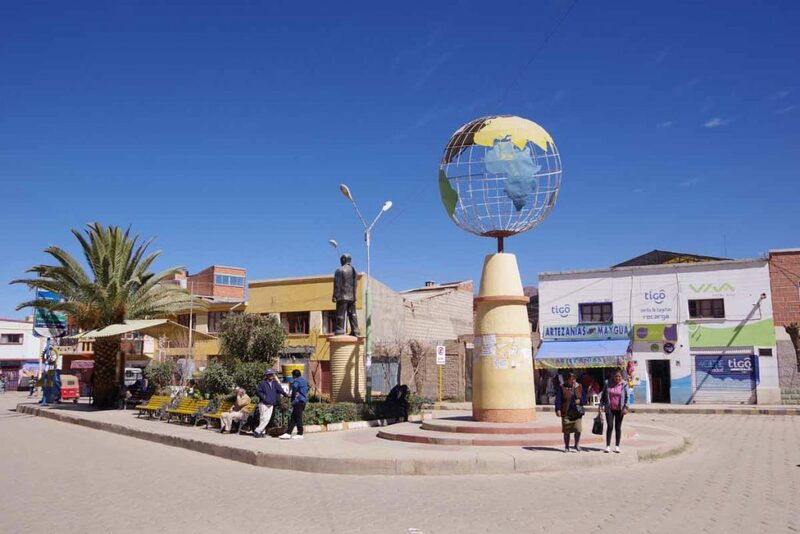 Uyuni is a larger town of ~10,000 with many hotels and otherwise a tourist center. 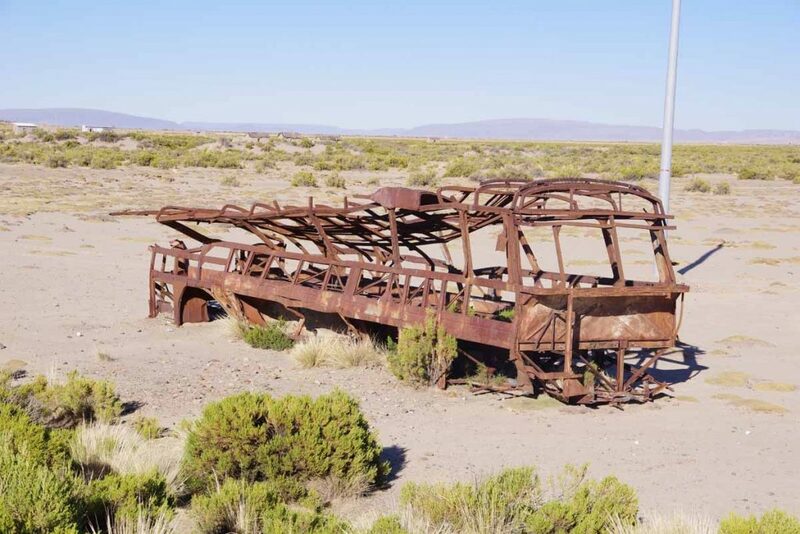 I booked a reasonable hotel for two nights and then found a day trip tour that I’ll take tomorrow to go back to the salt flats and explore, though this time in a vehicle and with a guided tour. Also prior to the tour, will try replacing/patching my rear tire which still has a slow leak, though that leak has been letting air out more quickly. 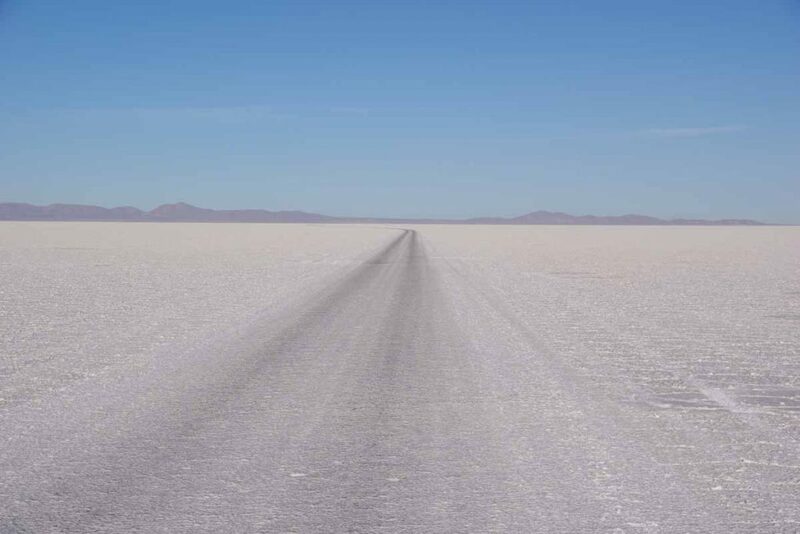 Nice to get to the salt flats as this was one of the reasons I picked this route via Bolivia. Looking forward to exploring further tomorrow on the tour. 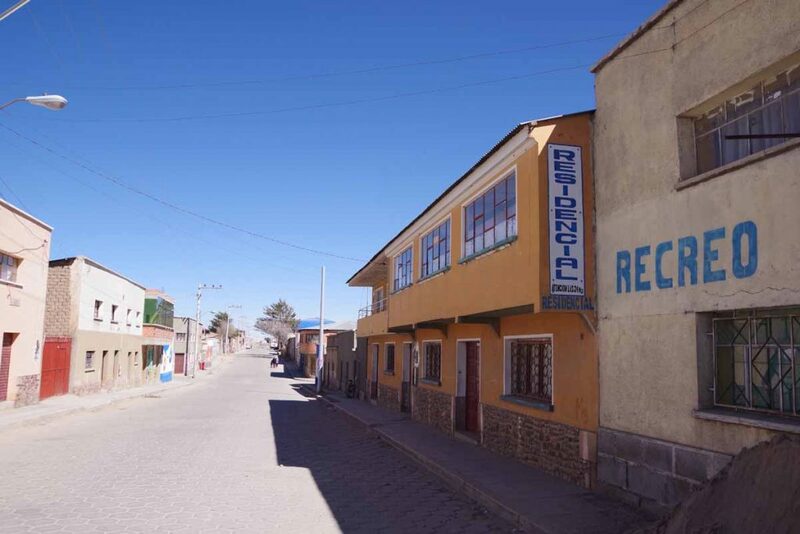 Two days riding has brought me to the mining town of Oruro. Like Wyoming? Sometimes when I’m cycling through a new area, I’ll be reminded of places more familiar. 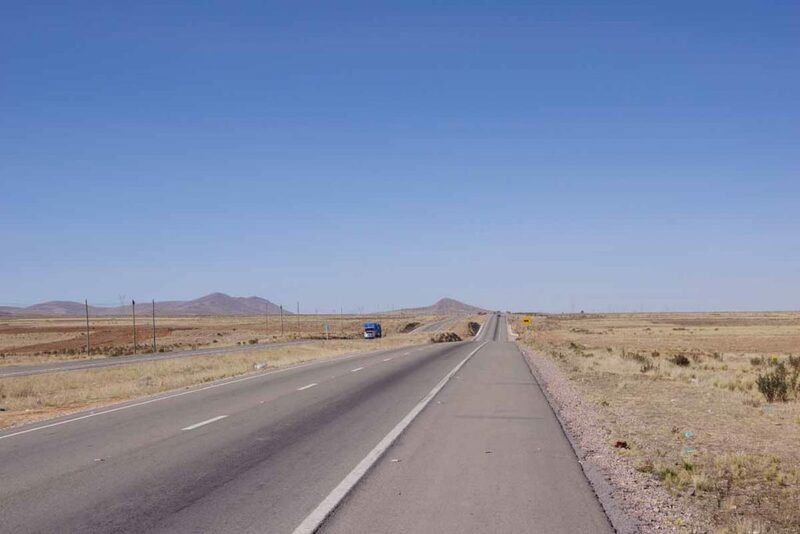 Parts of todays route on the divided highway somehow reminded me of I-25 through desolate stretches of Wyoming. Breakfast in the hotel and then packed everything up. Somehow my rear view mirror was missing. 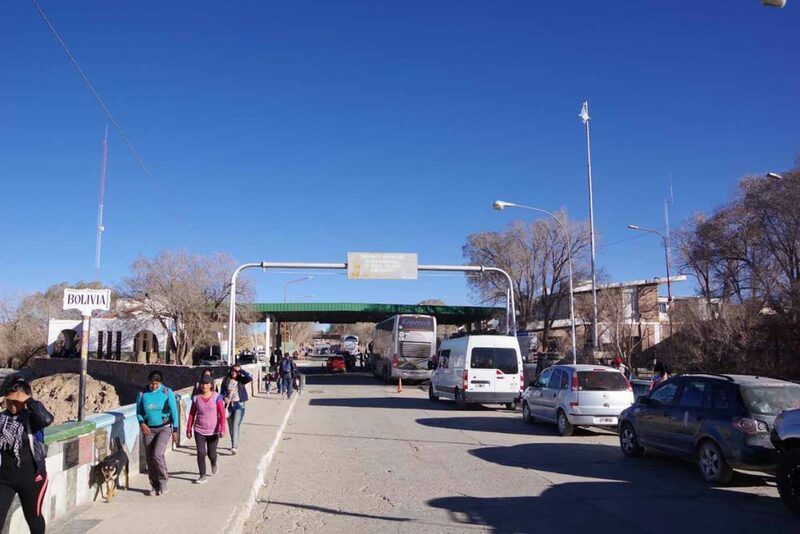 Not critical, but would be handy particularly this morning as the first 10km were leaving the bustle of El Alto. After about 15km, it looked like above with most of the town behind me. 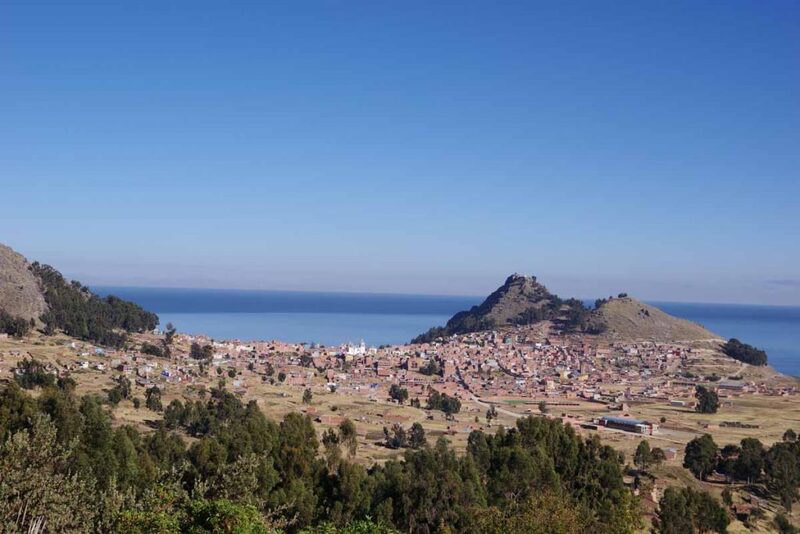 I climbed a small rise and here was the view looking back towards El Alto and La Paz. Here was one of those views that reminded me of Wyoming. The route today was almost entirely on a divided highway. There were occasionally small hamlets, though not many of them had much in way of shops or other services. These cleanup workers were all sitting down, though by time I had my camera out, they were already getting up. 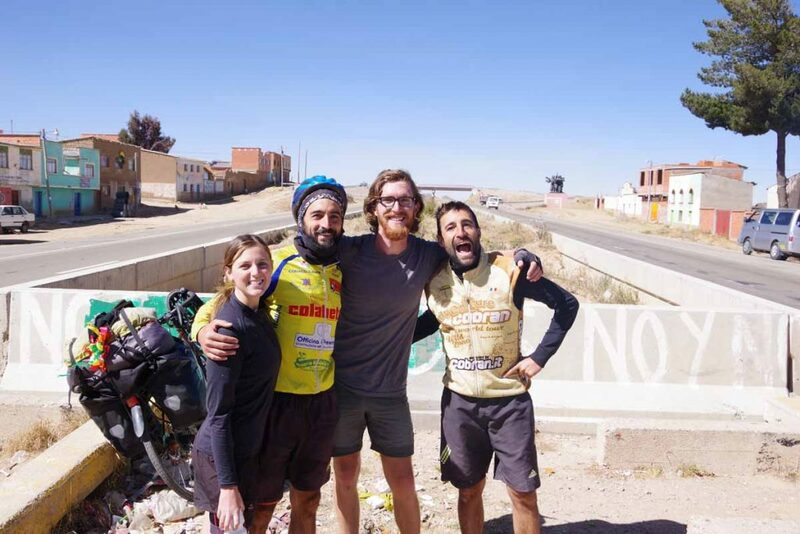 At 40km, I met this mix of Italian and American cyclists. The Italians had started in Vancouver, BC last year and were slowly making their way south as well. We traded information about the roads and potential choices. A monument as I was leaving this small settlement. At 60km was small town of Tholar. 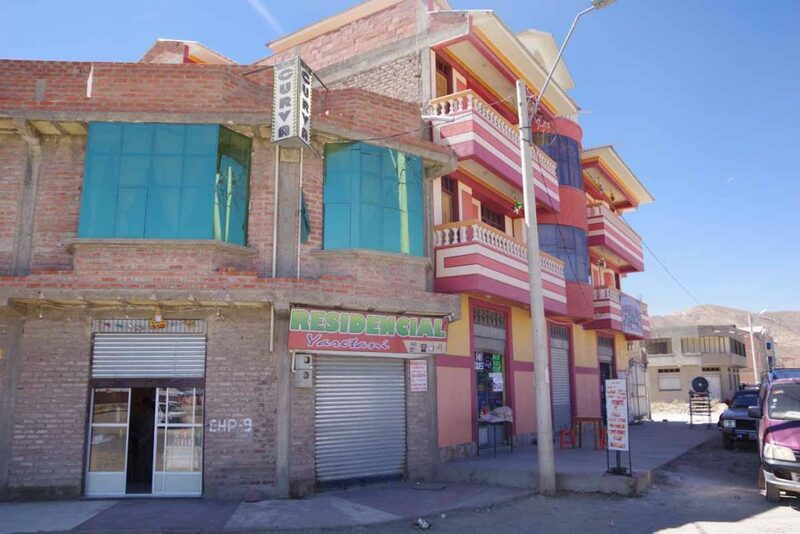 It had this large hotel, with a reasonable looking restaurant as well as a small shop. Would have been a nice place to stay, though it was still early so decided to press on further. 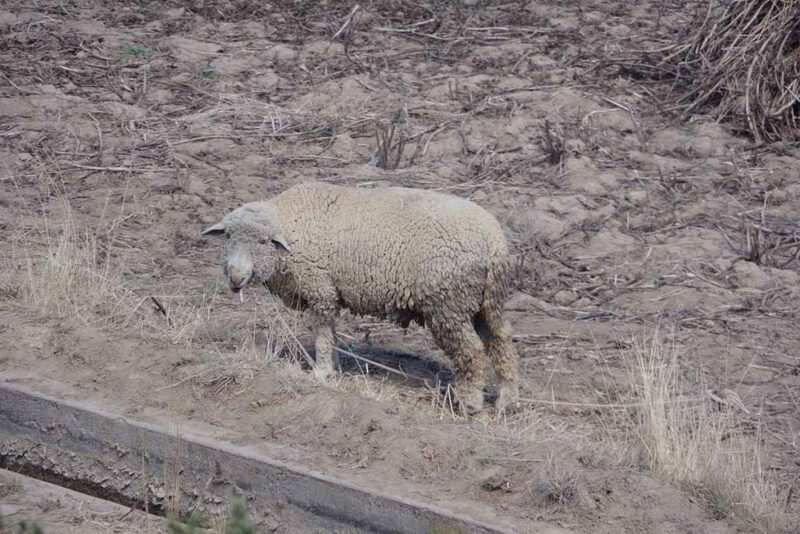 A sheep along the road. 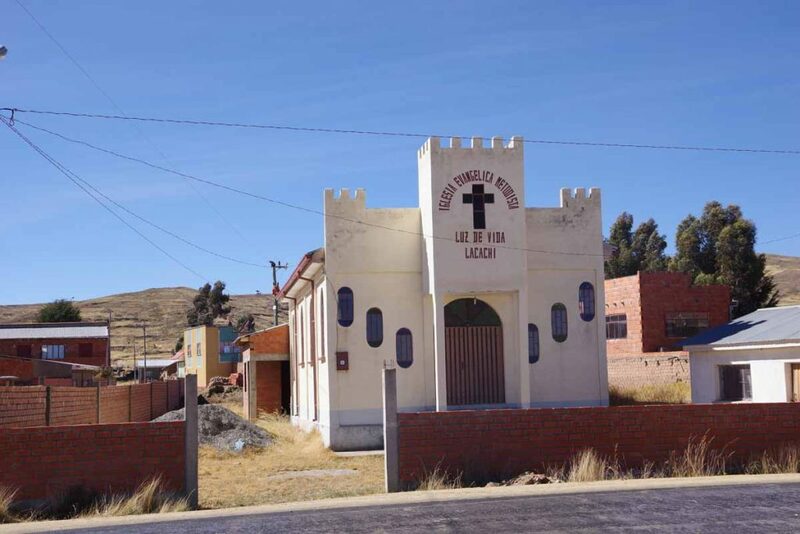 A church in one of the small settlements. 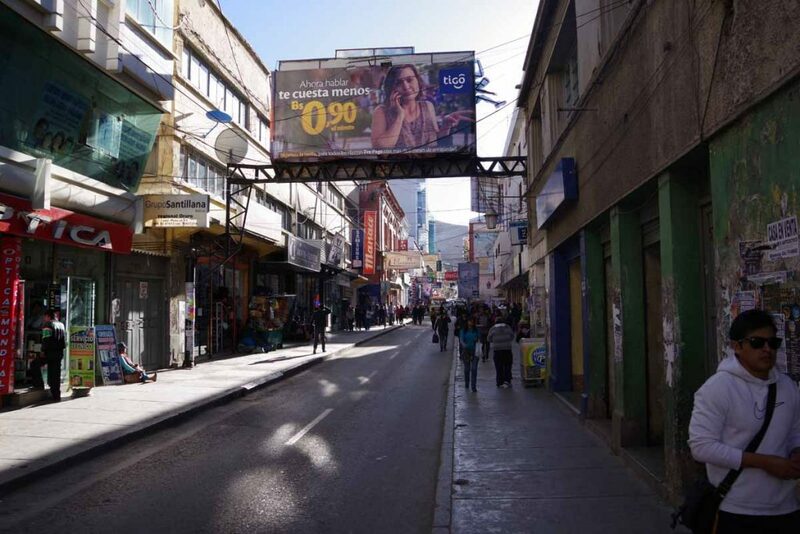 Downtown parts of Patacamaya. 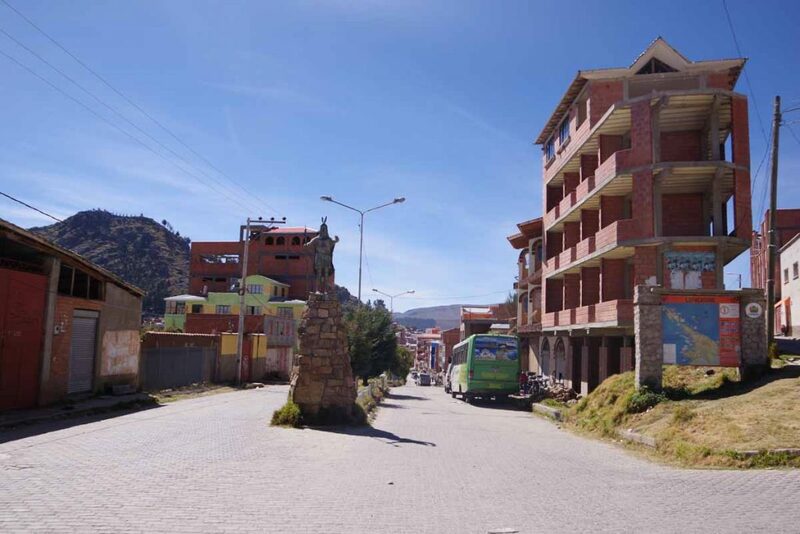 There were a number of different accommodation choices, though none caught my eye so I ended up on the far part of town. The place I picked turned out nicer than expected with a small courtyard behind the façade. Walked back into center of town for a late lunch and otherwise settled in to this small community. No wifi but also didn’t expect it. Today a day with a lot of riding and not much stopping or taking photos. 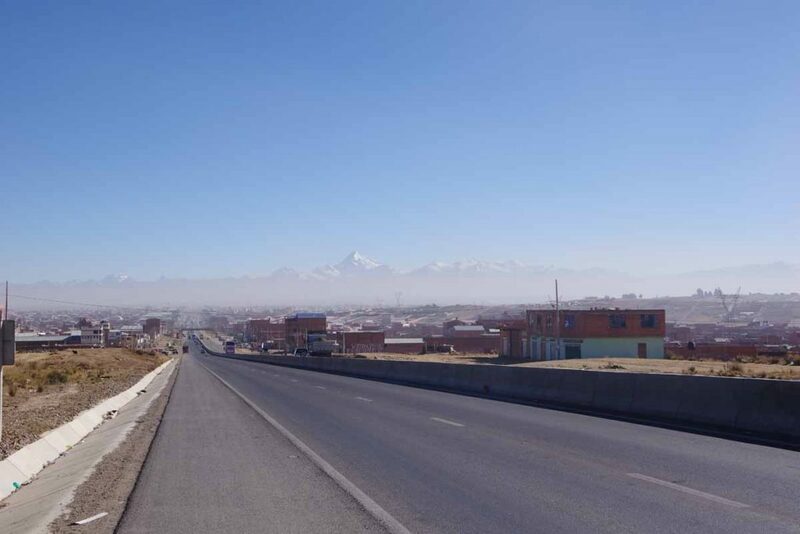 Entire day was back onto the divided highway until the last six kilometers into Oruro. A lot of today looked like this. Not quite sure on these pedestrian overpasses since there isn’t much traffic on the road and sometimes I’ve seen pedestrians just walk across. The shoulder was nice and wide, though there was some debris. I may have a slow leak in the back tire as I pumped it up once and later it was low again. Not sure why there was a no burning sign. Most days I’ll have one or two options thought in advance of where I might stay. I reached the first of these Konani at 46km in the morning. 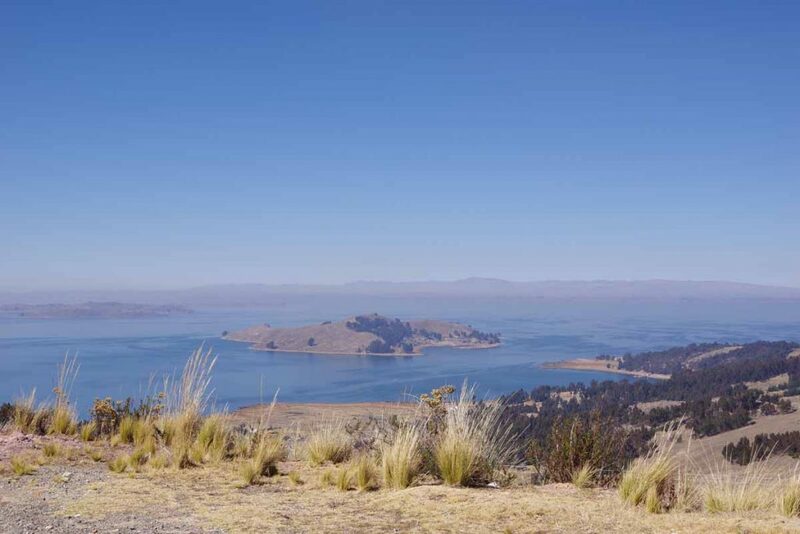 After this a solid climb and some headwinds, but still made good progress and I was near Caracollo at 90km by 1pm. 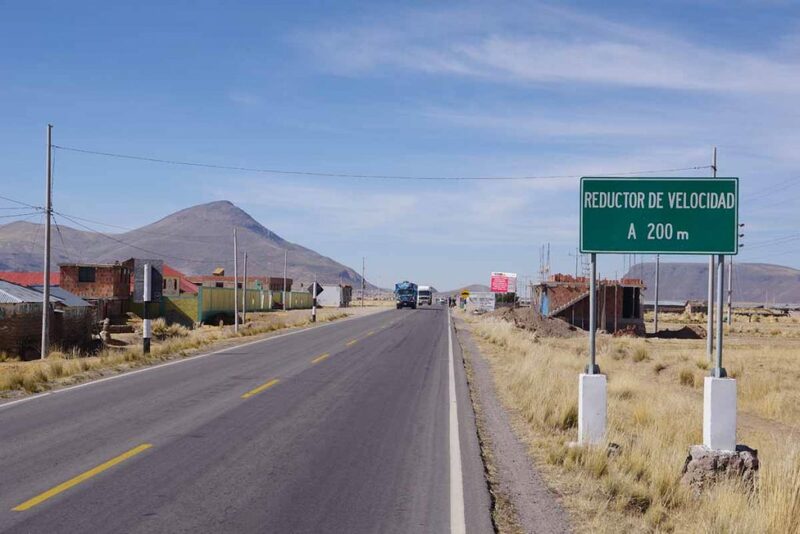 This had been my intended stopping point but realized I could also make it to Oruro by continuing on. This road worker riding his bike back from assignment. 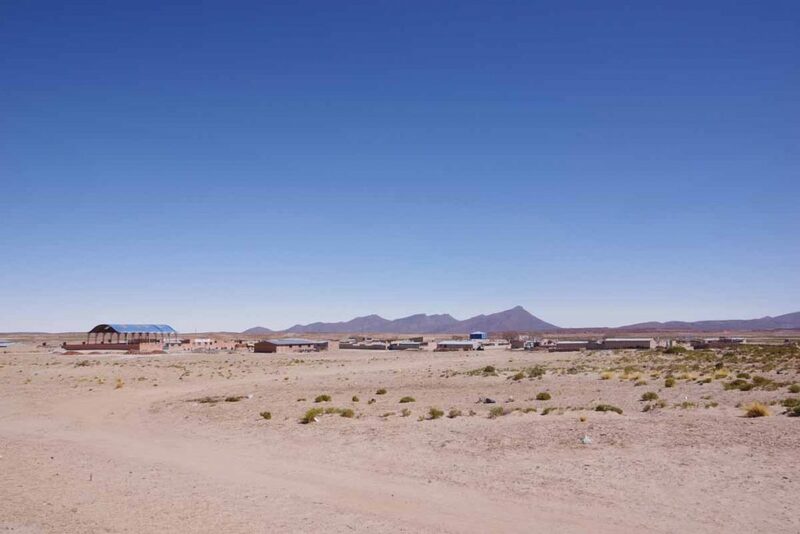 Not far from Oruro, there were all these small little buildings. I didn’t see many people associated with them. Quality has a name. 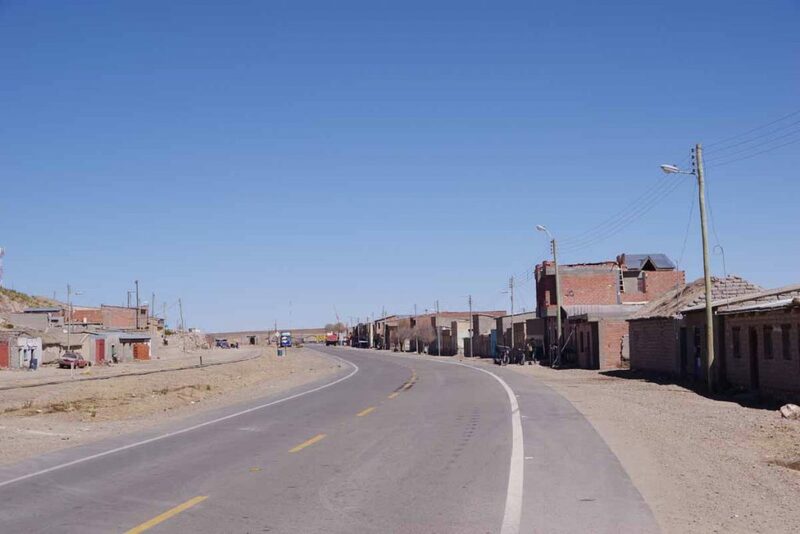 I haven’t seen any Ferraris in Bolivia so far. 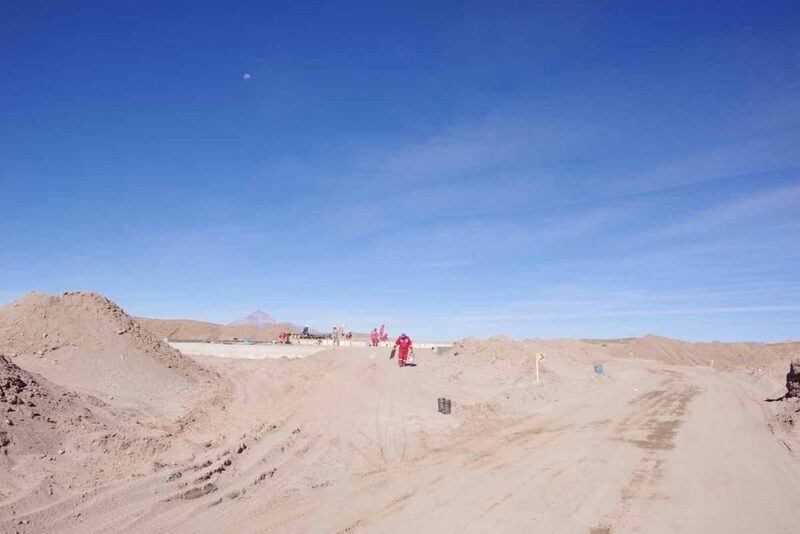 At 120km, I came to the mining helment which marked the start of Oruro. 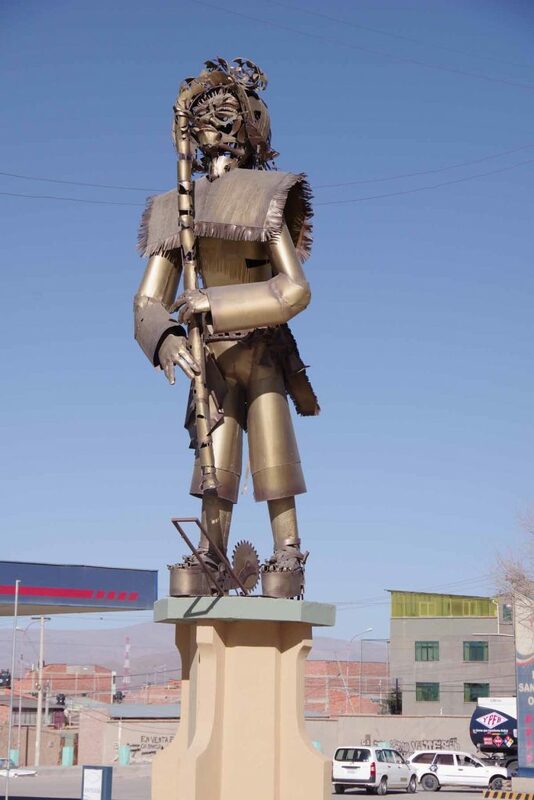 There were also funky looking statues along this road, mostly in this metal style. Eventually got to middle of town with many small narrow streets. I had picked out a hotel from other cyclists blog descriptions and was able to find it easily. About a block from the plaza. 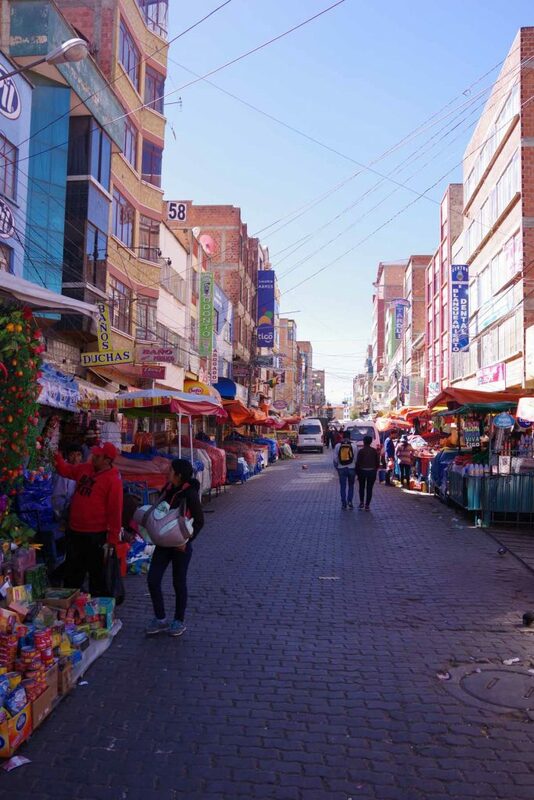 Unlike El Alto, the streets are busy but not completely packed. I booked a hotel for two nights. 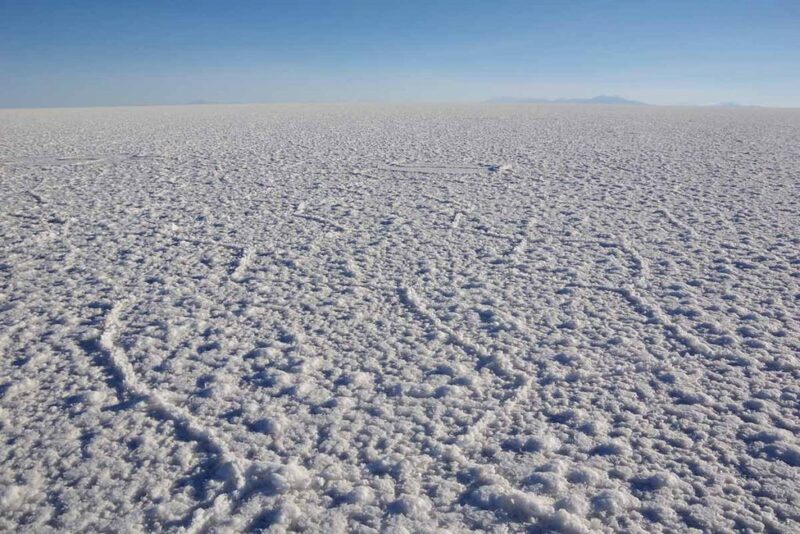 Now finalize the next days to the salt flats. 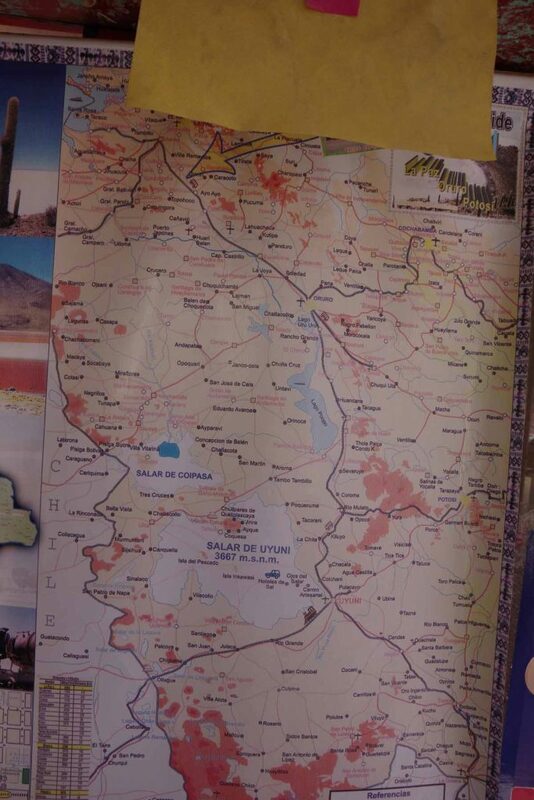 This map was hanging in Tholar on first these two days. 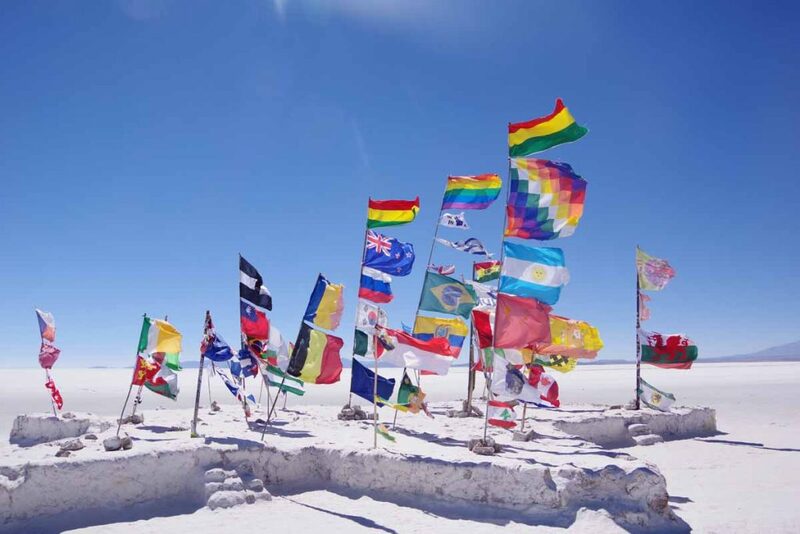 Salar de Uyuni is the largest salt flat. 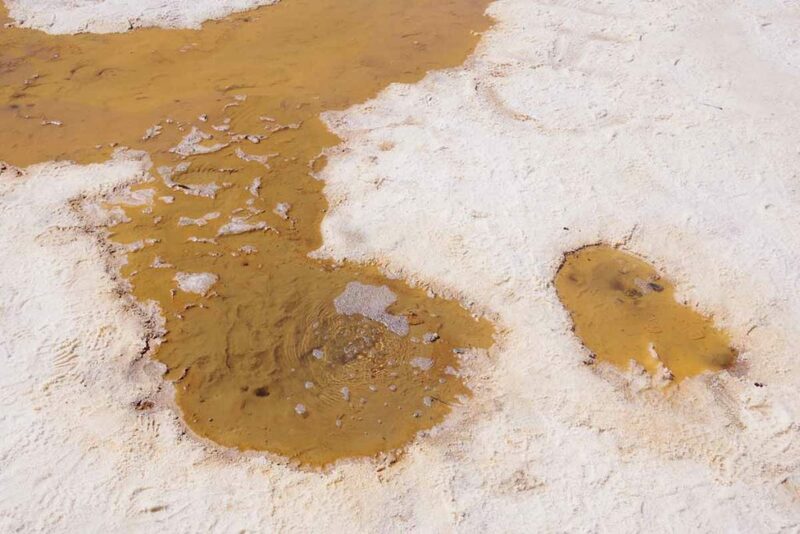 In the summer, after it rains parts of it are a salty lake. 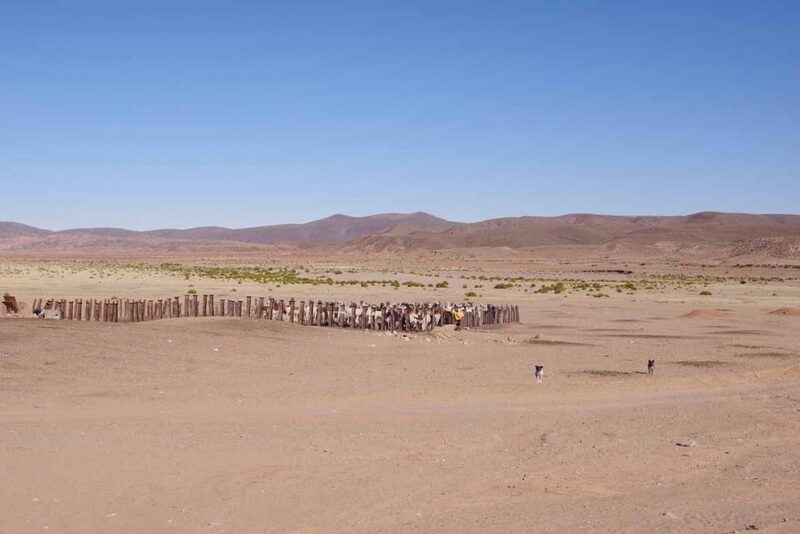 In the winter, the surface dries up and is possible to ride on top. 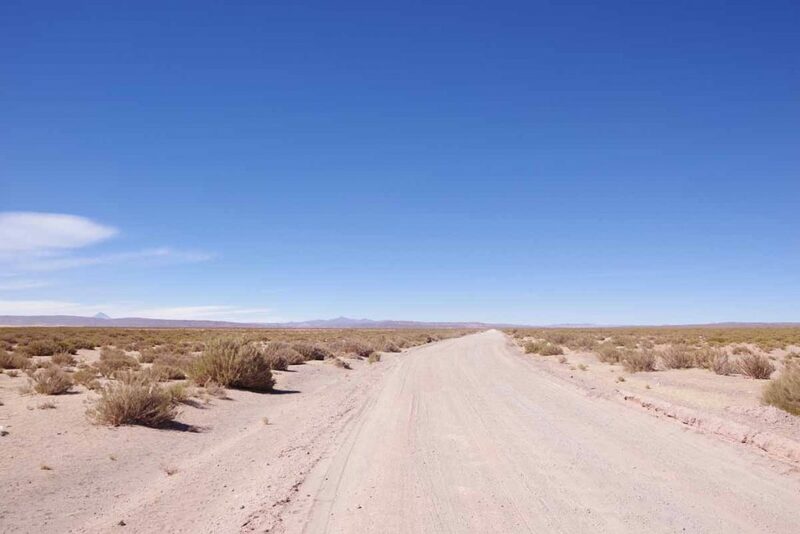 I will most likely cycle the main roads to the salt flat and then take one night to ride out and camp ways out. A ride from quiet lakeside roads to the middle of a busy city. 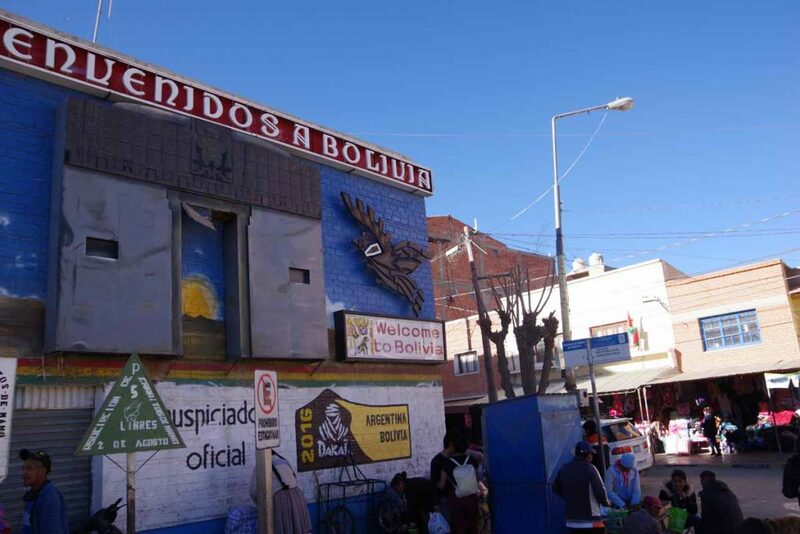 Today I made it to Bolivia’s second largest city, El Alto. 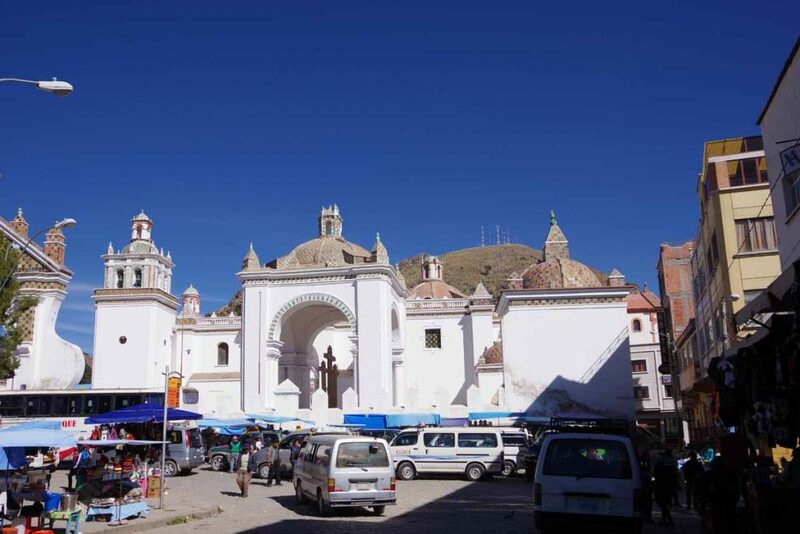 Interestingly, La Paz, the capital, is the third largest city. 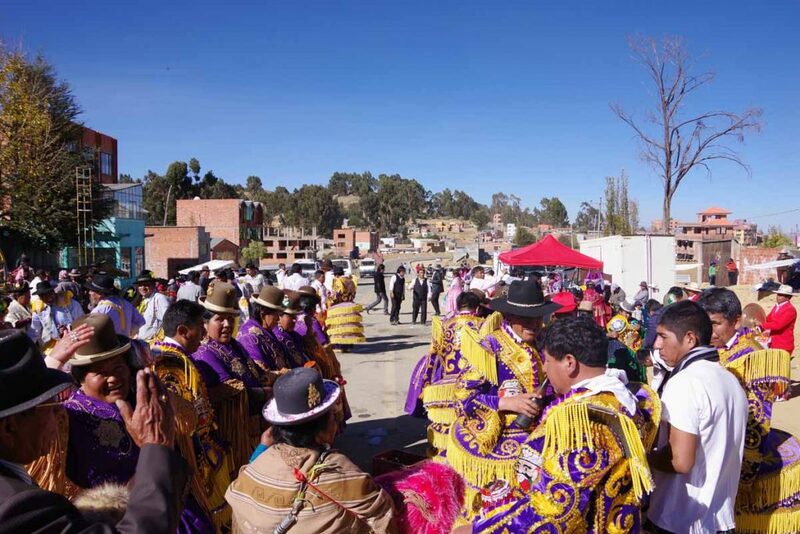 La Paz sits in a deep canyon with El Alto on top. 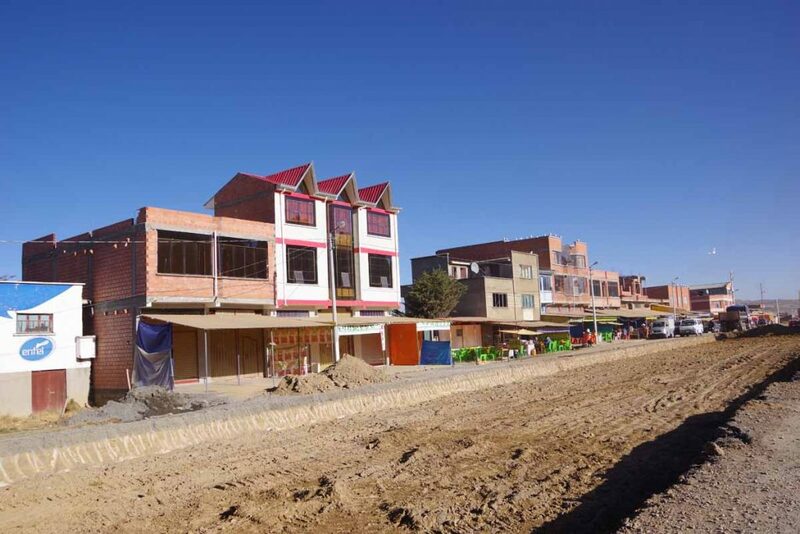 Supposedly, the wealthier neighborhoods are lower down, where it is warmer and poorer neighborhoods up top in El Alto. 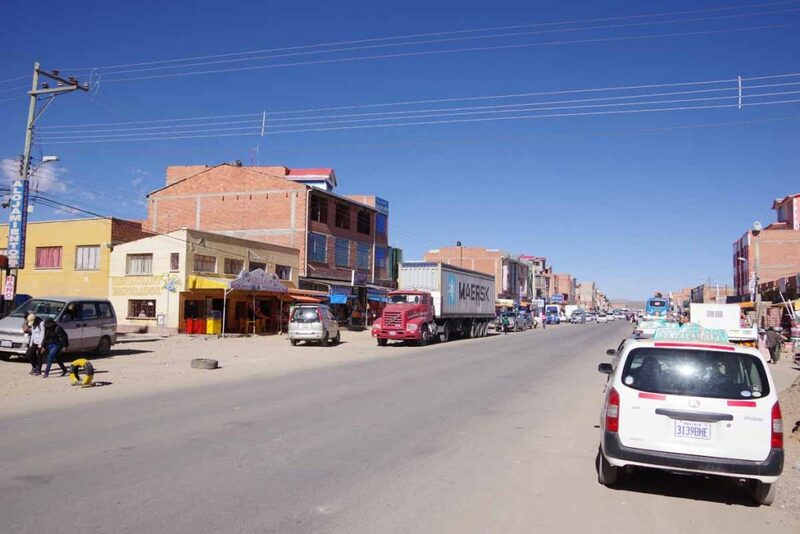 I decided not to drop into La Paz since the main road south continues on from El Alto. Descending ~300m/1000ft into the middle of a busy city only to ride back up again isn’t strictly necessary. This morning continued on the road along the lake. 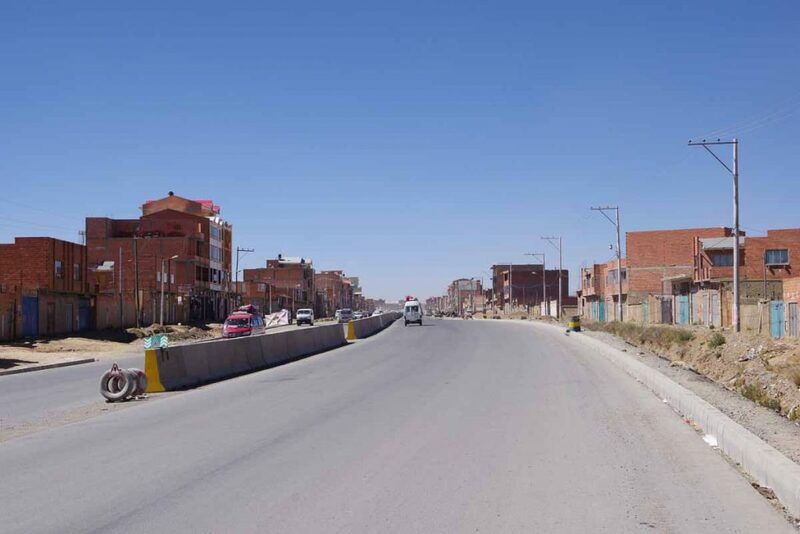 It was still being expanded to four lanes and this first town showed some of the construction zones. After this, the road expanded to four lanes. 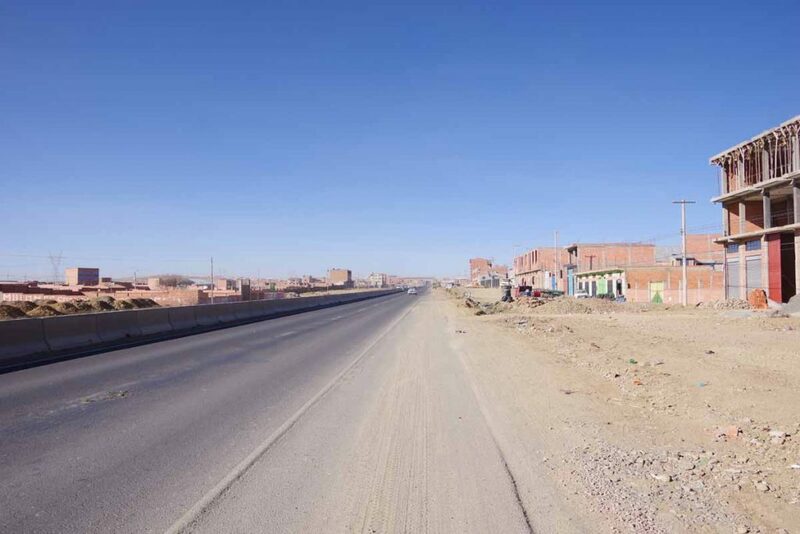 I was pretty much on this large four lane highway until outskirts of El Alto. Traffic progressively got busier, but never too bad on the highway. The shoulder had some debris so I would also ride on the white line as well. It was Sunday and I could tell this was a church from music coming from within. A new verb to look up, “girar” or to turn. 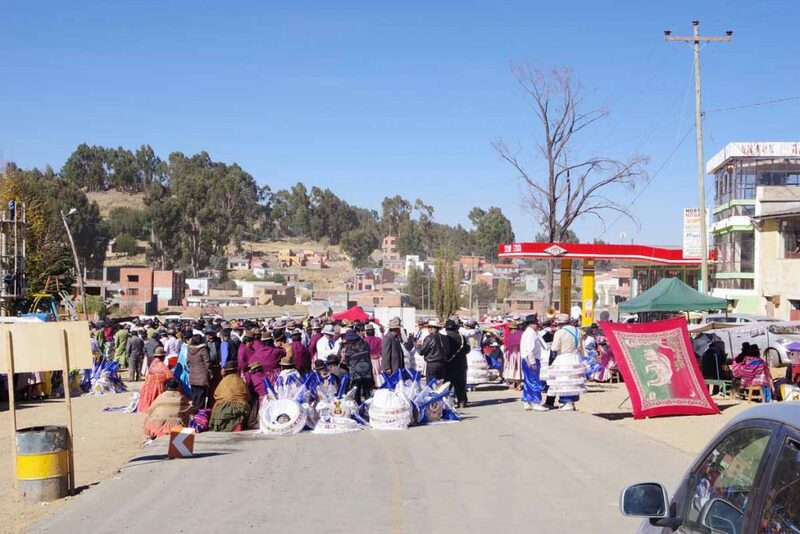 El Alto started simple enough, this was about 10 kilometers from the center. 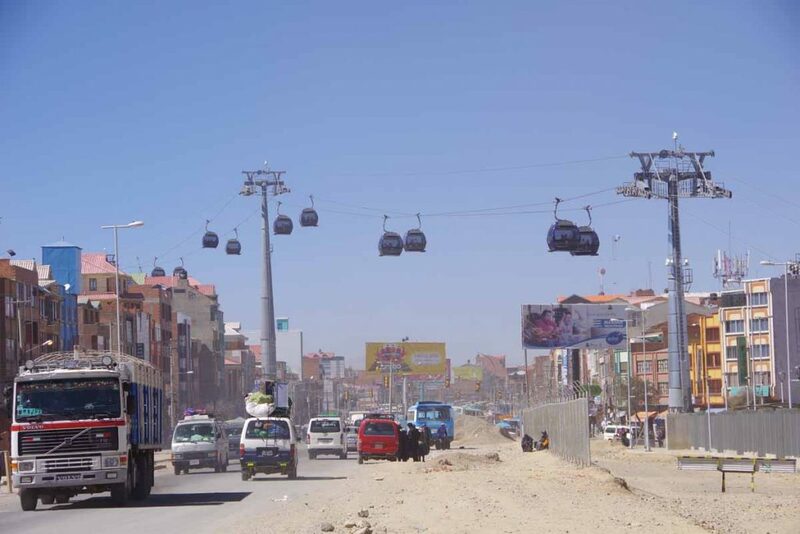 There is a cable car system that goes between La Paz and El Alto. 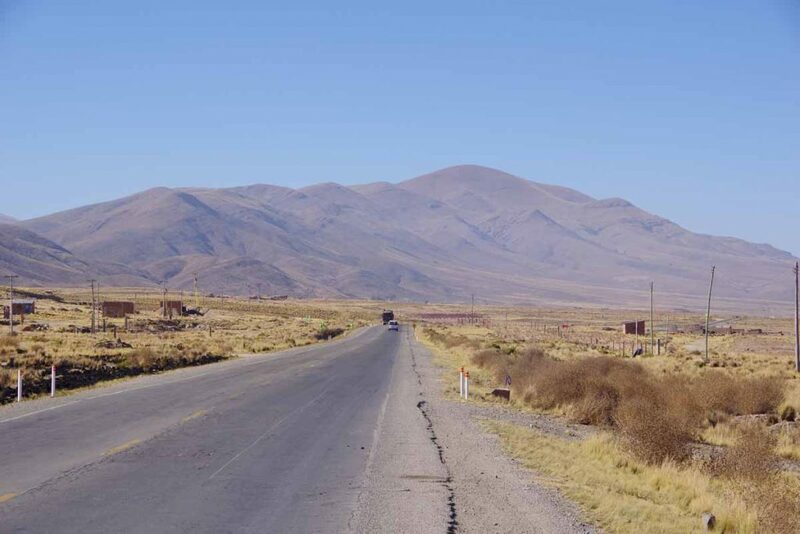 This was about 5 kilometers from the center. The road had gone through multiple construction zones and now got to the zone where all the little vans keep trying to dart to the right for passengers and then come left again to get around all the other vans that are still stopped. Rather chaotic, though it also keeps the speeds down. The trick is to figure out where to ride. Too far right and you keep having to wait for the vans to clear. Too far left, and you are dodging the other traffic. Made it to the middle of town and found a reasonable hotel. 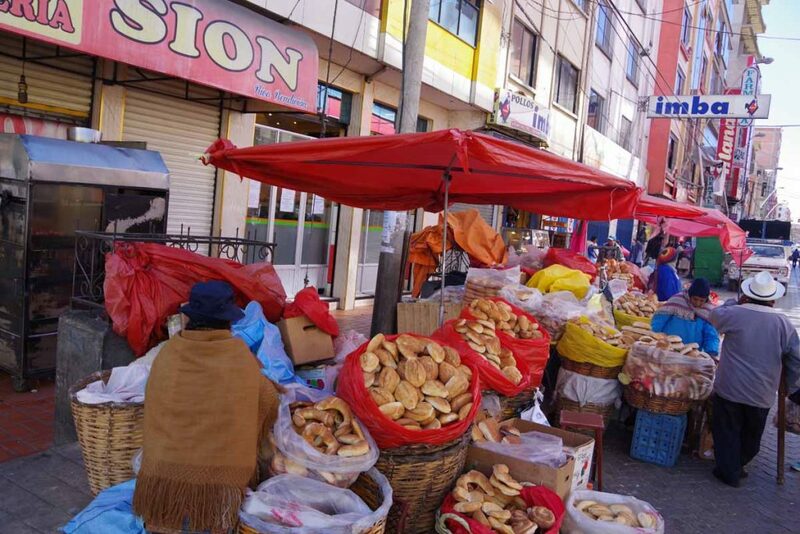 All around are market areas. Lots of fruits. I bought one from an older woman who was busy eating her own wares. A friend/family member next to her helped work out the cost and change. Nice to be in a big city with all the shops out on the street since the little hamlets I’ve passed on the road don’t seem to have much. Beautiful ride today along the lake. Copacabana was a nice little tourist town. 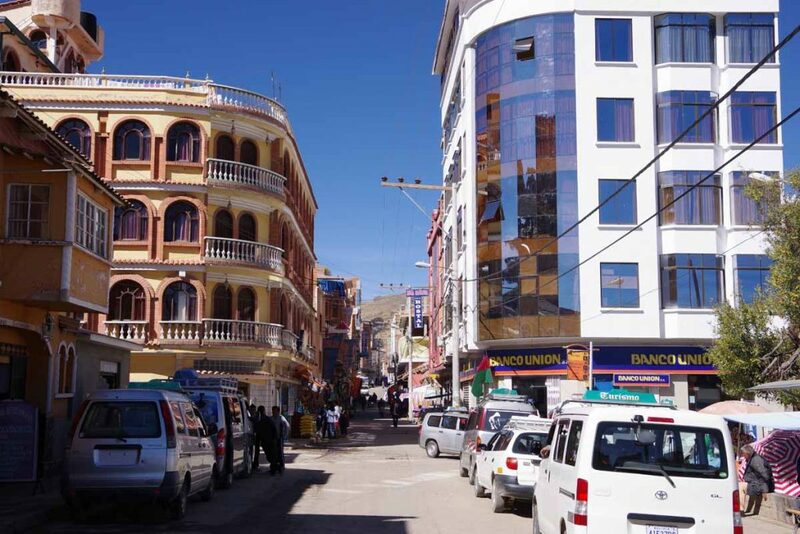 Lots of restaurants, hostels and shops. This is jump off point to Isle del Sol and Isle de Luna islands. This had a great breakfast in the hotel. It was almost tough to leave, particularly since I expected it to be cold and knew I would start with a 1500ft/350m climb. However, it was warmer than expected and overall the day was beautiful riding with great views. A view on one side of the “little” lake. A view from the other side across the “big” lake. 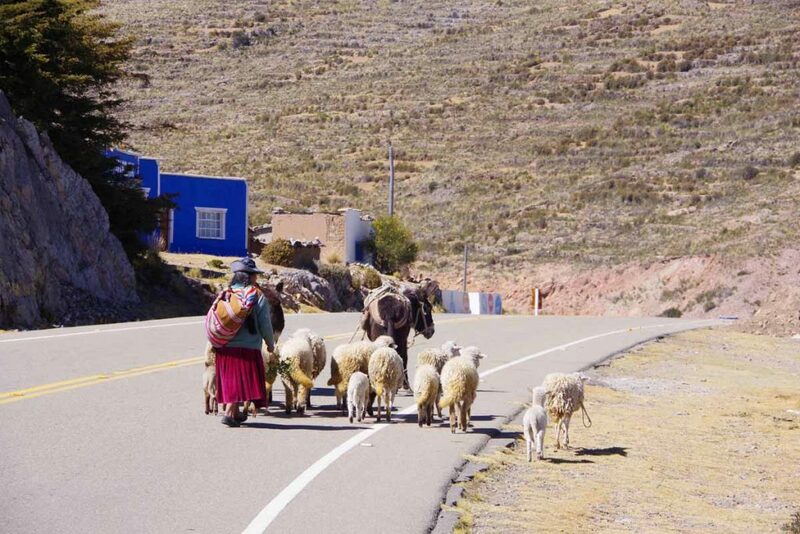 Traffic on the road today. 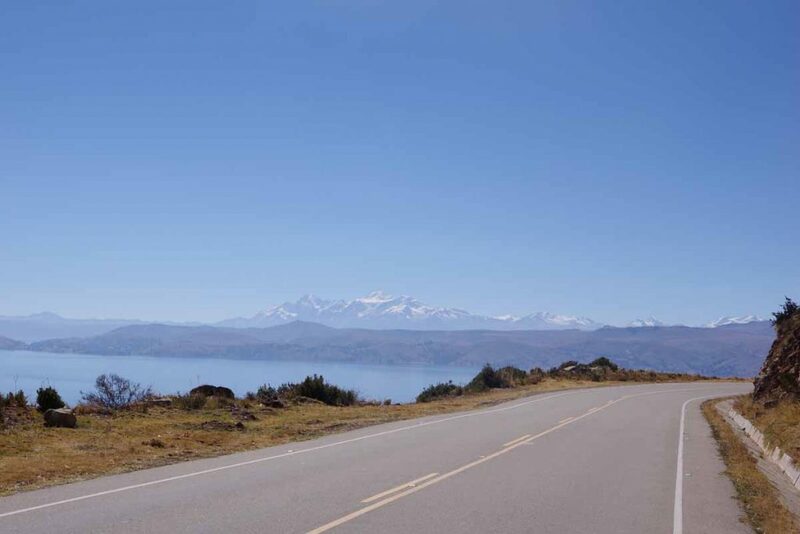 At 40 kilometers I descended down to the straight that separated the big and little lakes. 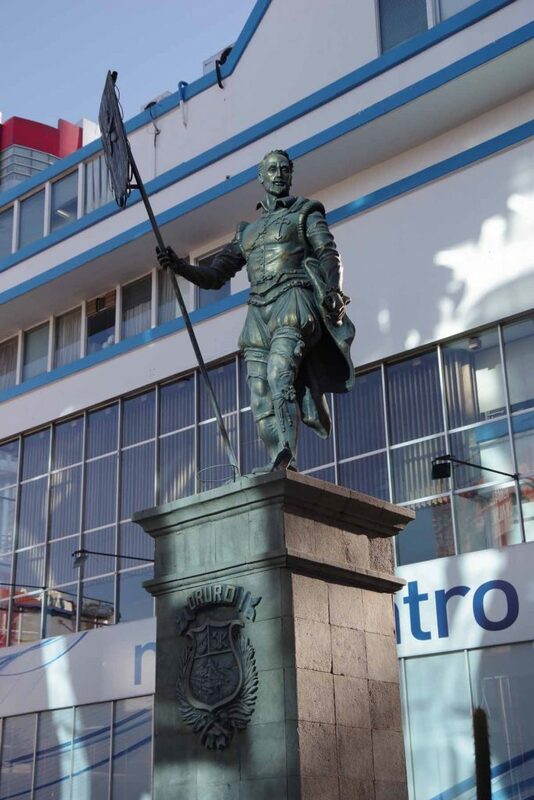 One one side was San Pedro and the other was San Pablo. 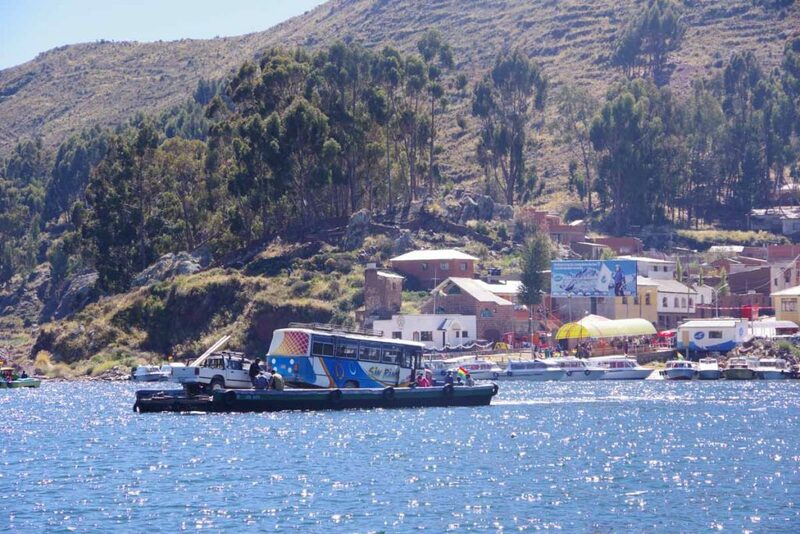 There were these barge boats that would carry one large vehicle like a truck and a smaller vehicle as well. 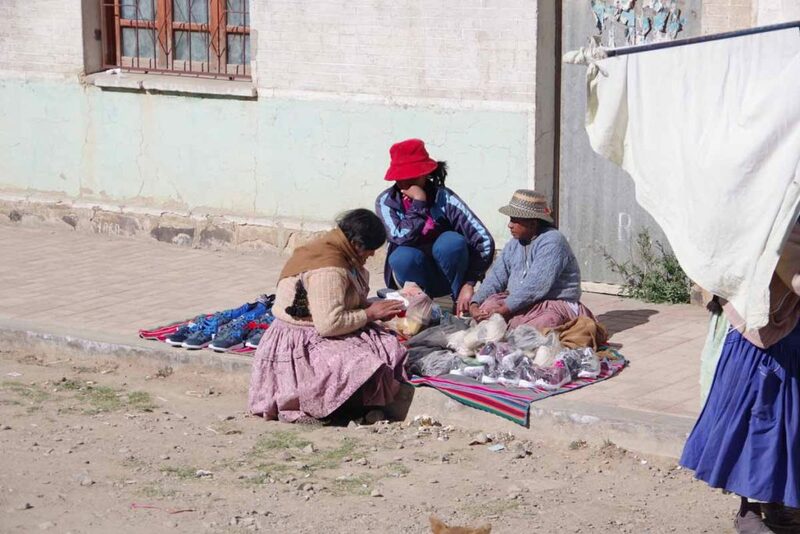 I boarded on one with a big truck, a small van, a Bolivian woman in traditional clothing and myself. We had to wait until the van was found to complete the load and then a slow ride across the channel. On the other side, stopped and had lunch before continuing. 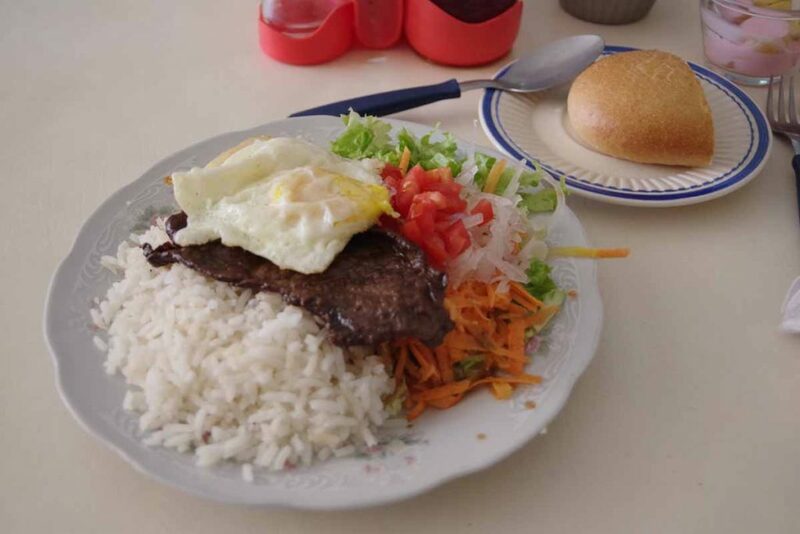 A common lunch here is “trucha”. I have heard it translated as “trout” but then still get different fish. 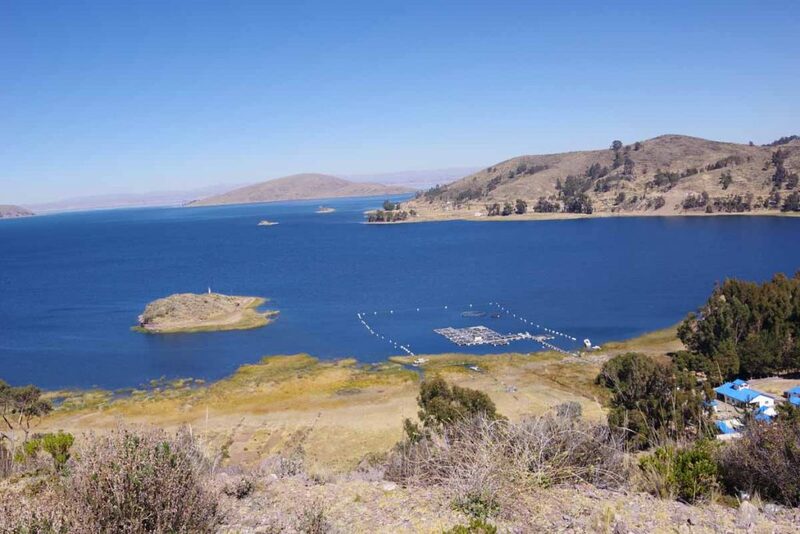 I was also told in Puno on our tour that the Canadians are to blame for introducing trout into Lake Titicaca in 1949. It is not a native fish. From the straights, climbed back up the hill, though not as far. 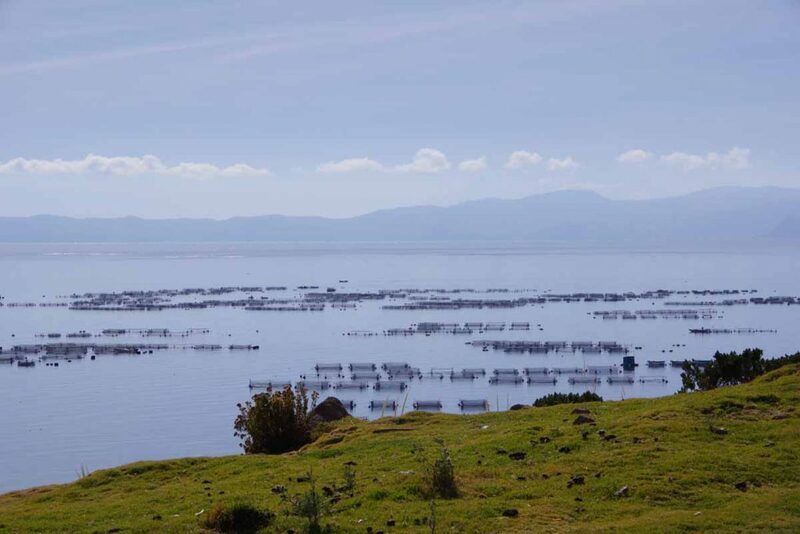 This was view down on what looked like a fish farm. Small church along the way. Oops, missed a sign, the road was completely closed off for a street festival. Friendly folks. I think I was offered a beer at least four times as I slowly walked through the crowd with my bicycle. Not long after passing the festival, I found a hotel. It was slightly upscale, but otherwise reasonable place.